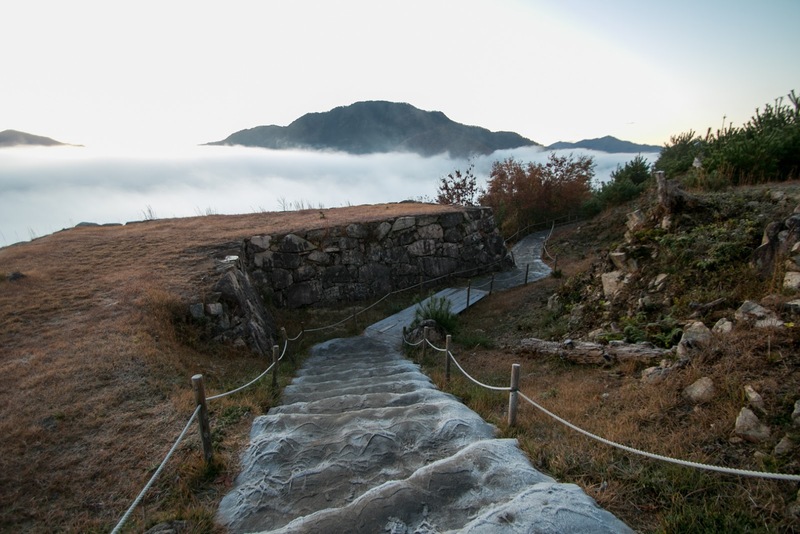 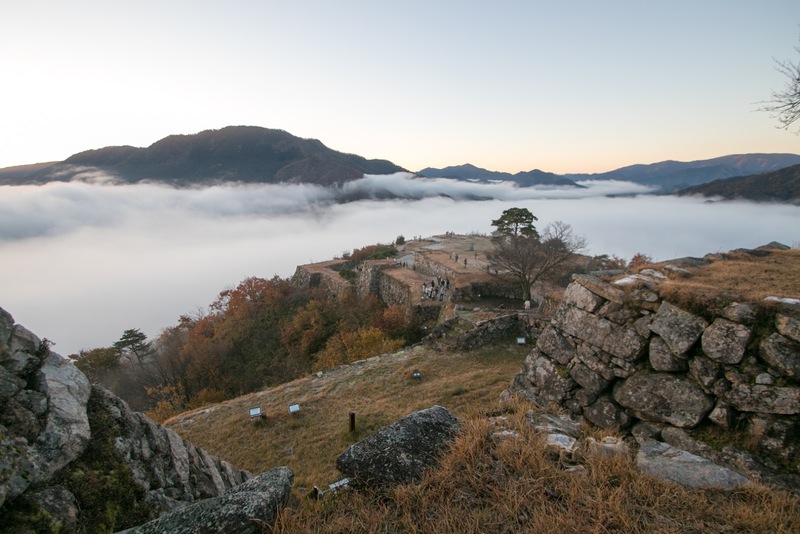 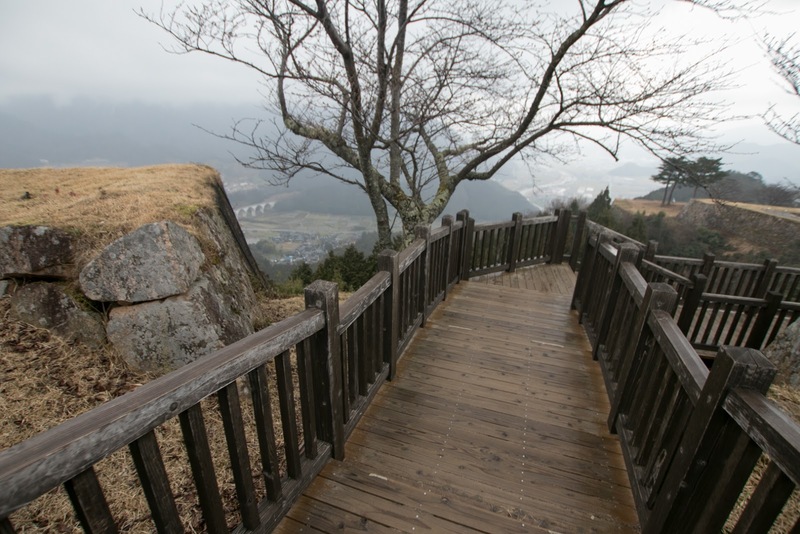 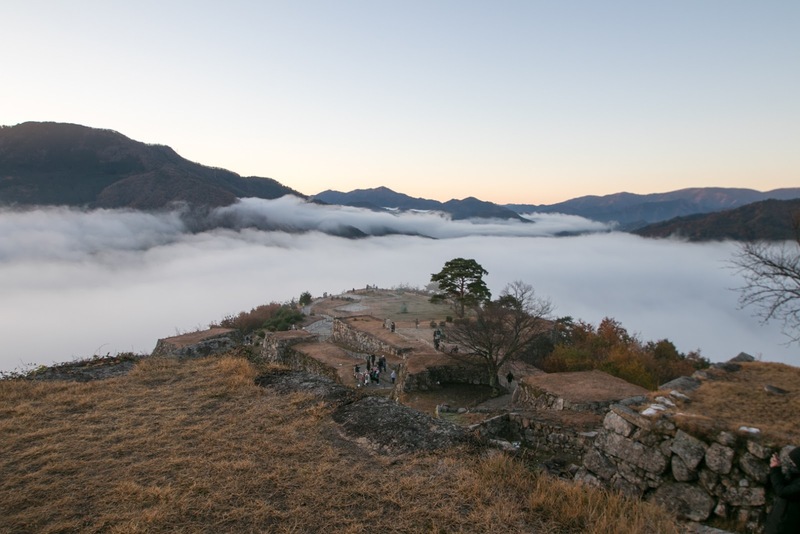 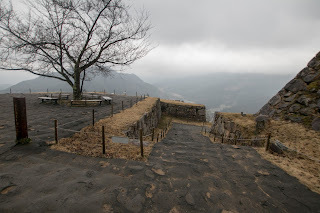 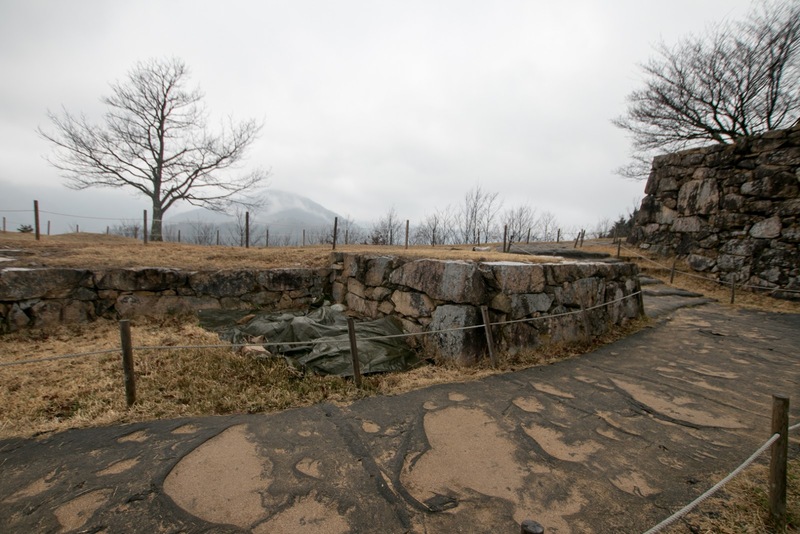 Takeda castle (竹田城) is located on the Shiroyama mountain in Wadayama town, Harima province (north part of Hyogo prefecture). 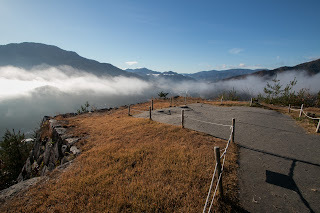 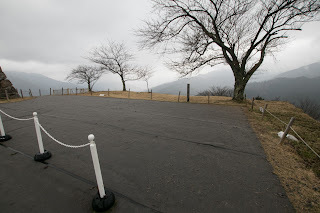 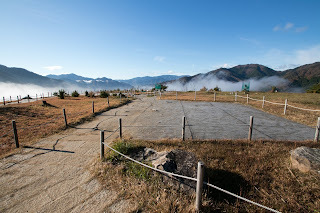 This place is a strategic point where Sanindo road comes from Tanba province (Kyoto prefecture) to Inaba province (eastern part of Tottori prefecture) meets road from Harima province. 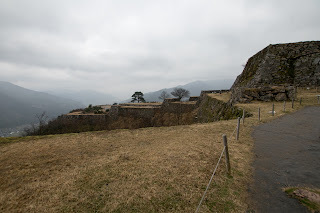 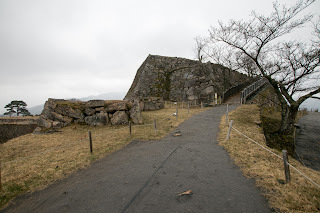 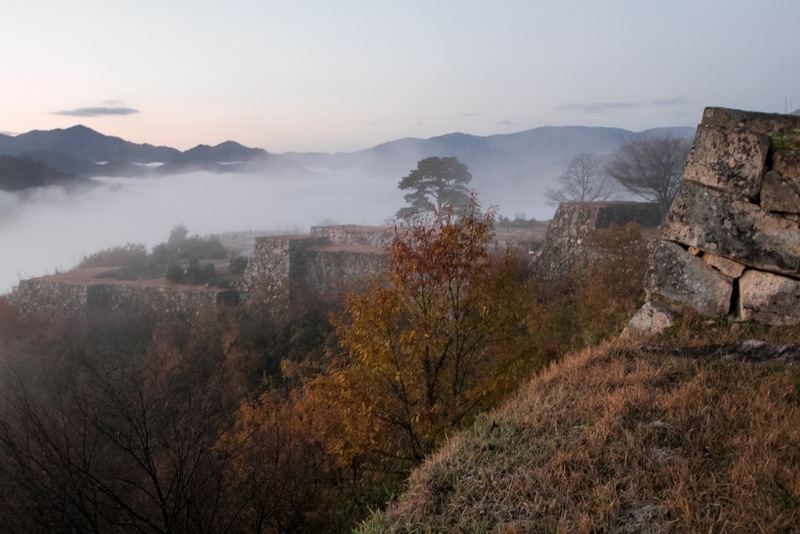 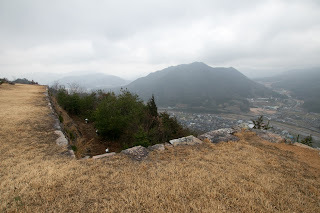 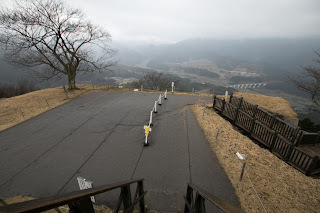 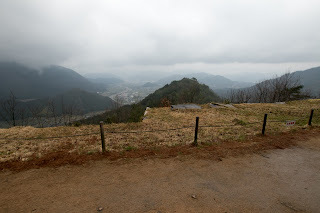 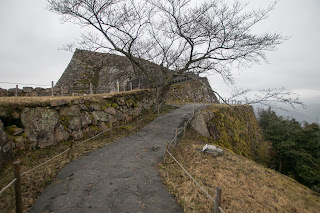 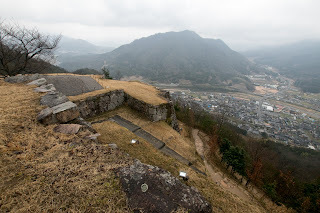 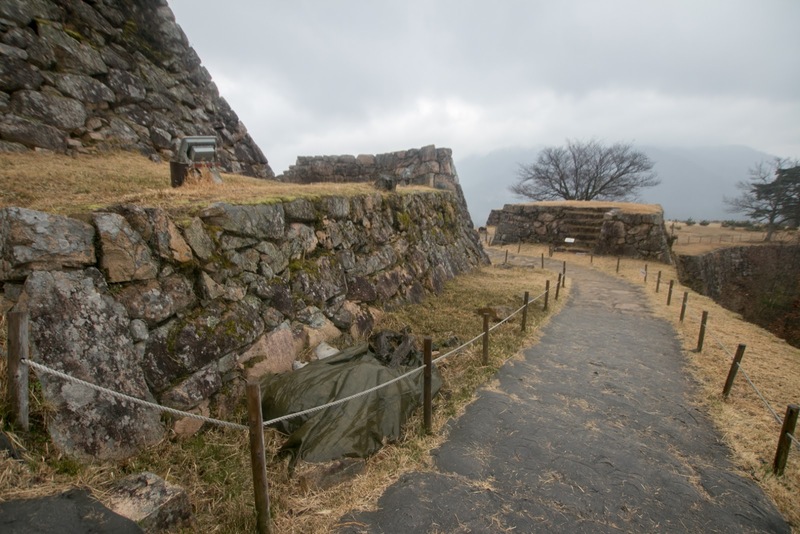 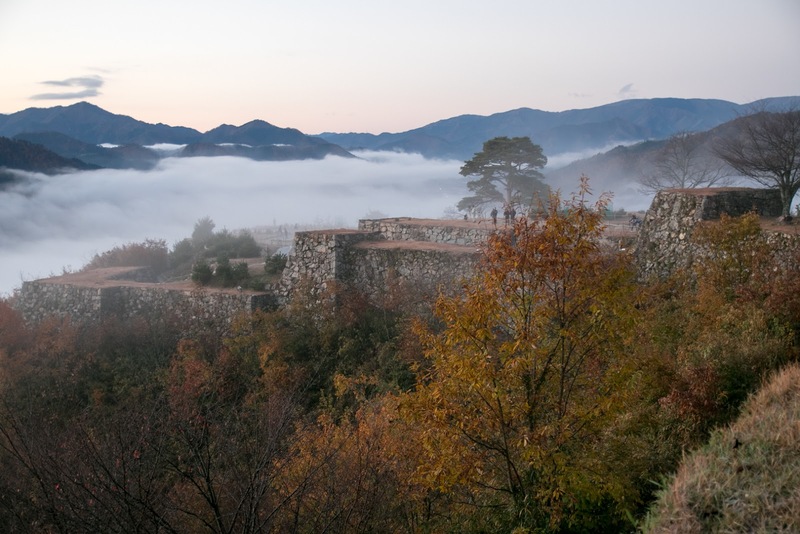 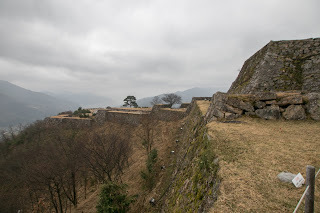 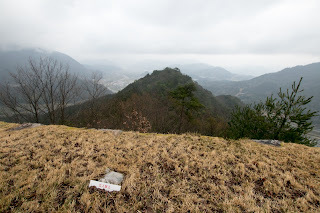 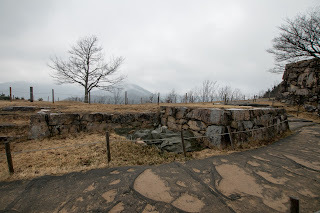 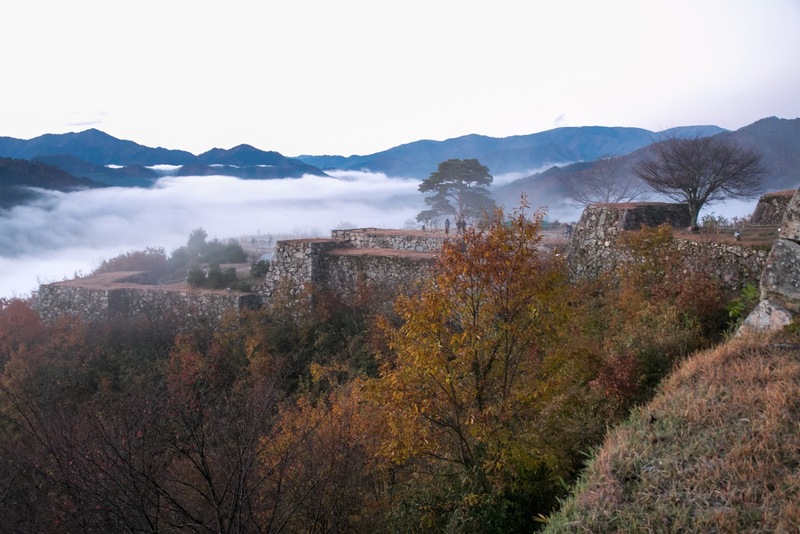 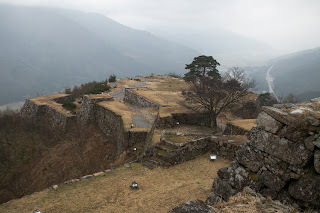 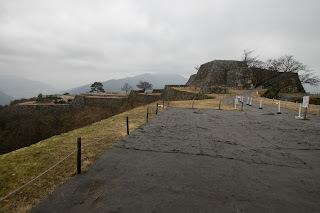 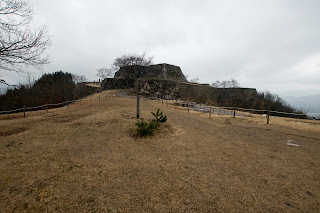 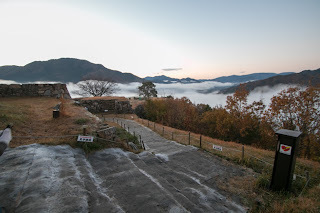 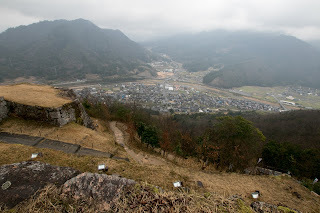 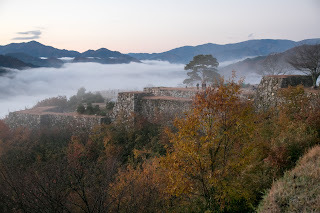 About 10km south of this castle there was Ikuno silver mine, one of the largest mines in Japan, and another purpose of Takeda castle was to protect this mine. 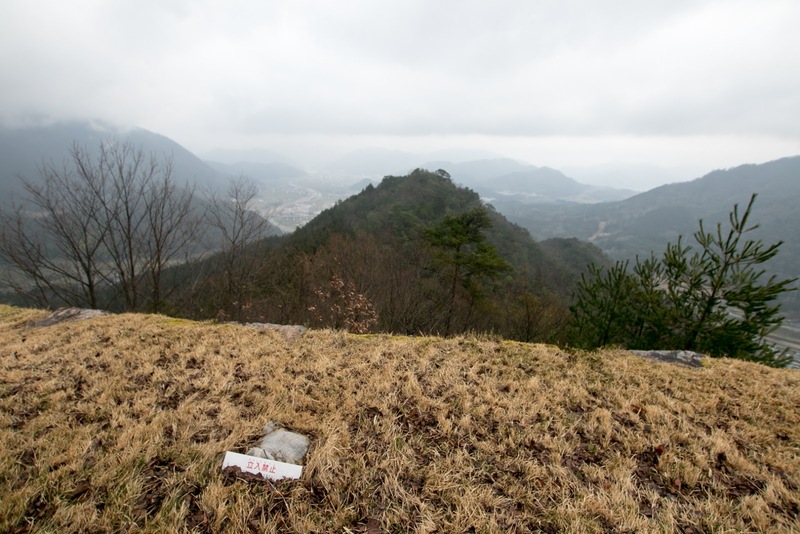 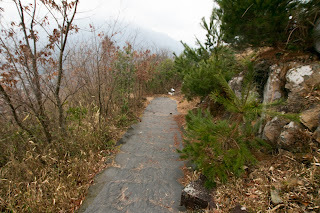 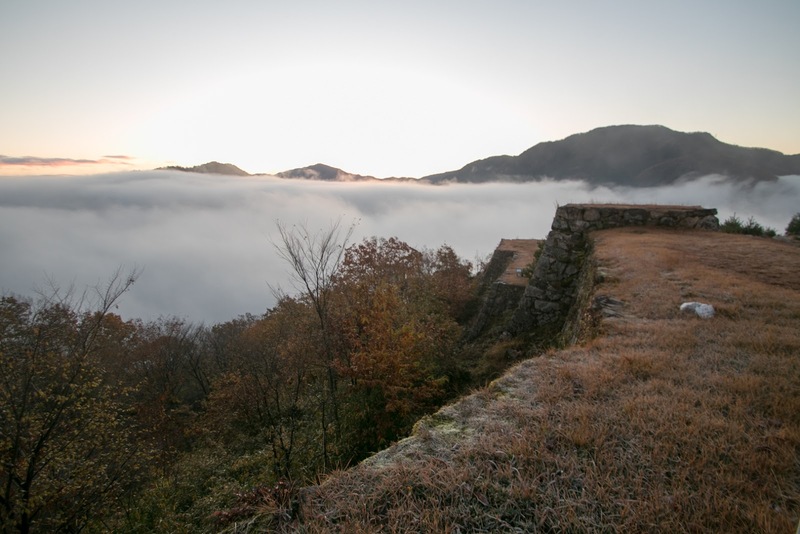 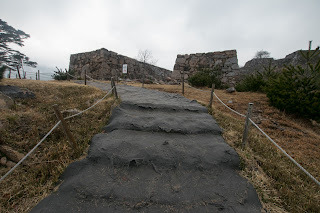 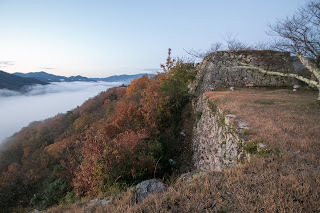 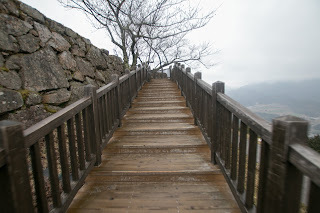 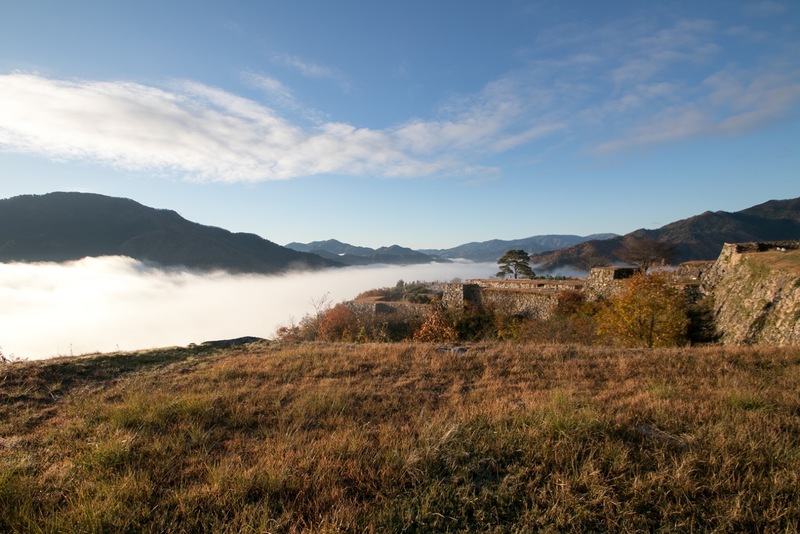 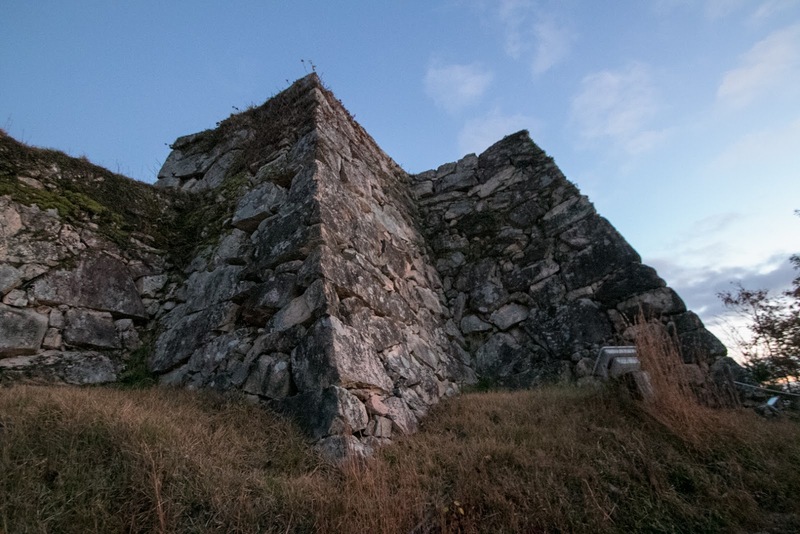 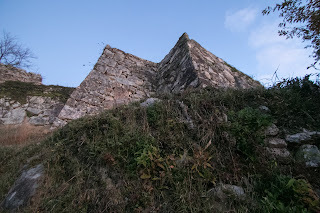 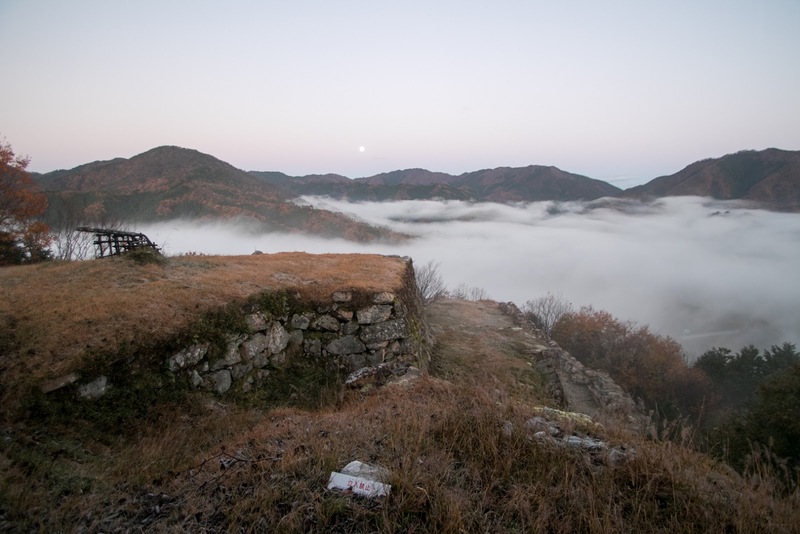 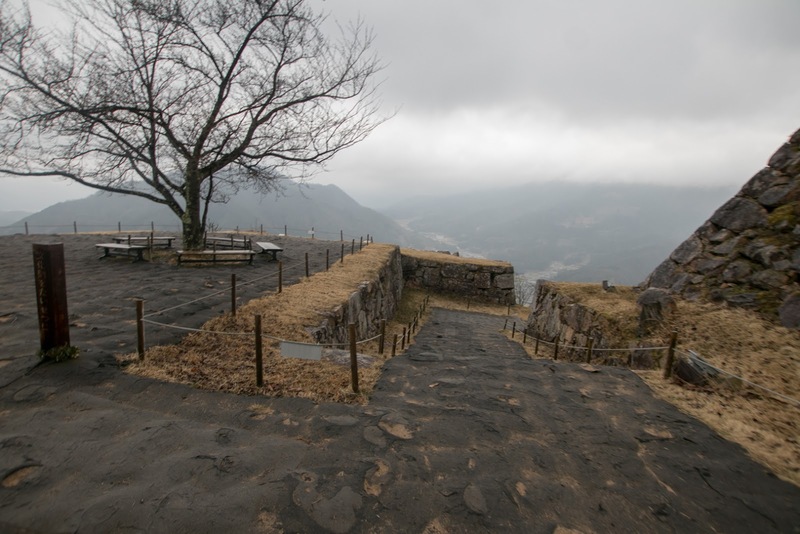 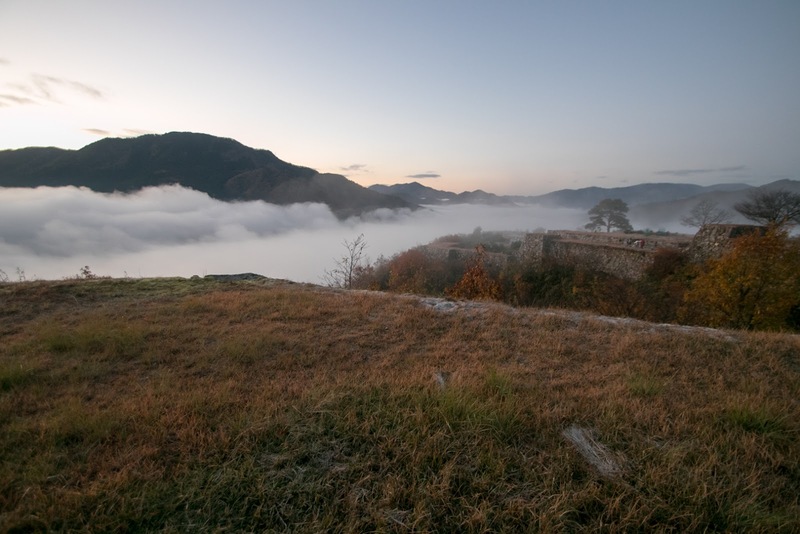 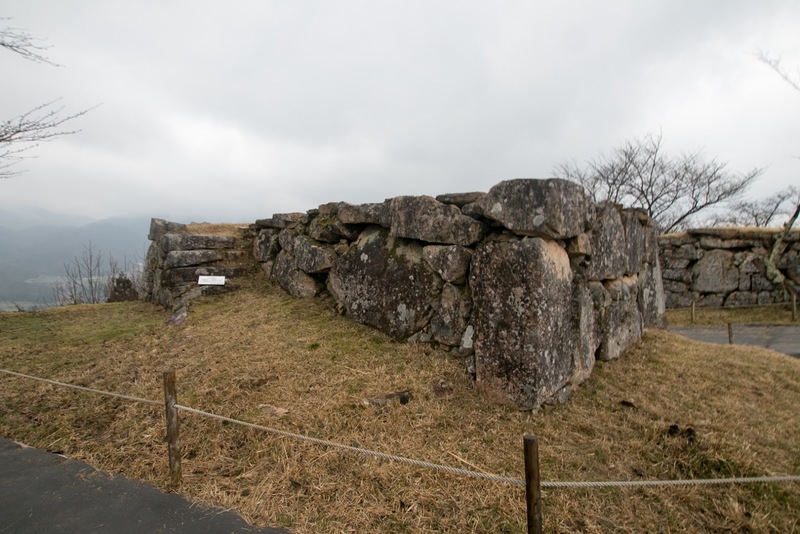 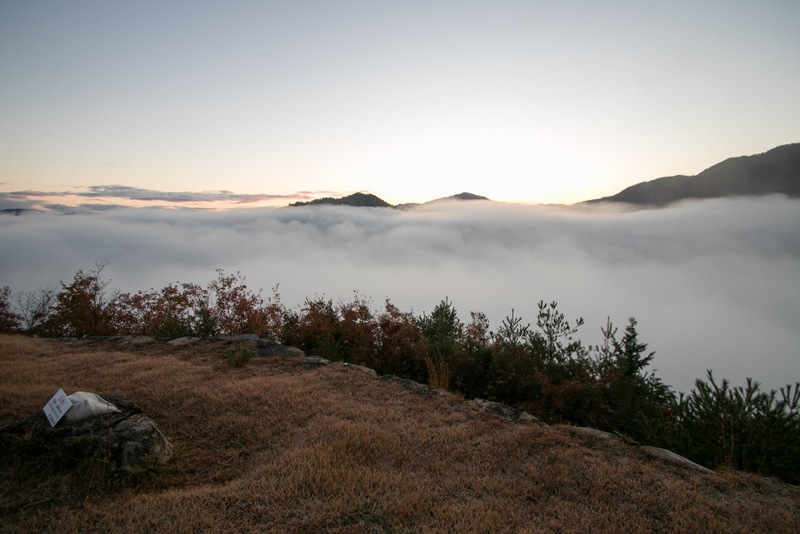 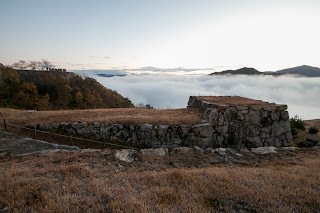 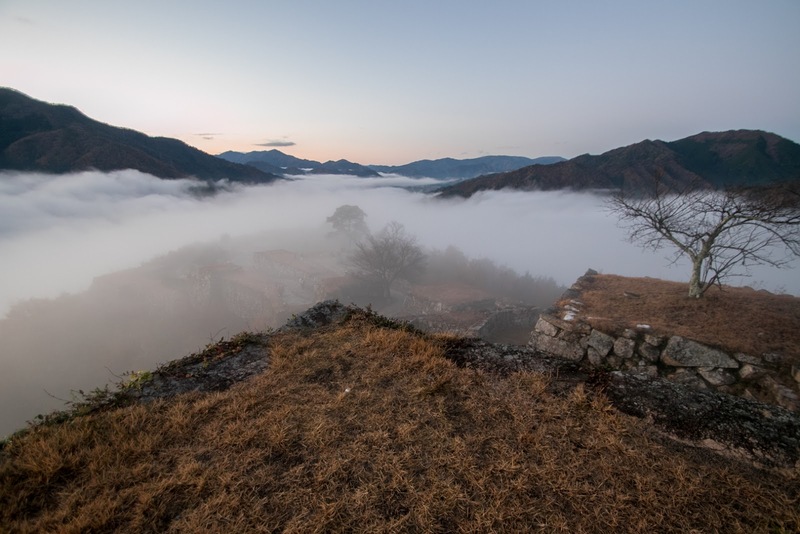 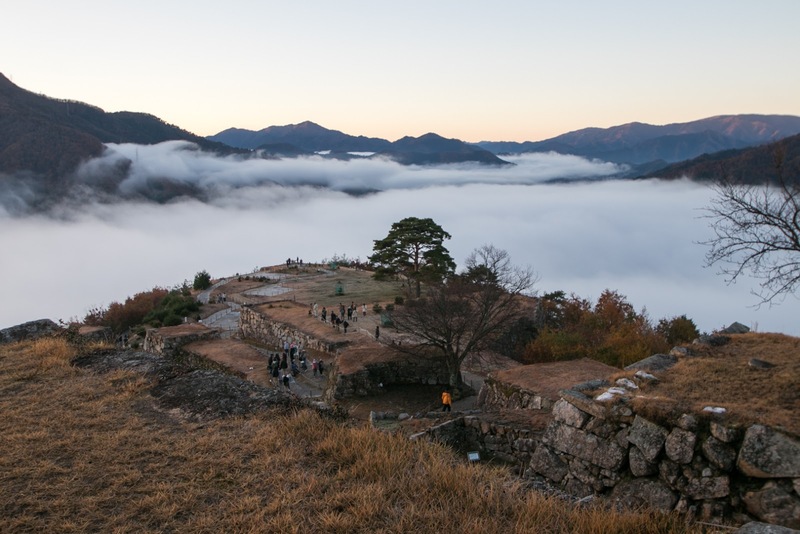 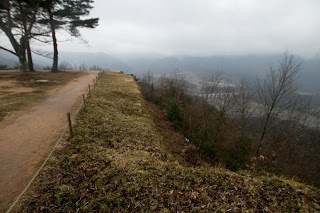 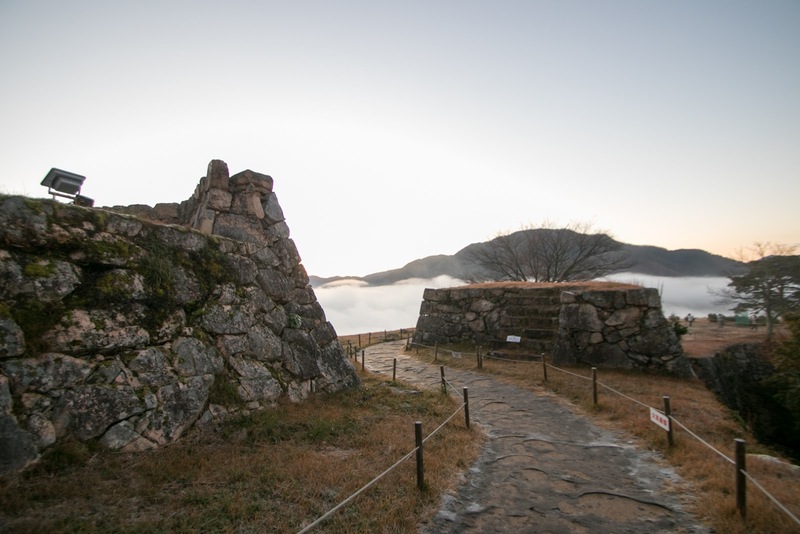 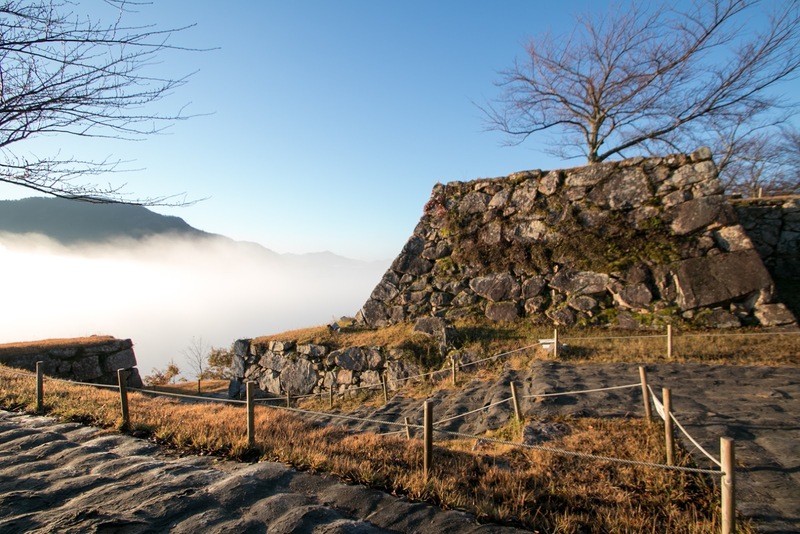 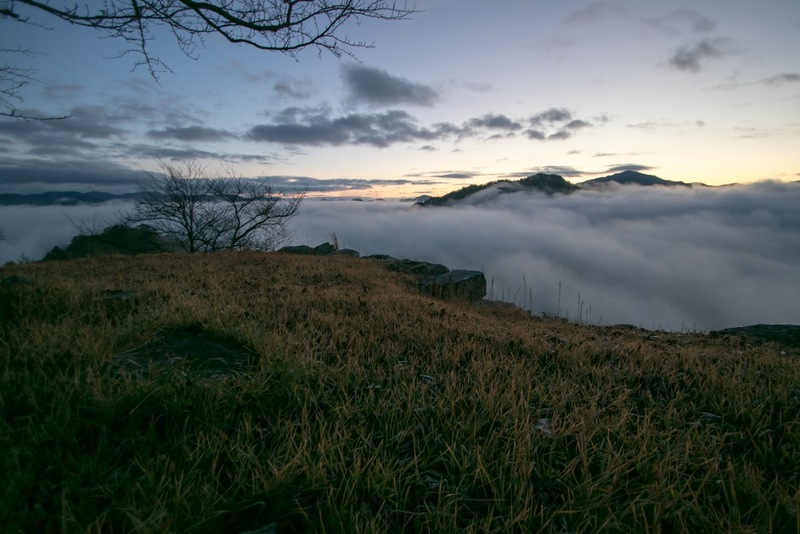 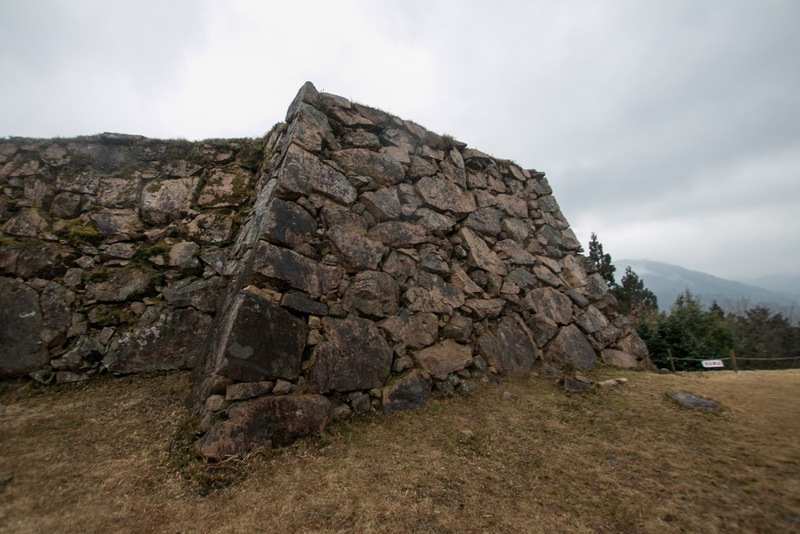 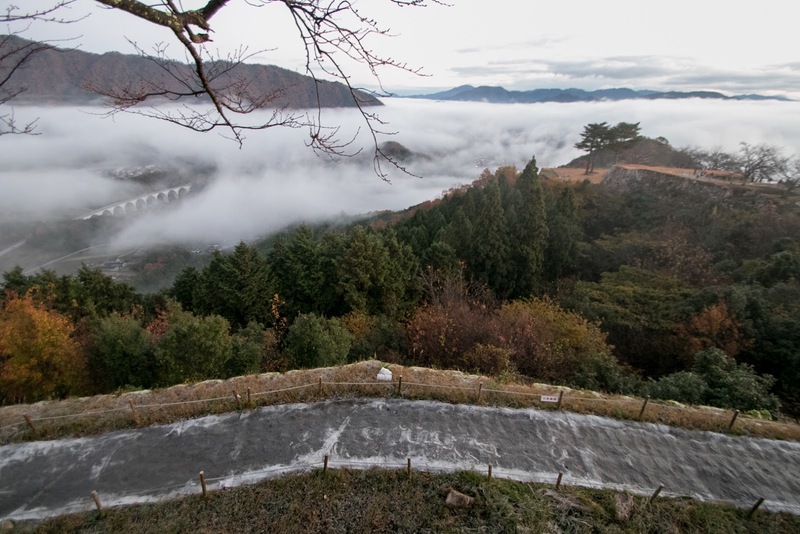 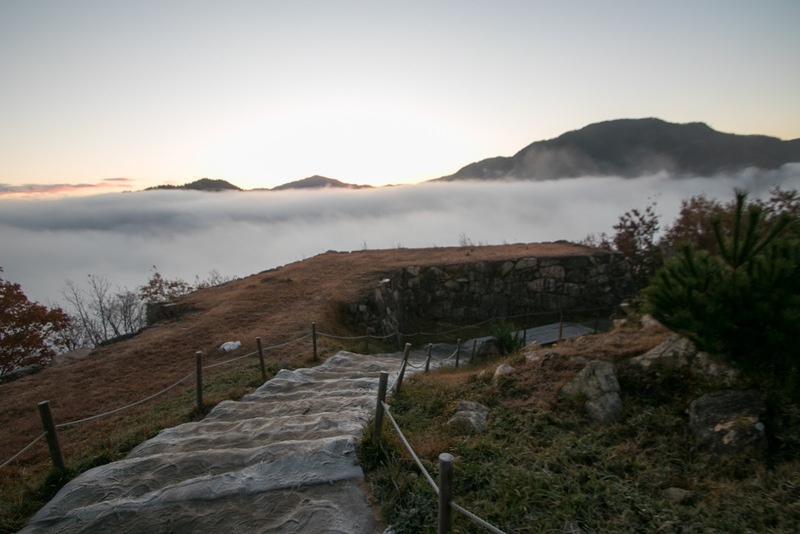 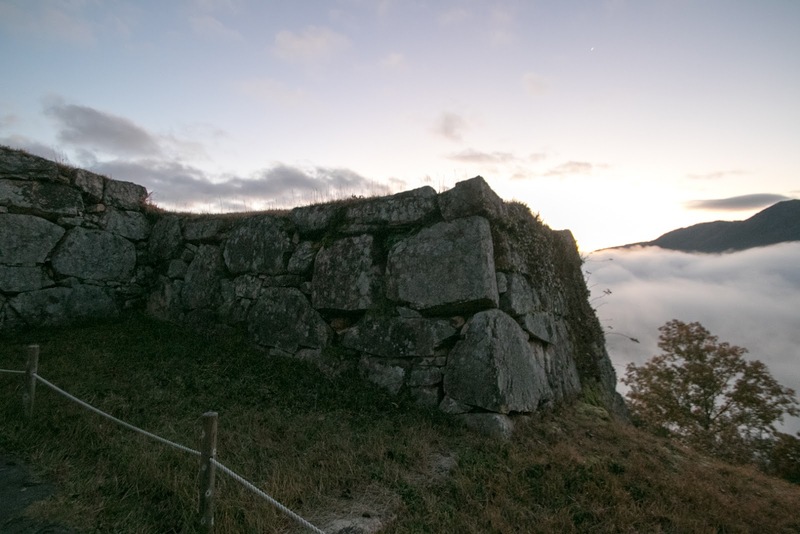 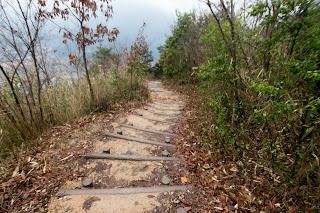 Although there exist no building, ruins of mountain castle at period of completion remain well on steep mountain of about 350 meter high, and it is called as "Castle in the sky". 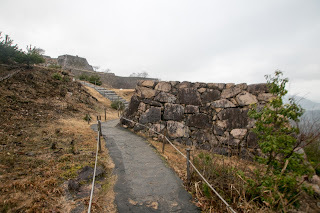 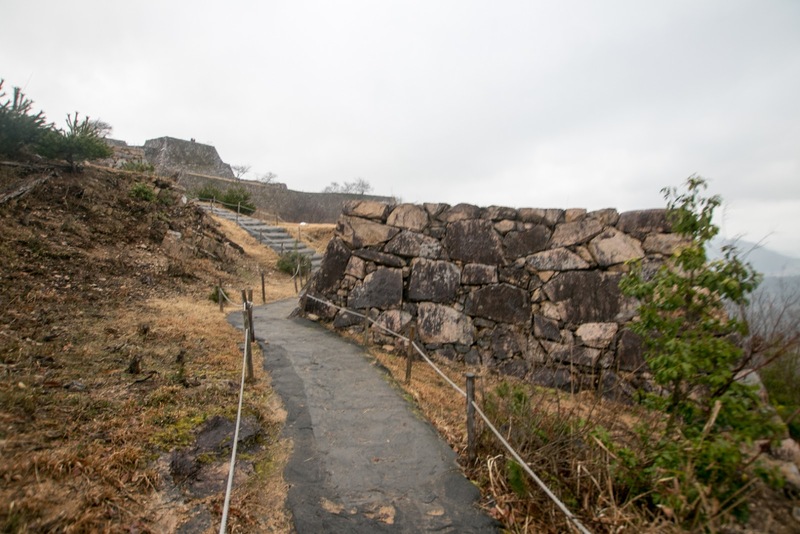 Besides, due to its shape consisted of layers of complex shaped terraces, this castle is often called as "Japanese Machu Picchu". 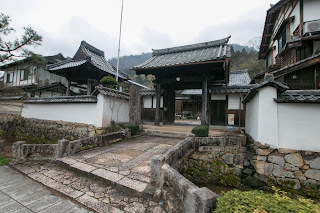 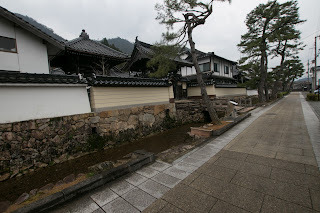 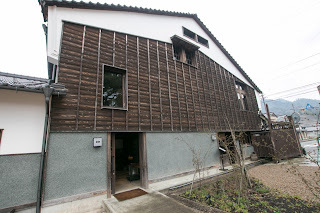 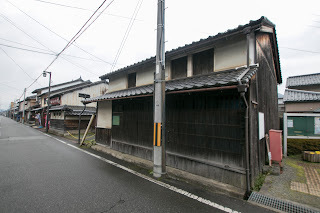 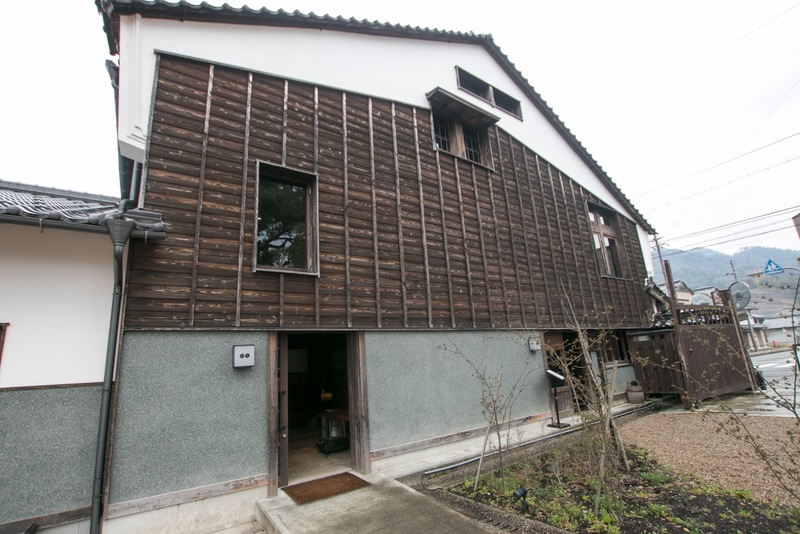 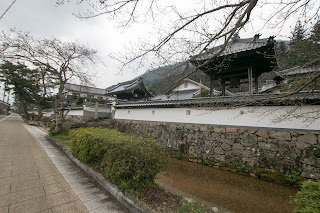 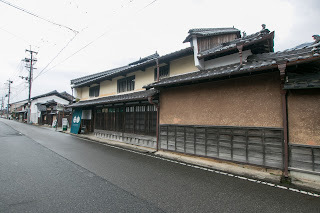 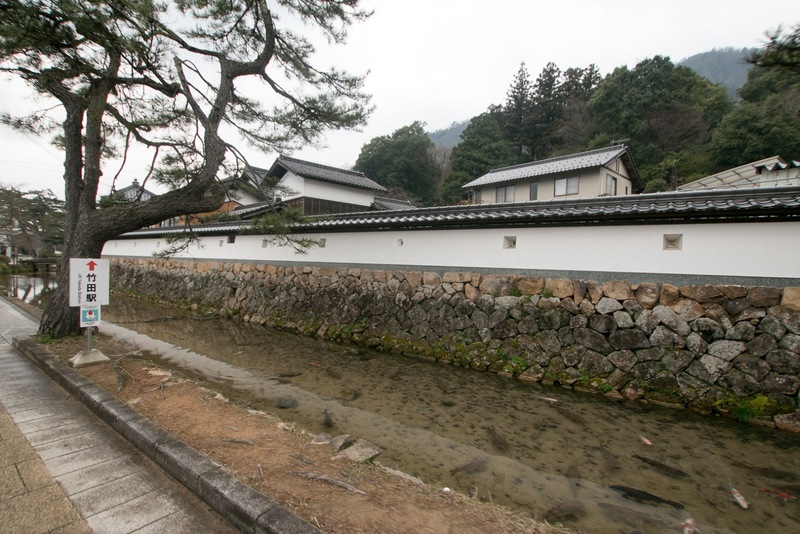 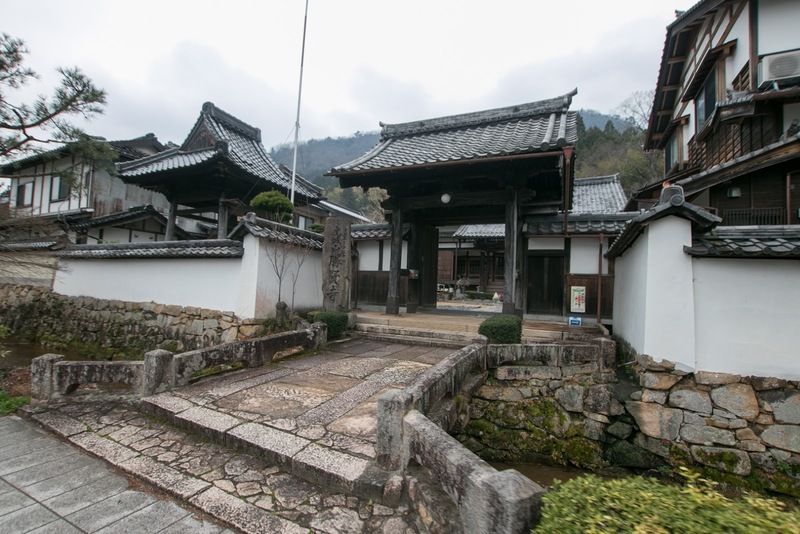 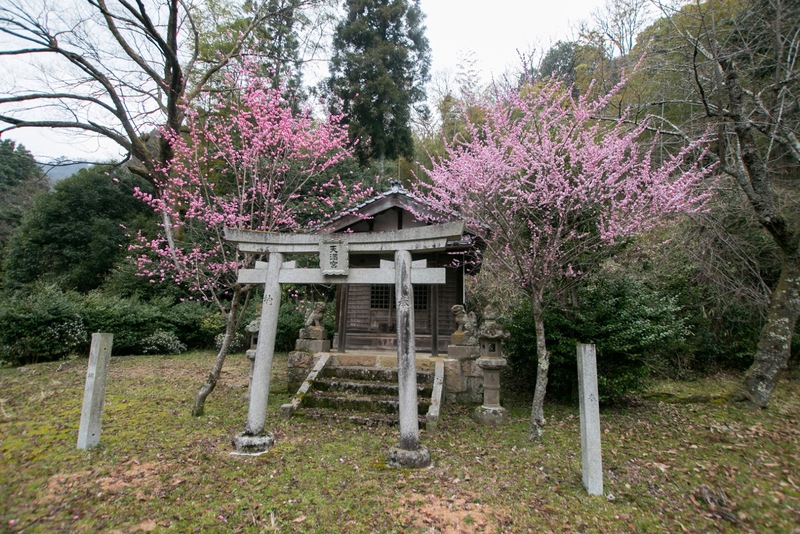 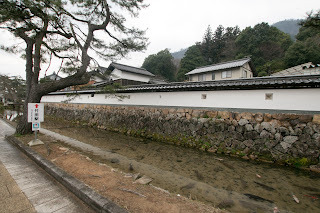 In medieval era Tajima province was governed by Yamana clan, Yamana clan was a house of Shikken, the second highest rank of retainer in Muromachi shogunate,. 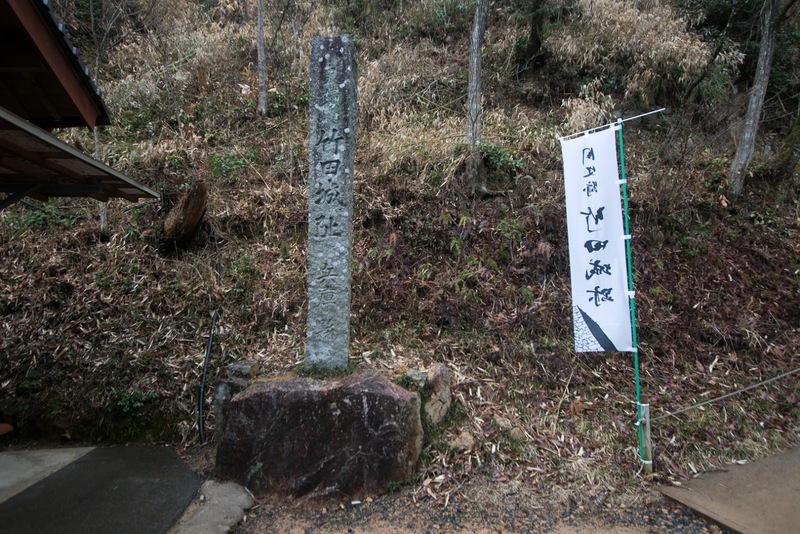 At the beginning of Muromachi era Yamana clan was a governor of many countries, and said as “Lord of one sixth of Japan”. 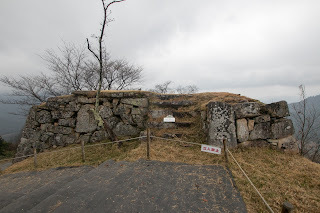 At the War of Onin, a large internal conflict continued over 10 years, Sozen Yamana (1404-1473), current leader of Yamana clan, was served as a cheif of one side. 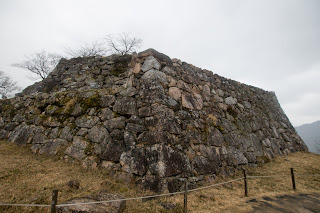 But the power of Yamana clan significantly decreased after the war, and later only held several country of Sanin area and faced pressure from large warlords such as Mouri clan or Amago clan. 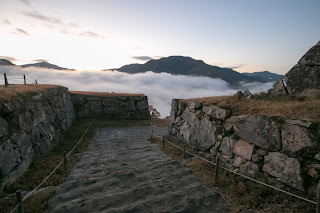 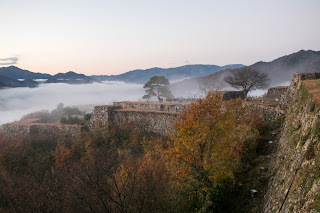 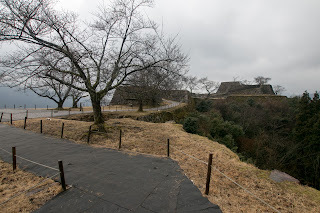 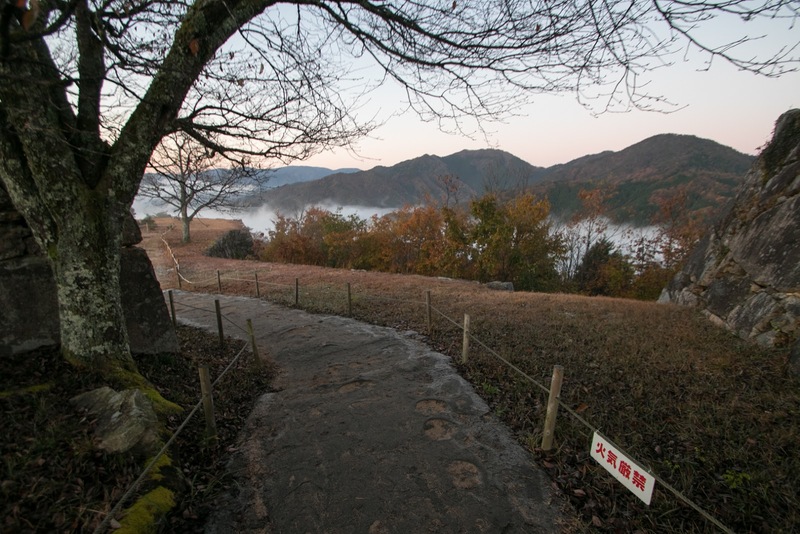 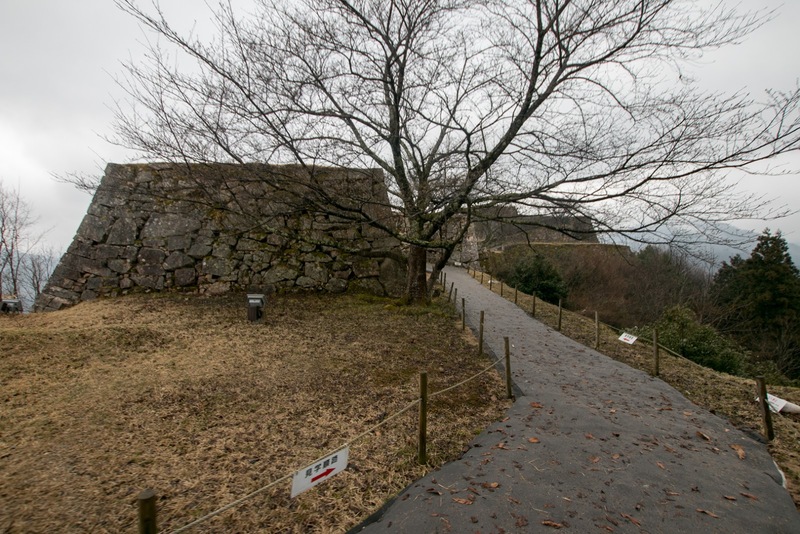 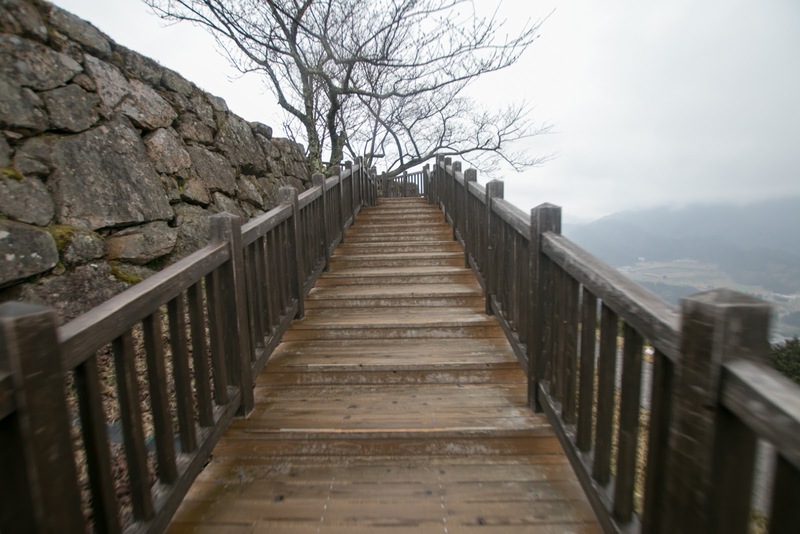 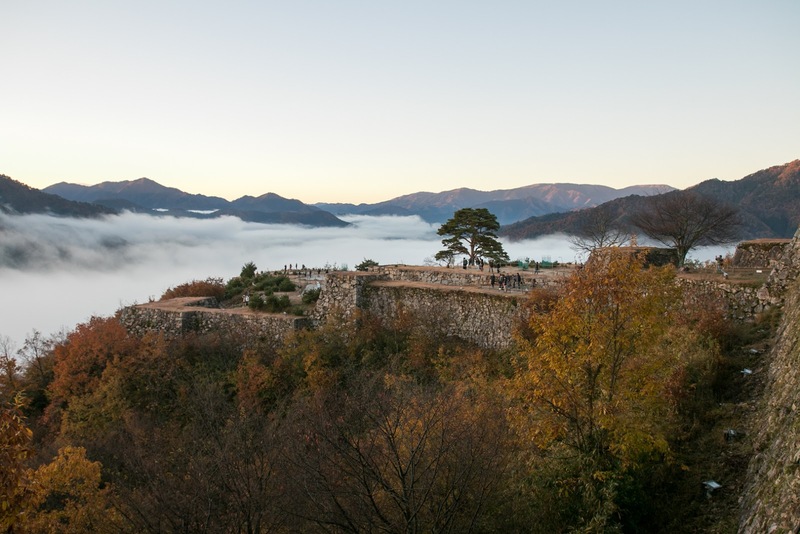 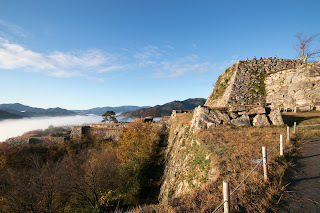 Takeda castle was built by Yamana clan in 15th century, and held by their retainer Otagaki clan. 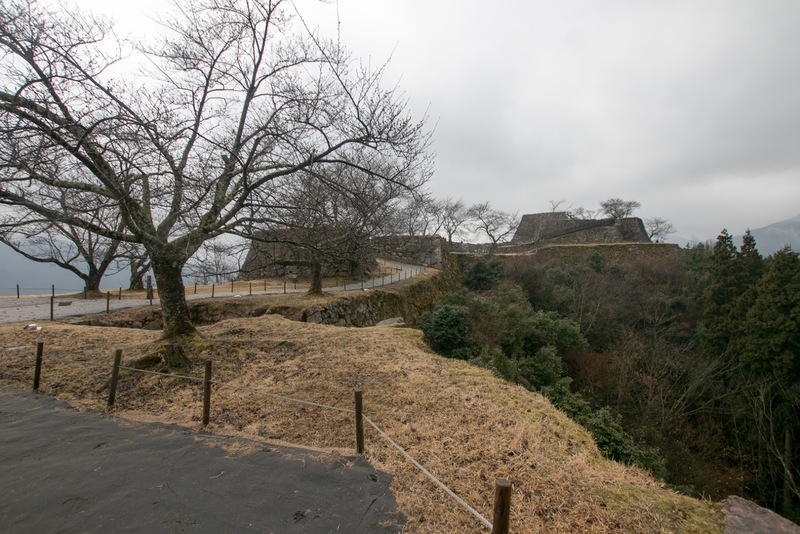 At the middle of 16th century, Yamana clan was controlled by its four major retainers, such as Kakiya clan, Otagaki clan, Tainosyo clan and Yagi clan at Yagi castle (Hyogo prefecture). 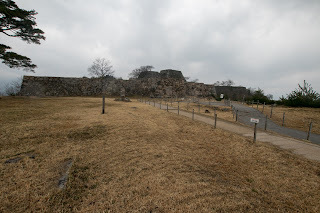 In 1569, Nobunaga Oda (1534-1582), a warlord of Owari province (western half of Aichi prefecture) and became the ruler seized the capital Kyoto in 1568, send his general Hideyoshi Hashiba (1537-1598, later Hideyoshi Toyotomi) to suppress Tajima province, and Hideyoshi occupied Takeda castle. 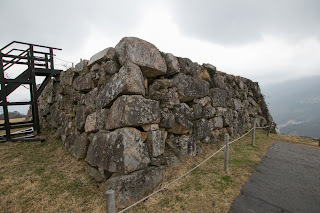 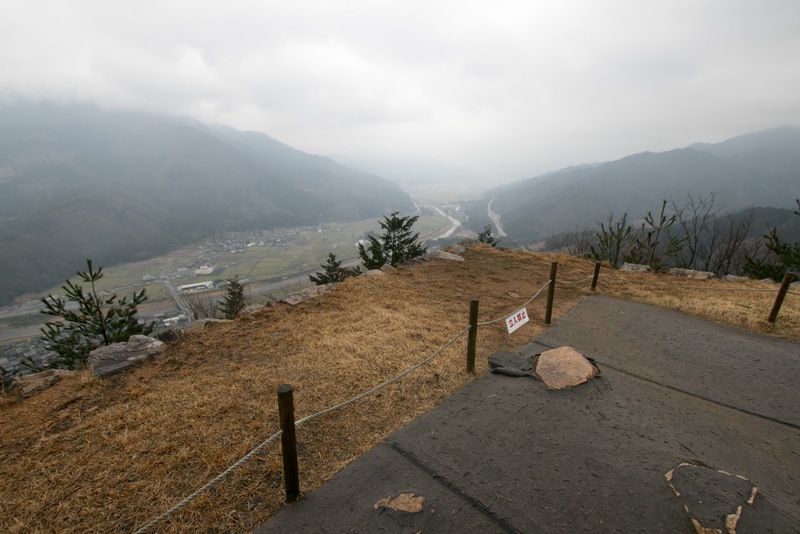 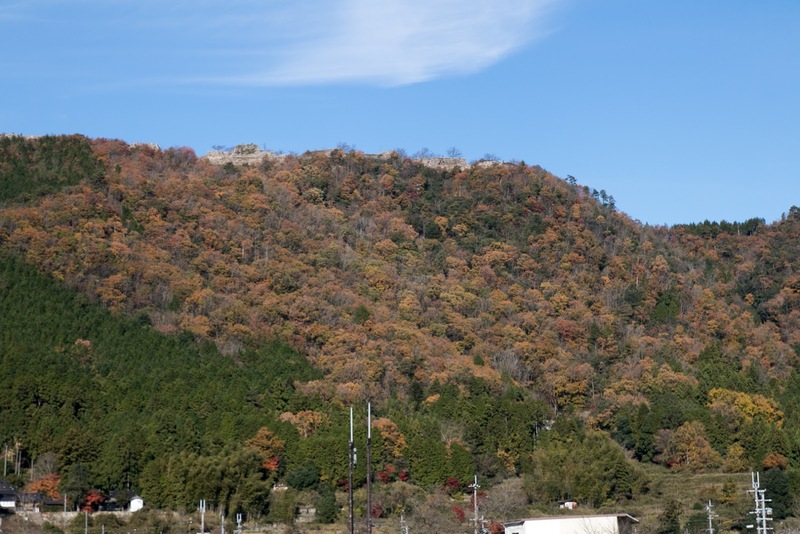 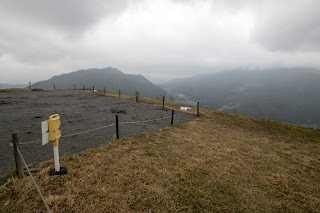 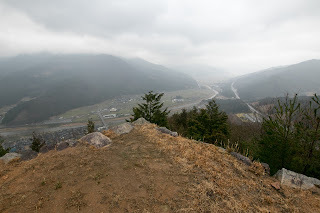 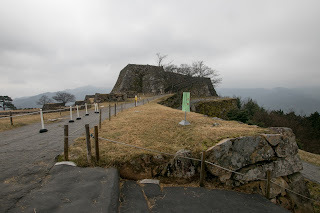 Later once Yamana clan belong to Nobunaga and was approved to keep Tajima province, but next Takeda castle was attacked by Naomasa Akai (1529-1578), a brave lord of Kuroi castle (Hyogo prefecture) praised as red devil. 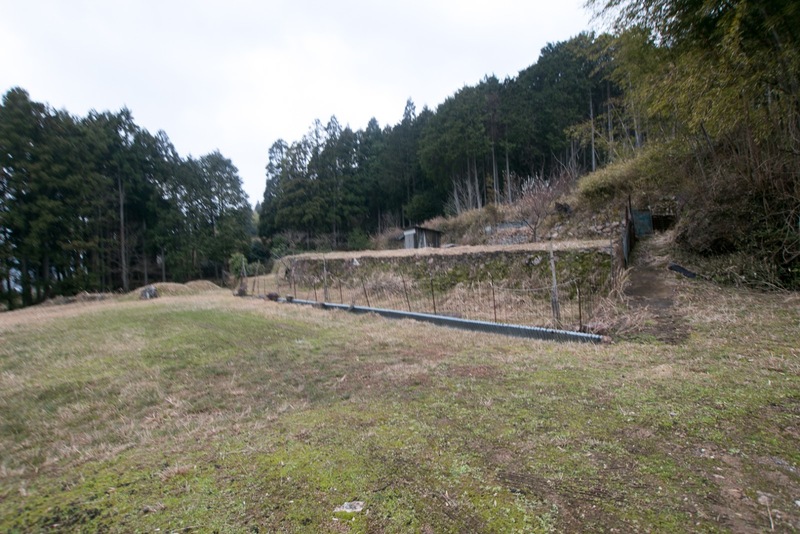 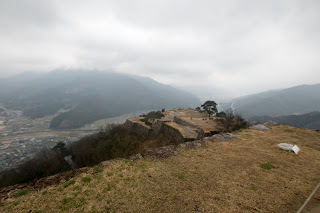 Later Akai clan was attacked by Nobunaga and Naomasa retreated from Takeda castle, but when Nobunaga and Mouri clan started genuine conflict in 1577, Otagaki clan changed to Mouri clan by arbitrary decision. 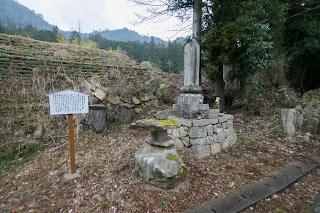 As a result, whole Yamana clan was regarded as an enemy of Mouri clan, and after 1578 Hideyoshi set about his campaign against Mouri clan in Chugoku region in earnest once more. Hideyoshi's trustible younger brother Hidenaga Hashiba (1540-1591) finally seized whole Tajima province including Takeda castle by 1580. 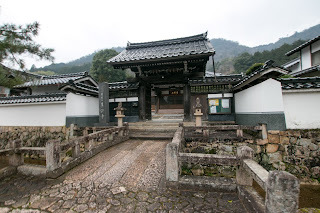 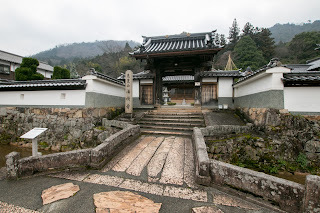 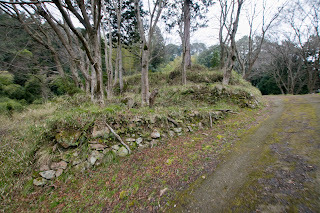 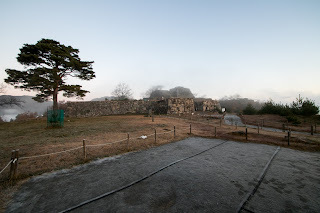 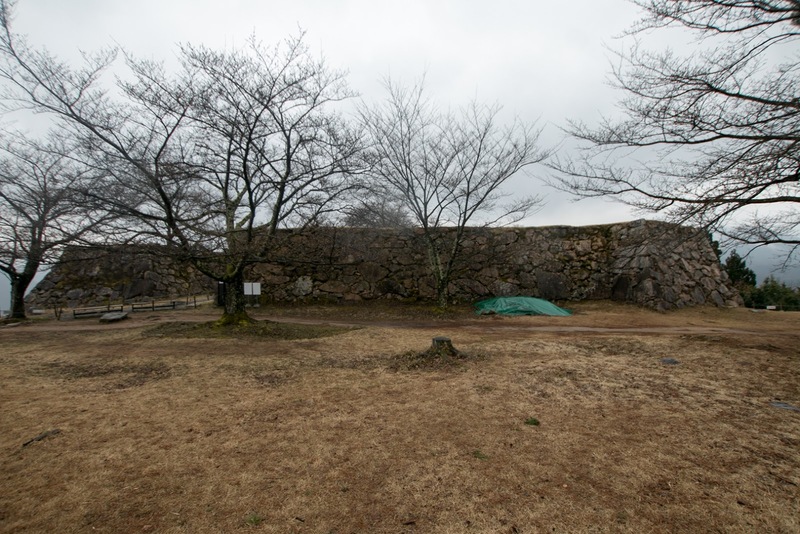 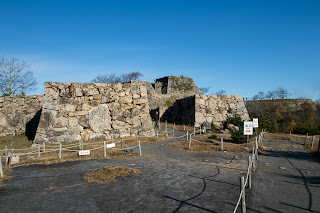 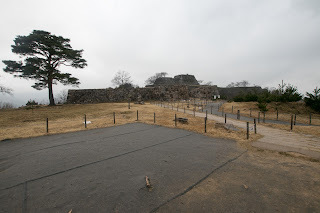 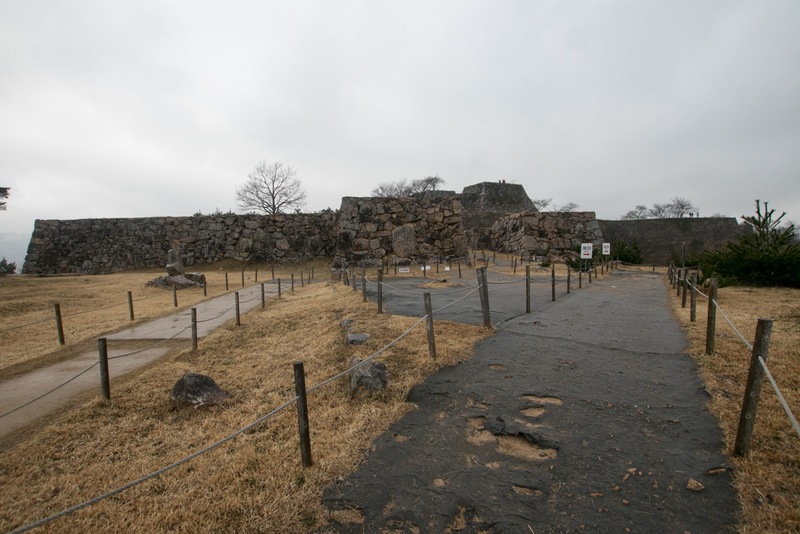 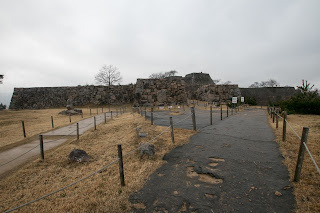 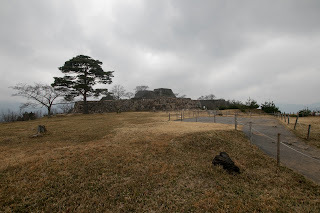 Hidenaga once appointed his confident general Shigeharu Kuwayama (1524-1606) as a commander, but after the transfer of Hidenaga and Shigeharu, Hideyoshi placed Hirohide Akamatsu (1562-1600) as a governor of this castle. 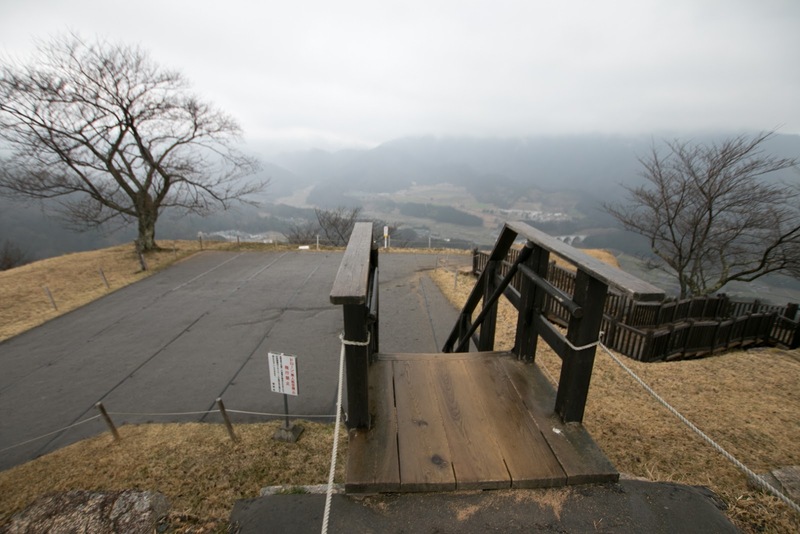 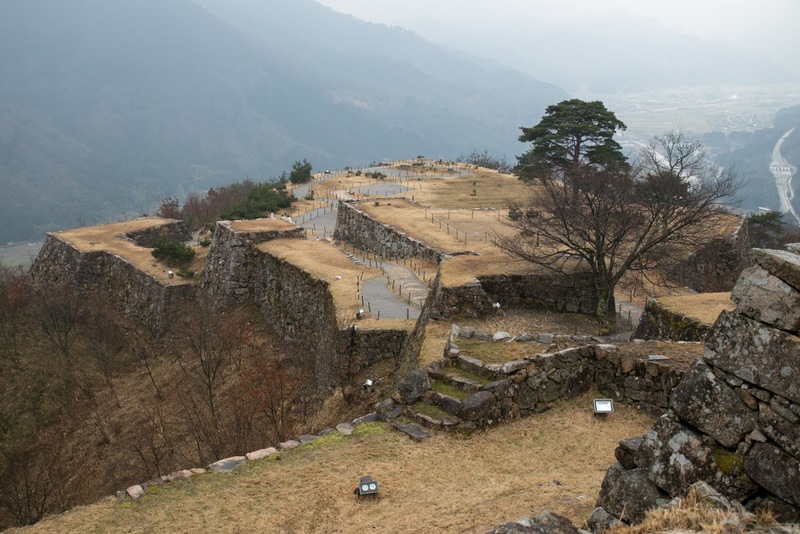 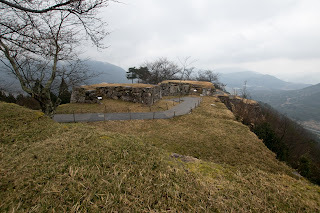 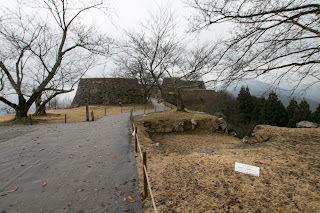 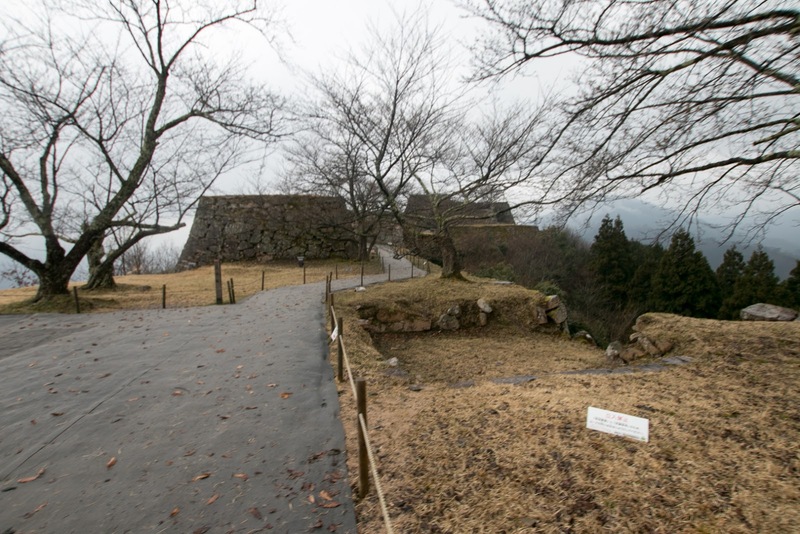 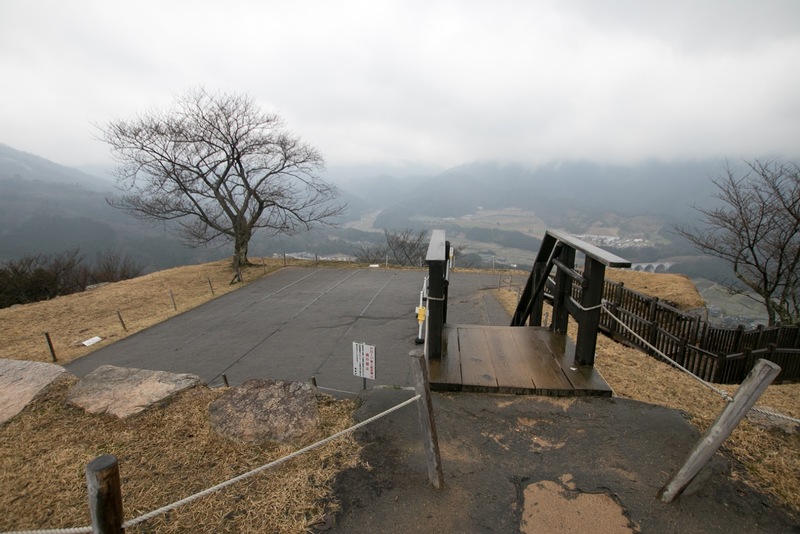 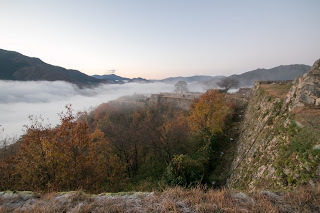 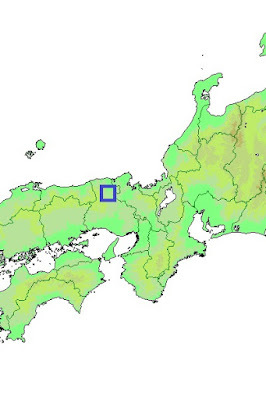 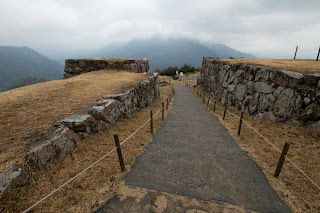 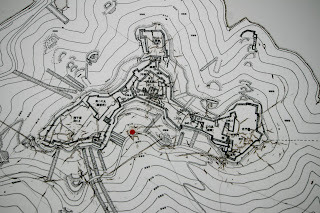 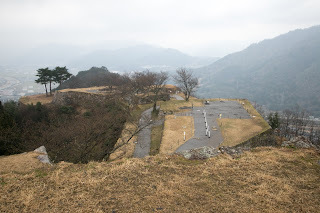 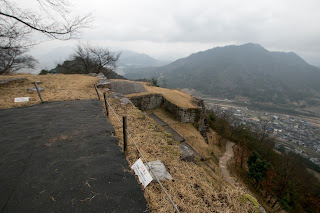 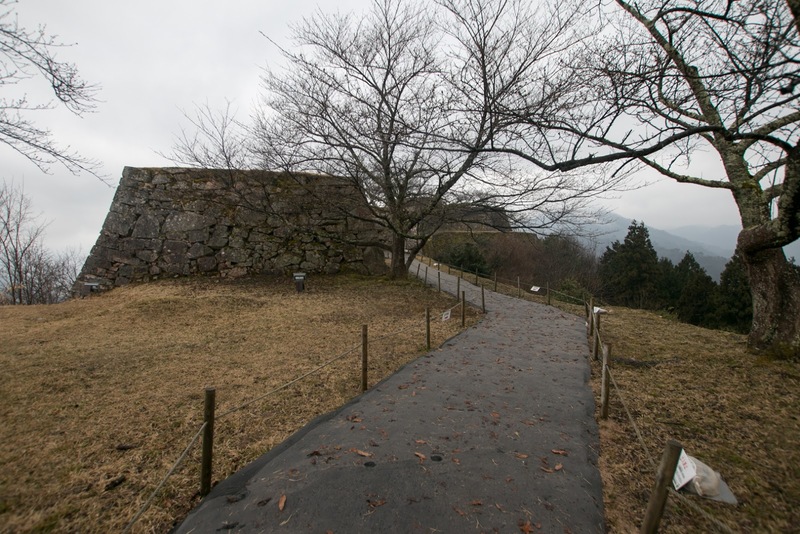 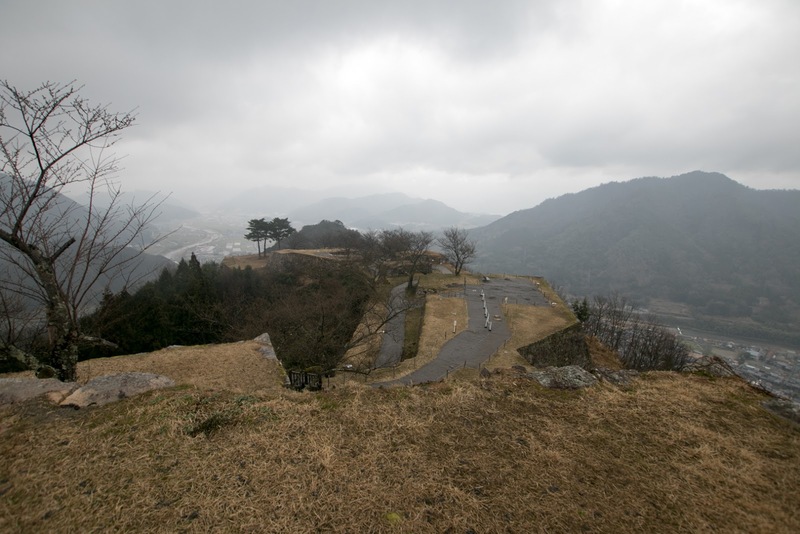 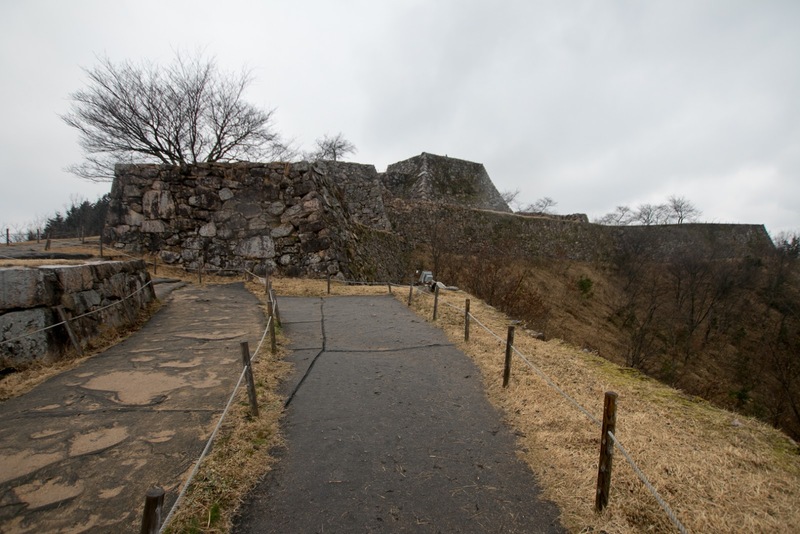 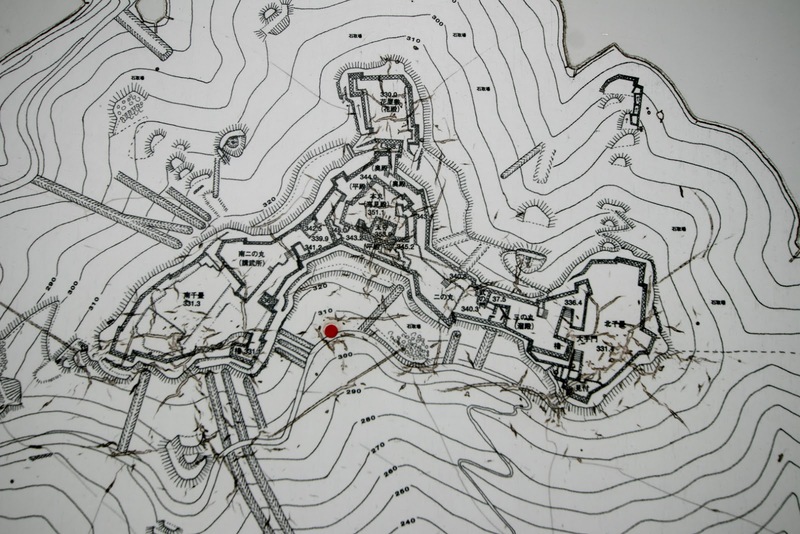 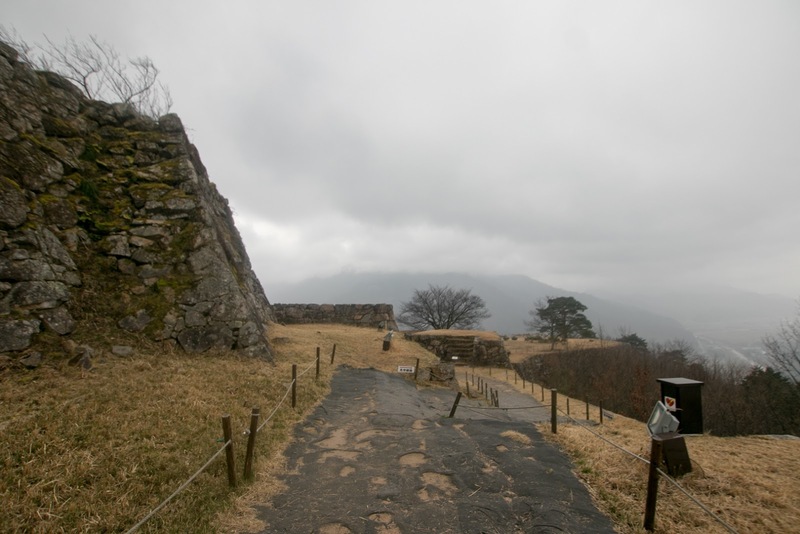 Under Hirohide, Takeda castle was significantly expanded as a northwestern guard of vital area of Toyotomi government. 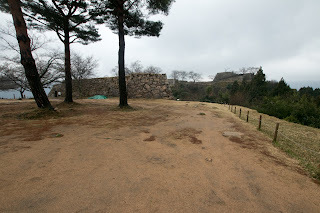 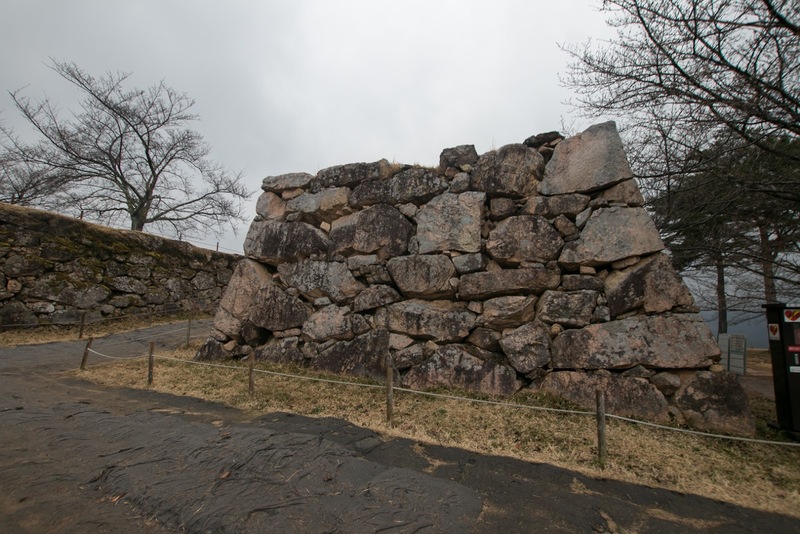 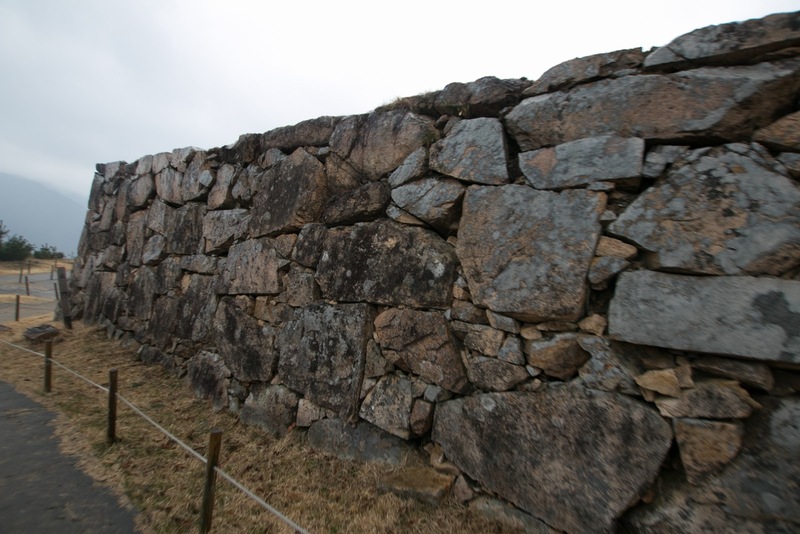 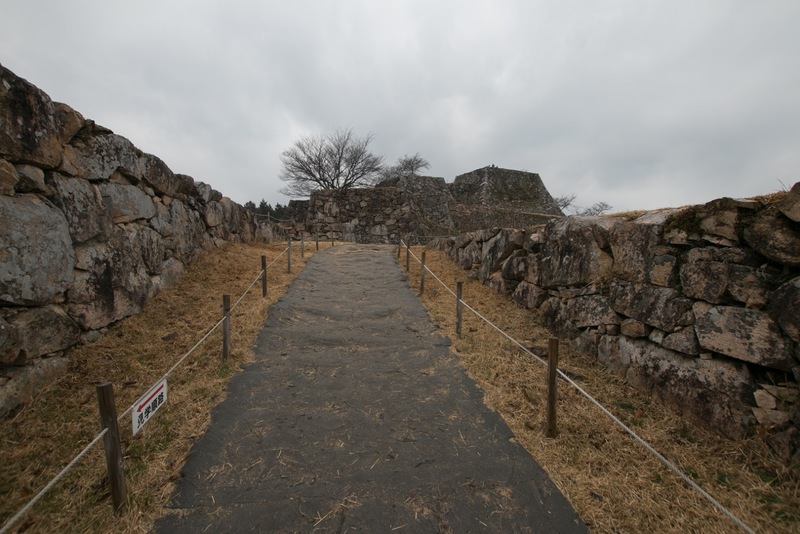 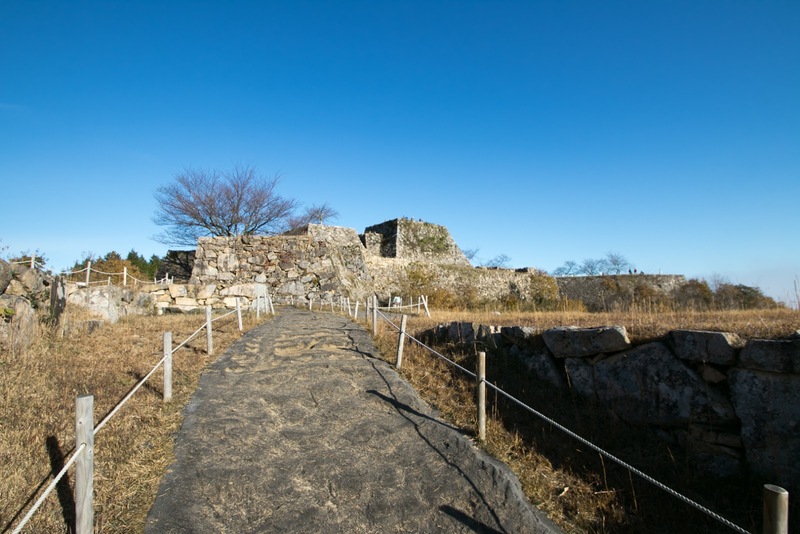 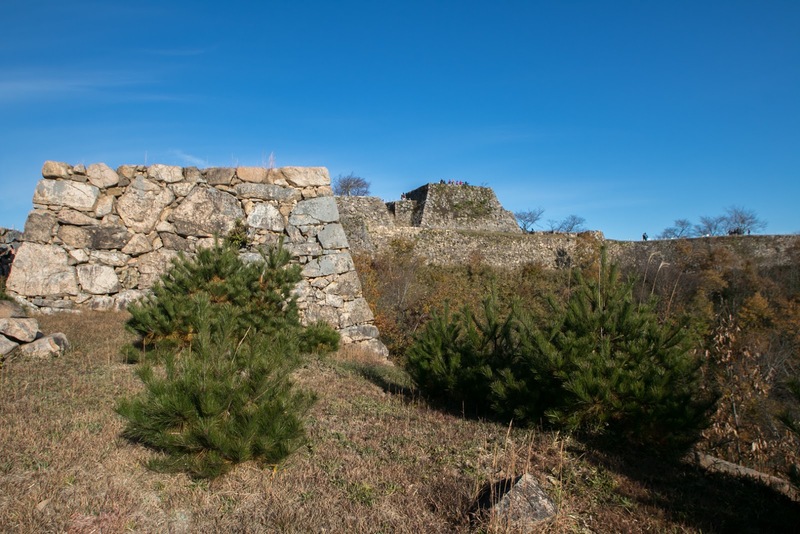 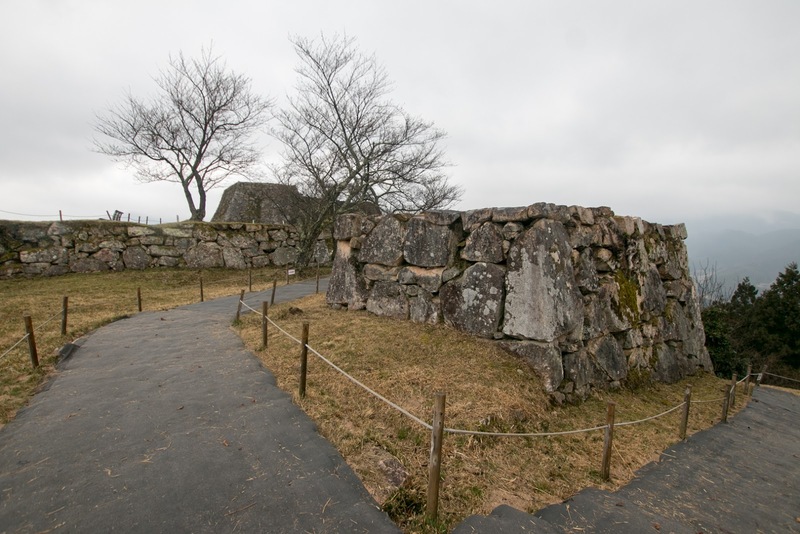 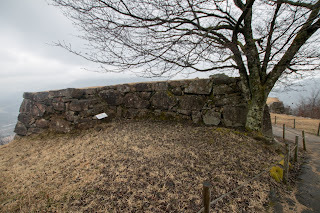 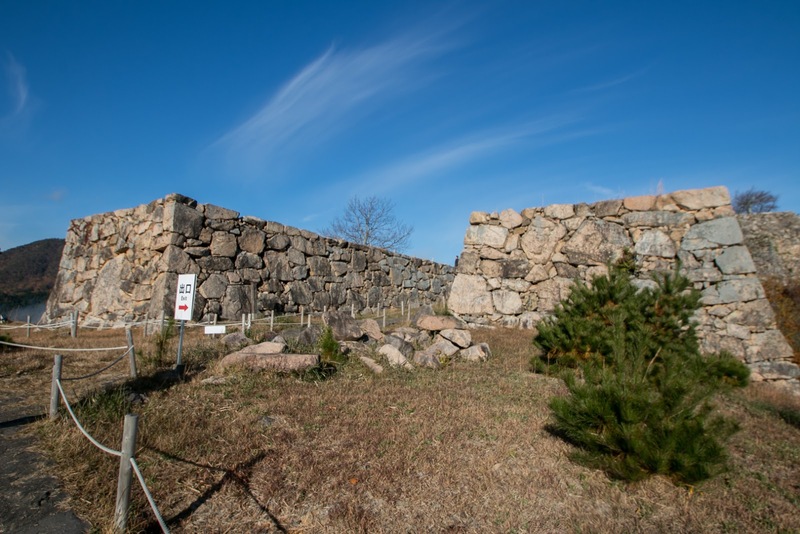 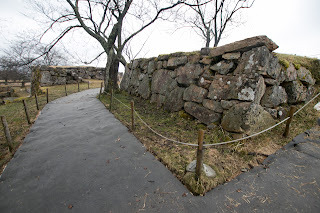 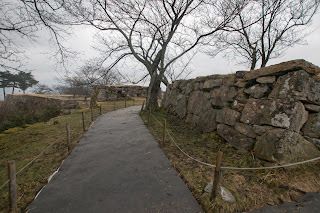 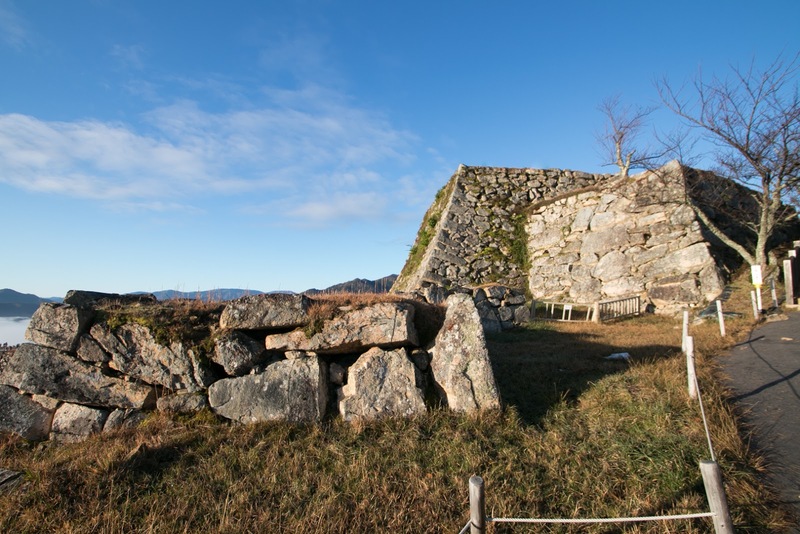 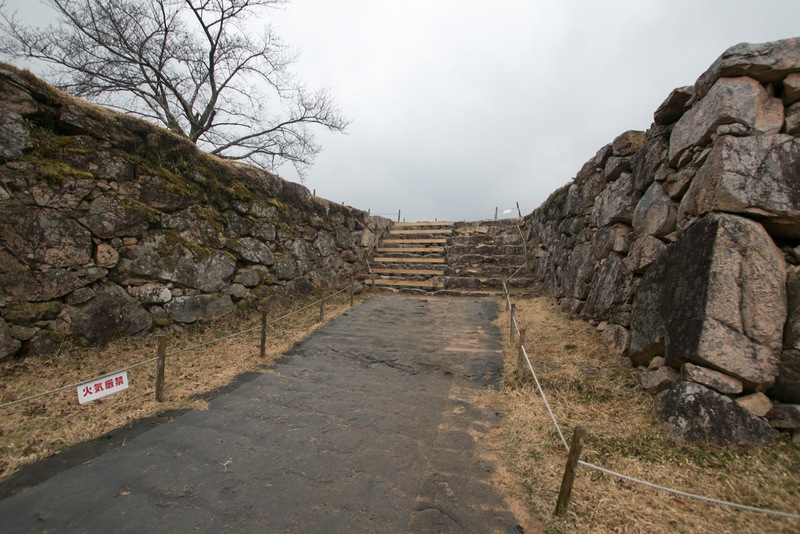 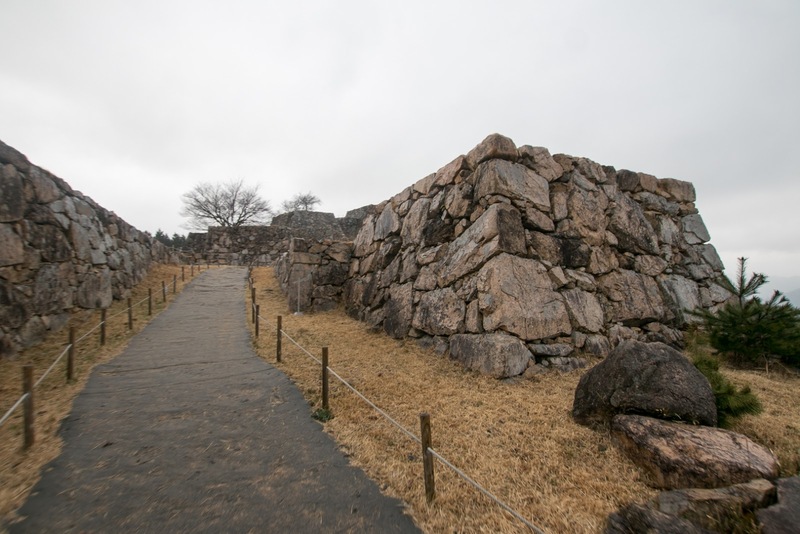 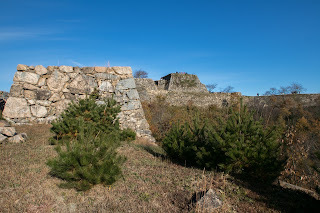 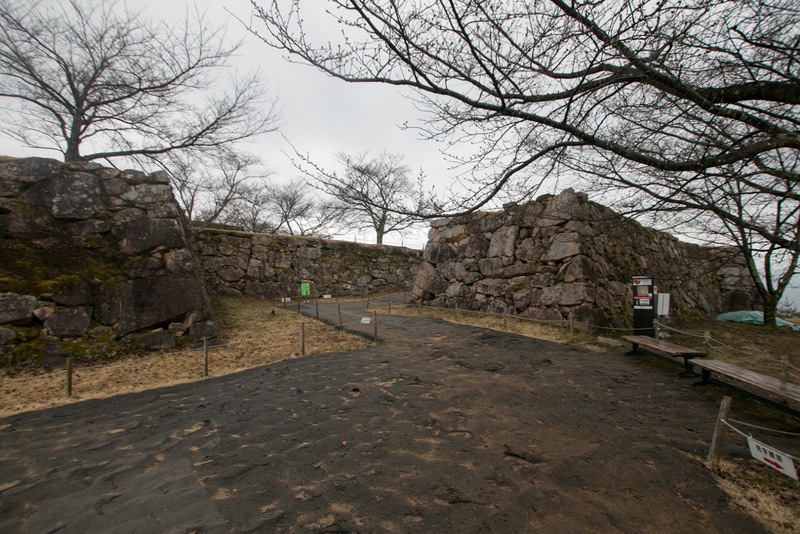 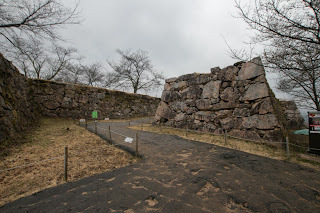 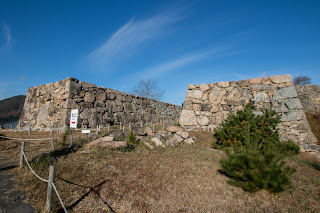 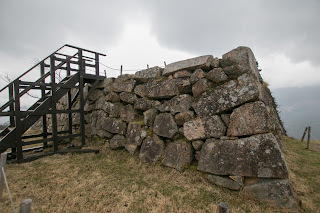 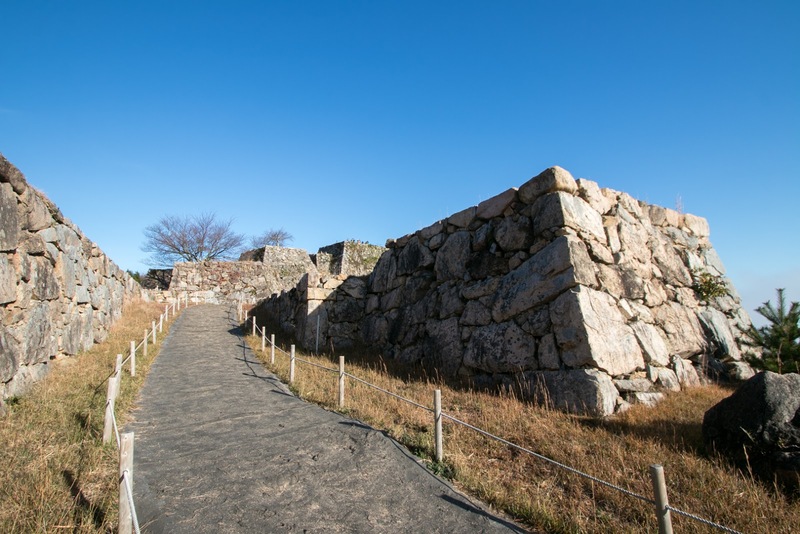 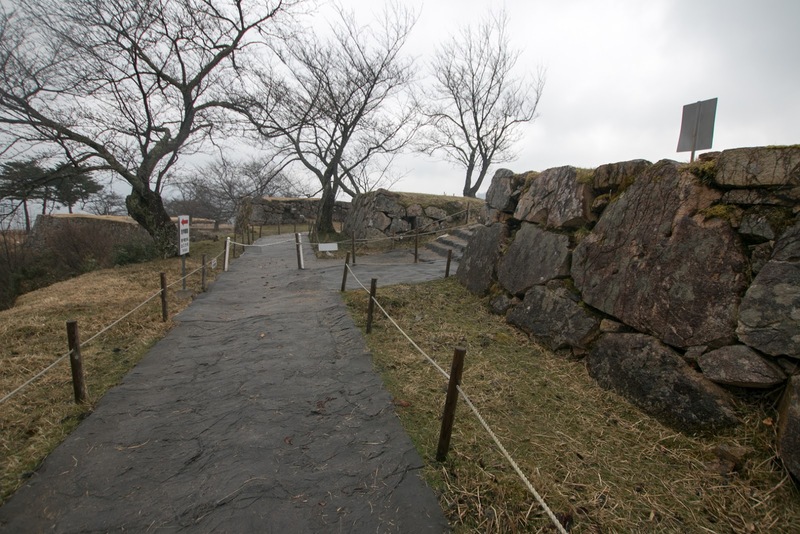 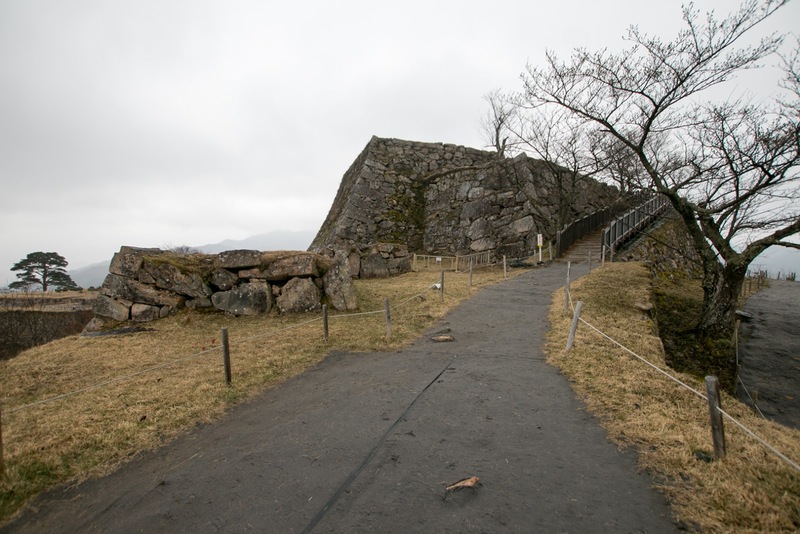 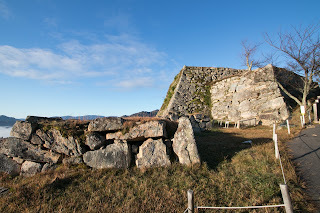 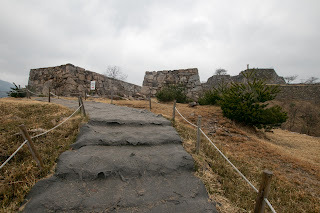 Although the whole area is surrounded by stone walls, basic structure of castle is the same as medieval era. 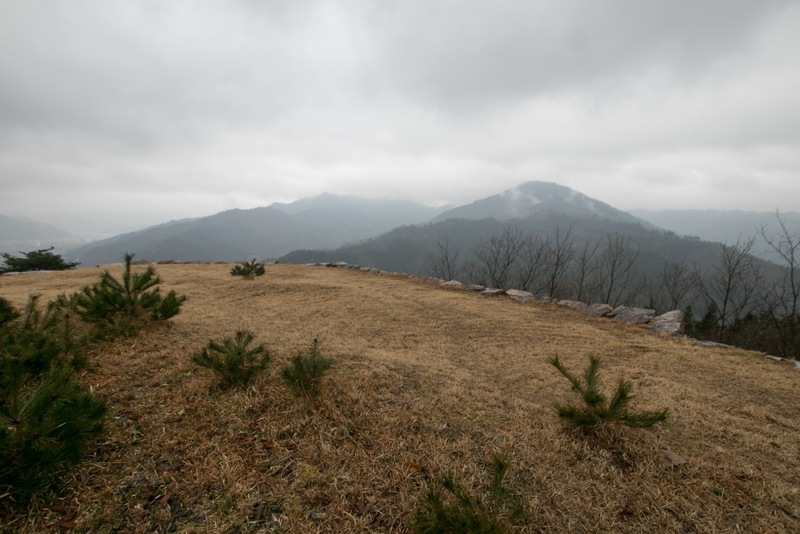 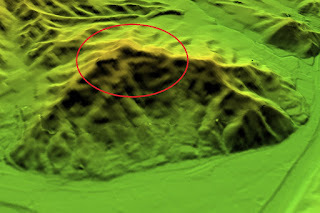 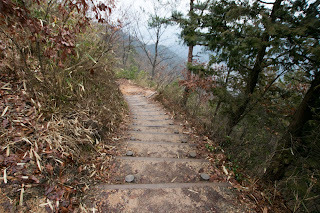 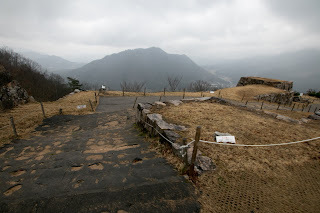 From the top of the mountain there are three ridges radiate from center, and each ridge are shaped into terraces. 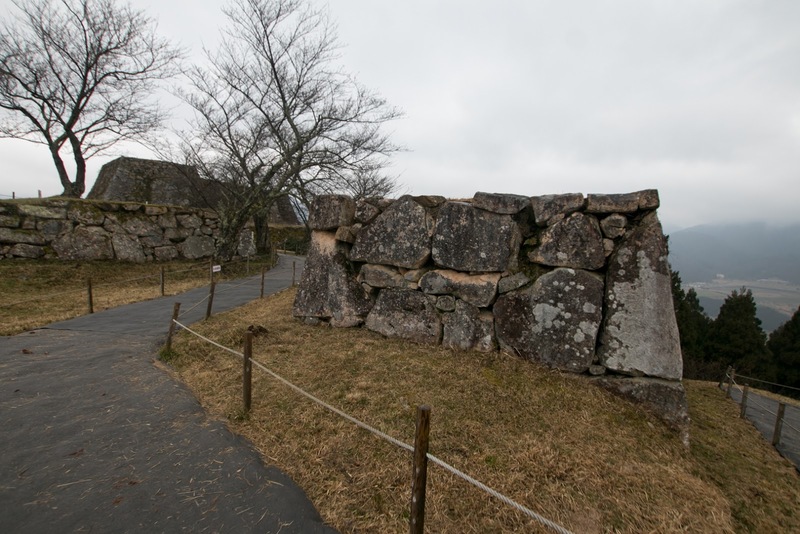 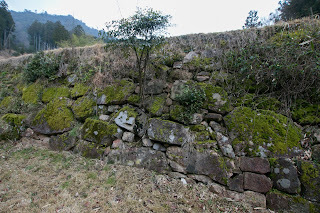 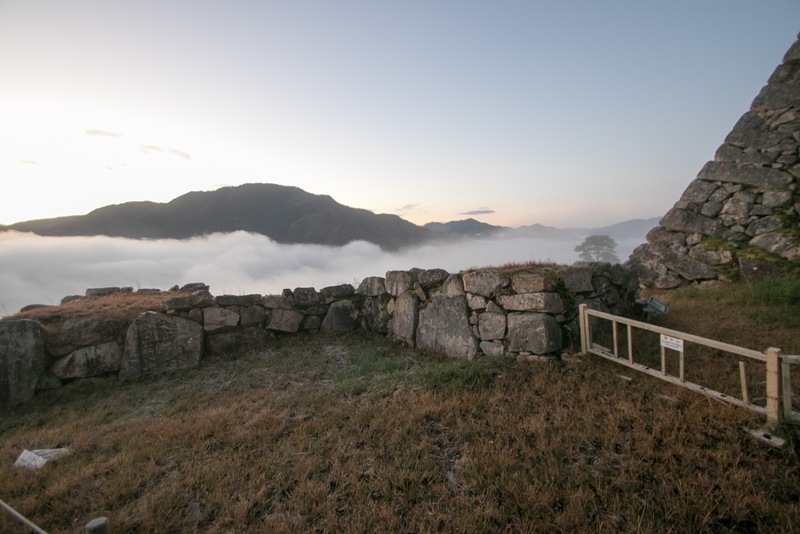 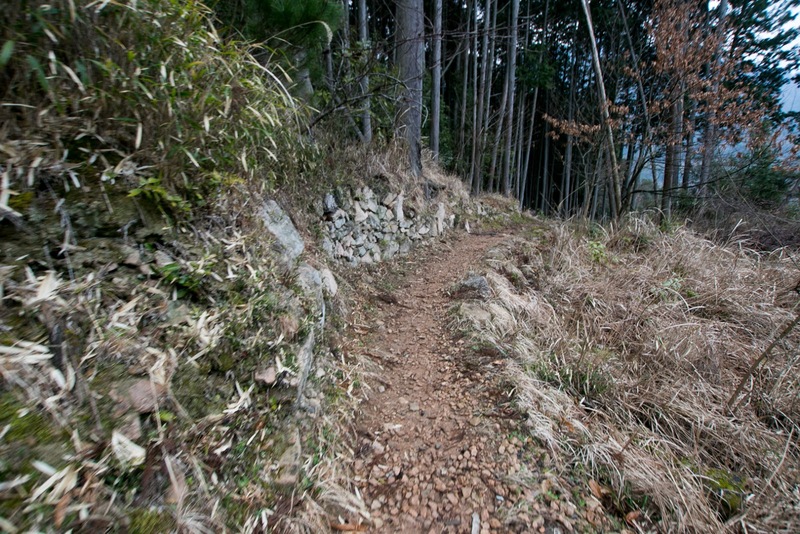 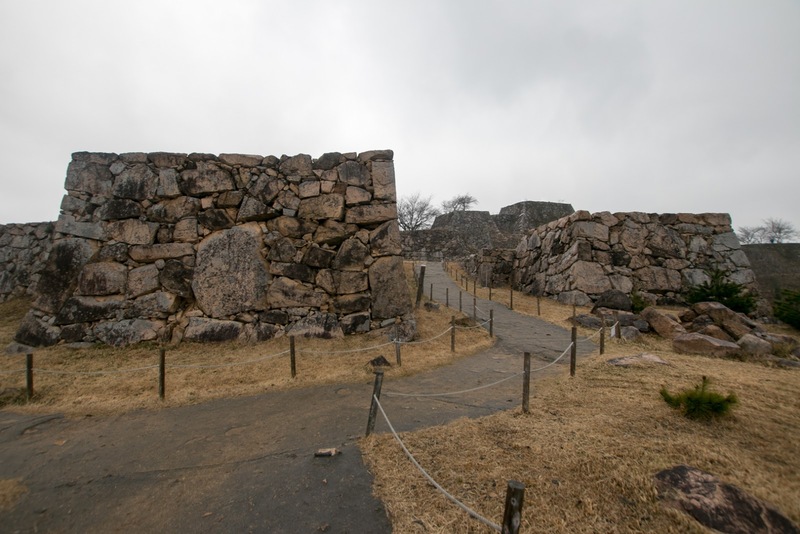 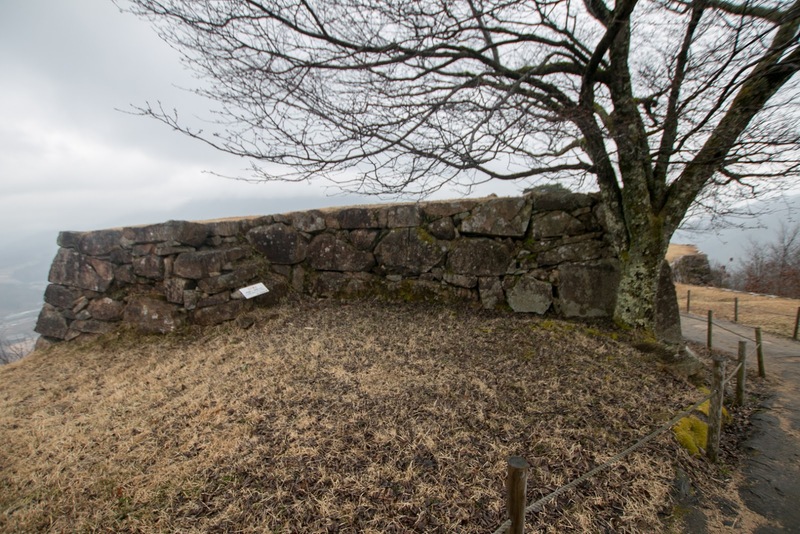 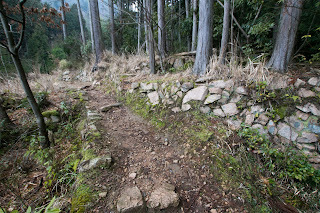 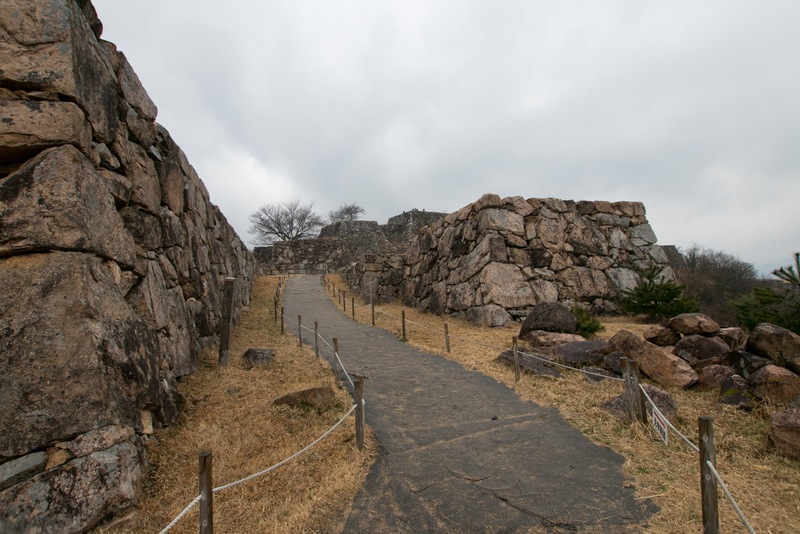 Each terrace has winding walls using original terrains, and had gates at the edge on outer side. 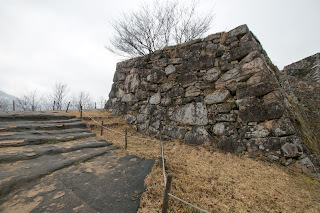 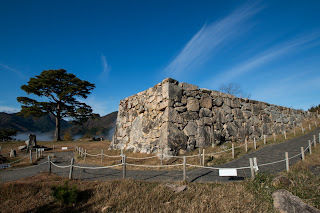 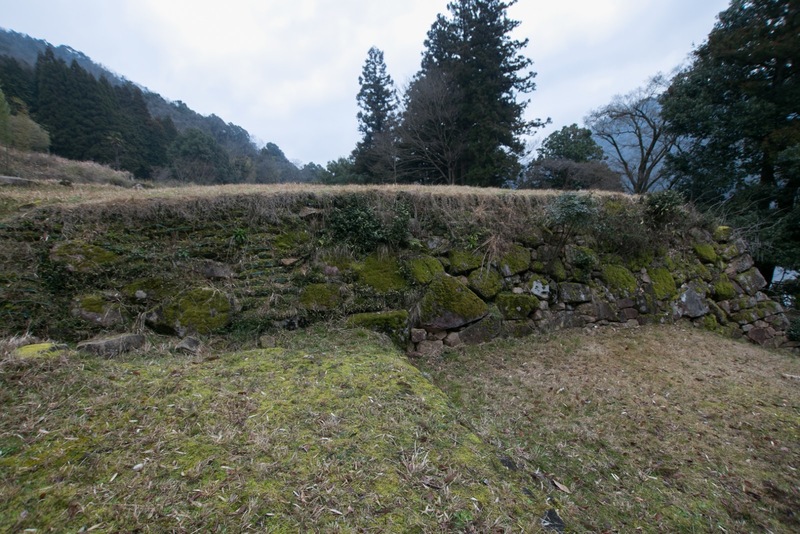 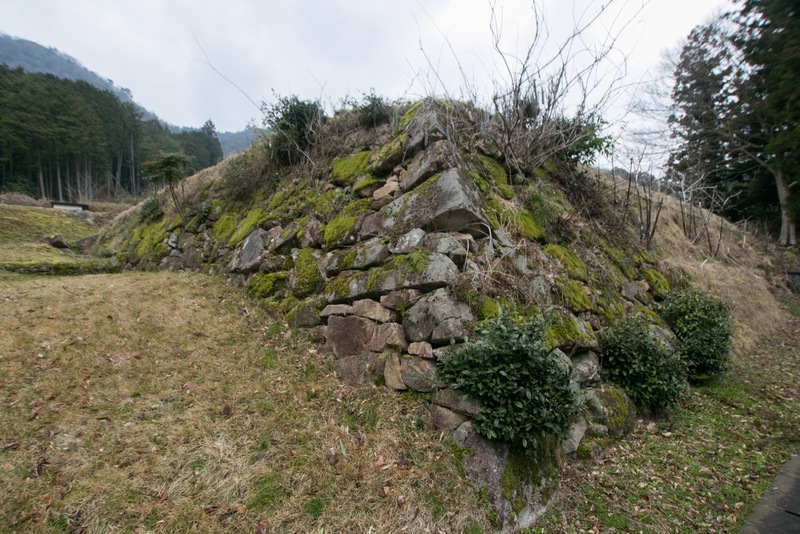 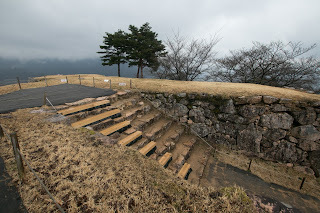 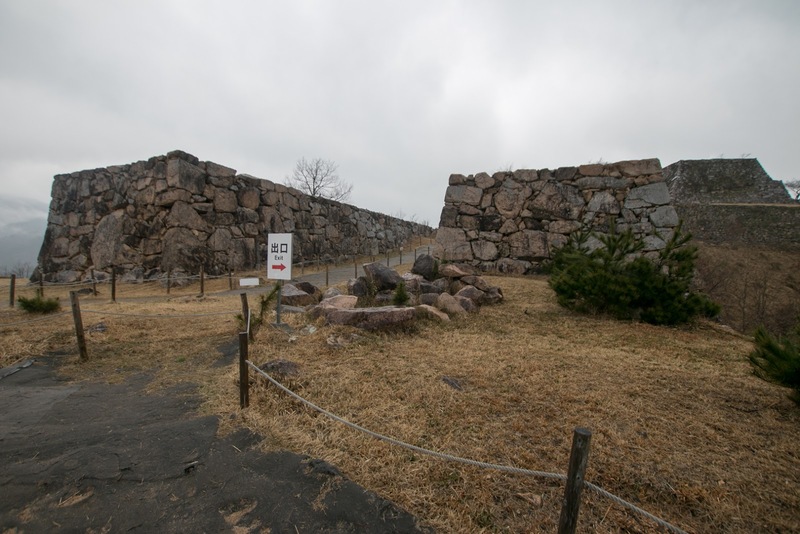 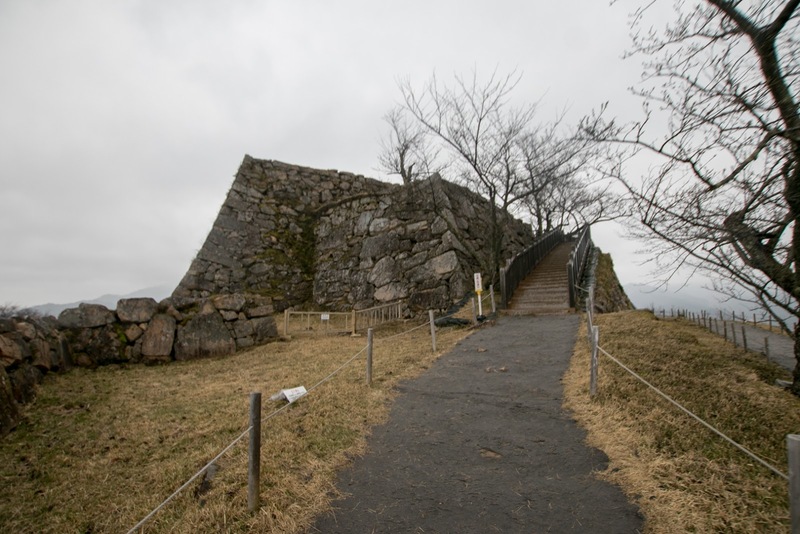 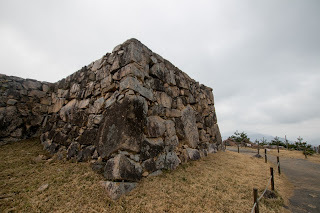 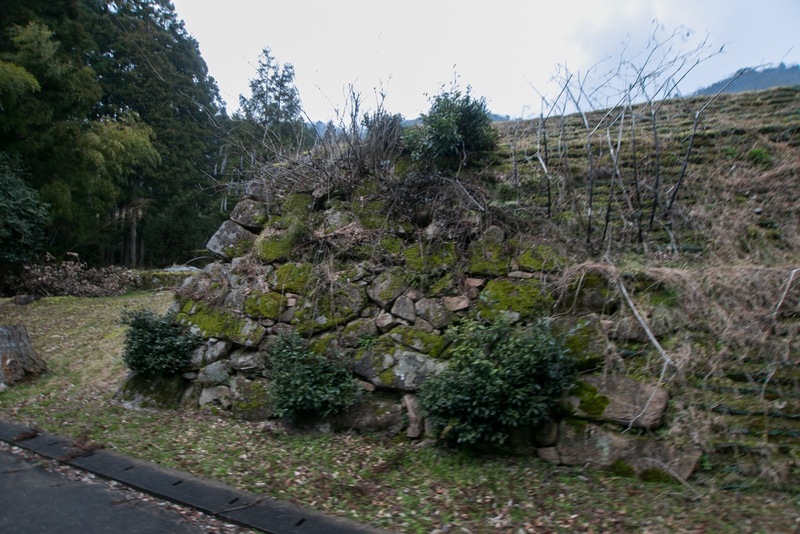 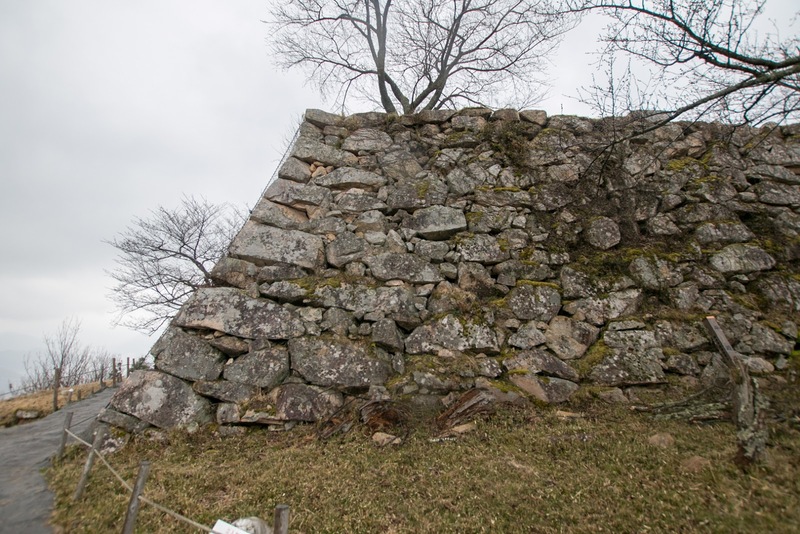 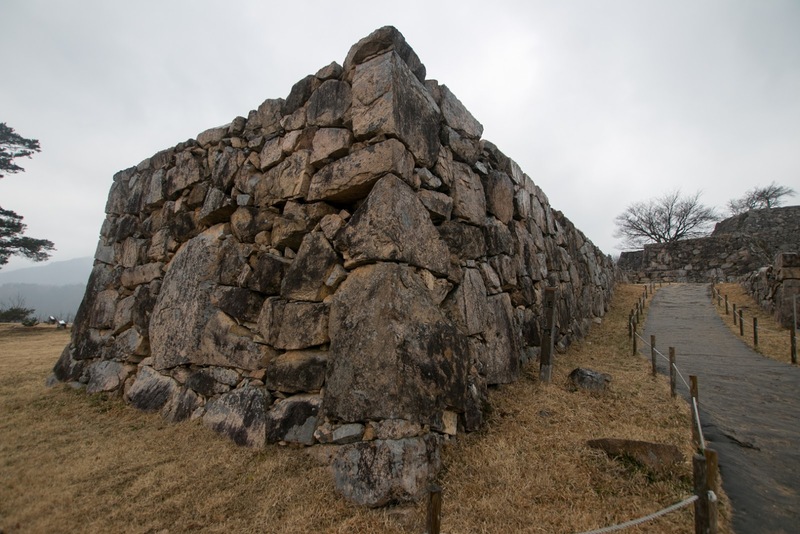 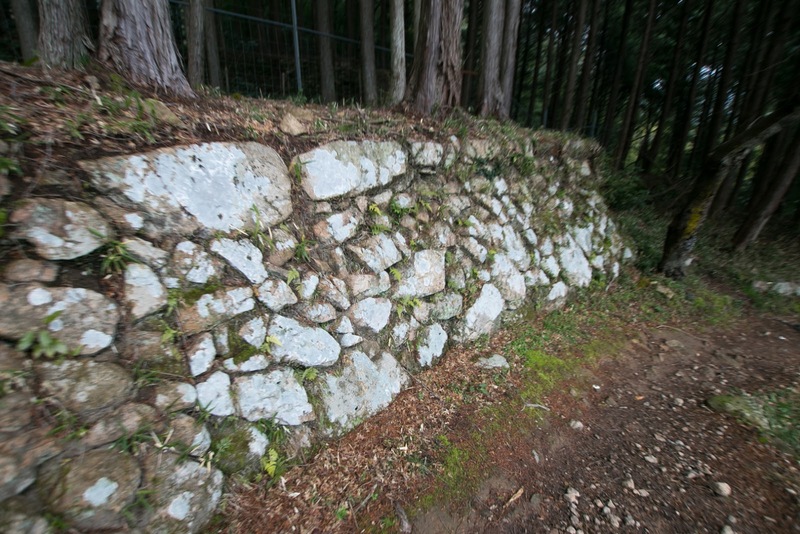 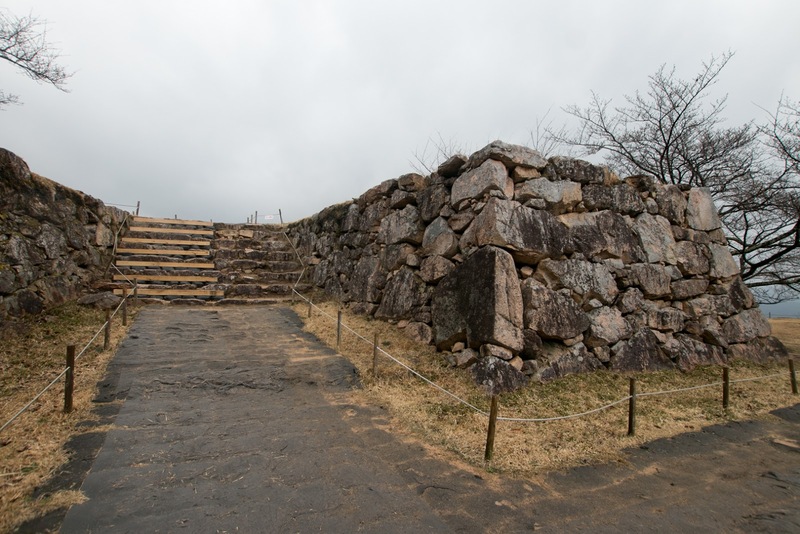 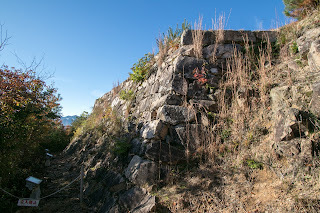 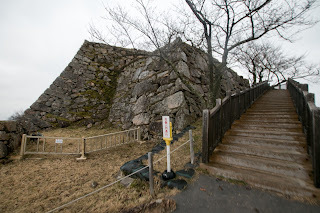 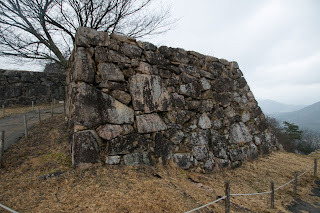 This structure is quite similar to Takatori castle (Nara prefecture), a large mountain castle later built by Hidenaga. 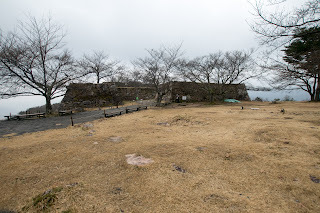 Toyotomi government was highly dependent on the economic power of Osaka city and political authority of Imperial household at Kyoto city, thus Kinki region was the vital area of the government to be defended to the last. Based on the allocation of commanders, Toyotomi government seemed to consider the following country as its vital area and placed its relatives or old retainers. 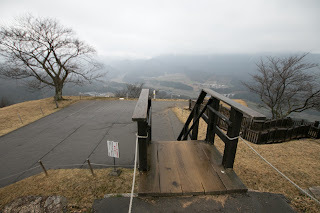 The ways of placing comannders between Toyotomi government and Tokugawa shogunate was quite similar. 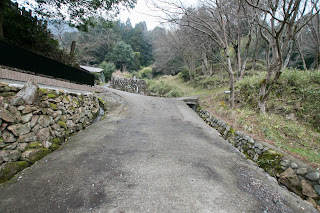 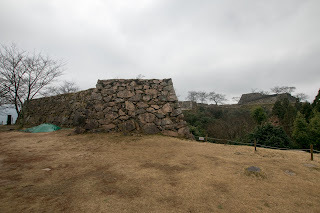 They guarded their capital by their relatives and old retainers, and placed trusted strong generals at important point of communication or next to large new coming lords as a restraint (For Toyotomi government, Masanori Fukushima at Owari country and Kiyomasa Kato at Higo province). 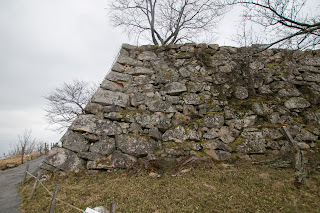 But contrary to Tokugawa clan which was a traditional lord and had abundant relatives and hereditary retainers to serve, Hideyoshi was an upstart with fewer relatives and retainers, Hideyoshi could not carry through this policy. 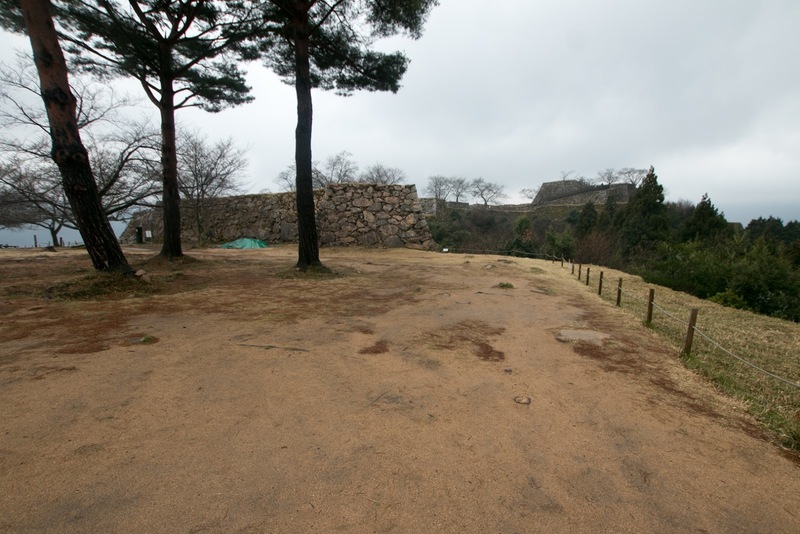 Further due to the short lives of relatives and purge of old retainers along with execution of Hidetsugu Toyotomi (1568-1595), his planned successor, Toyotomi clan had no powerful people to allocate any more. 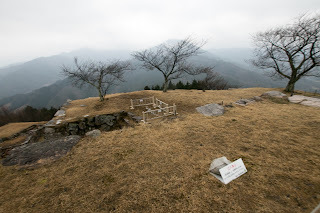 At the battle of Sekigahara after the death of Hideyoshi occurred in 1600, Kinki region generally belonged to Toyotomi supporting side lead by Mitsunari Ishida (1560-1600), but due to lack of core they could not organized action and were defeated by Ieyasu Tokugawa (1543-1616), the largest lord. 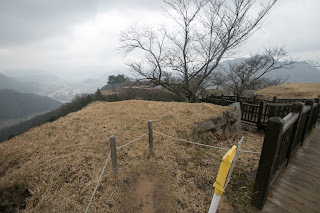 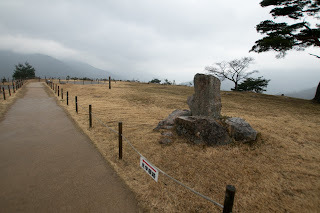 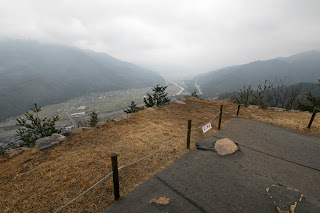 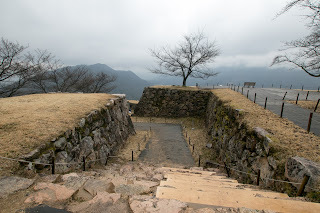 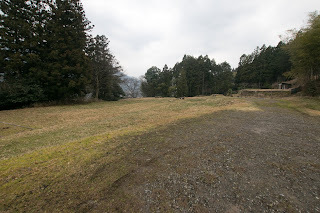 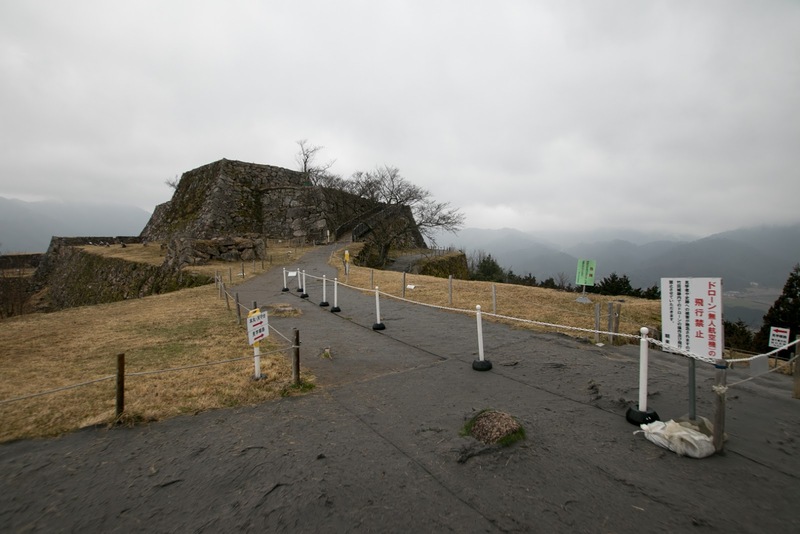 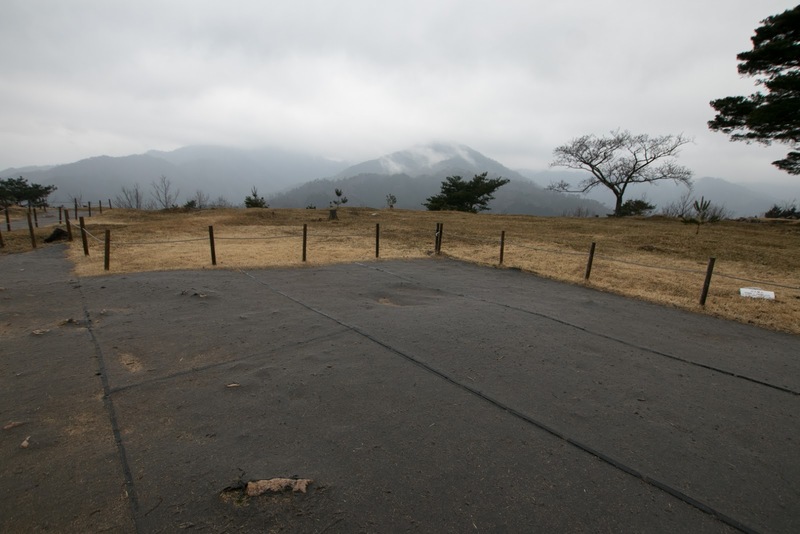 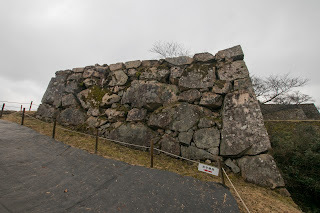 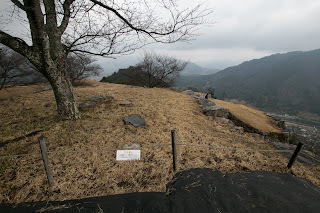 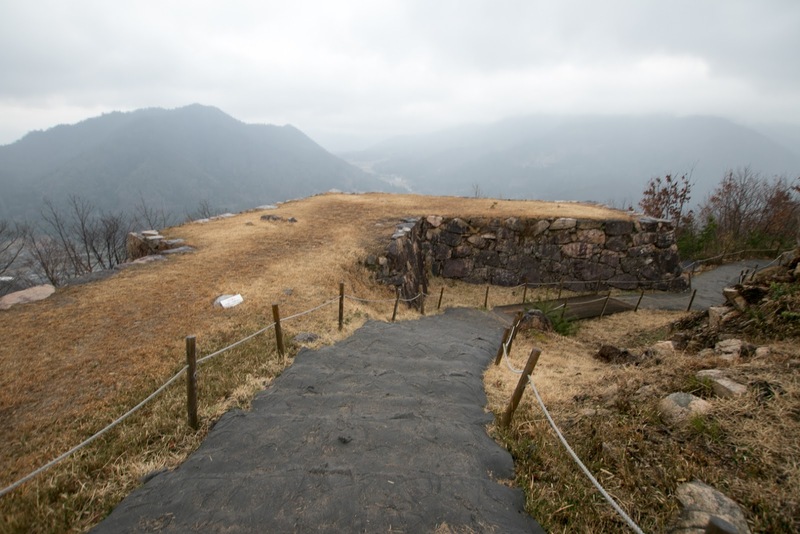 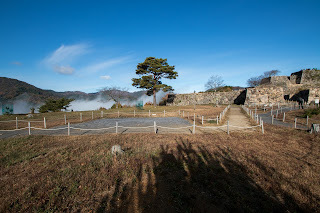 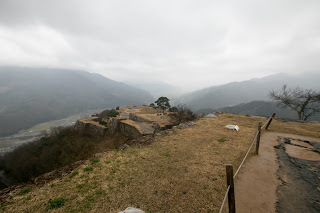 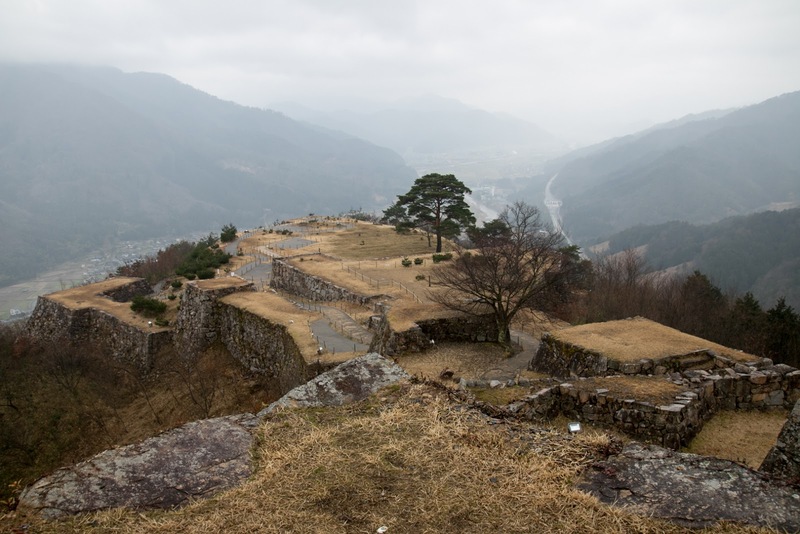 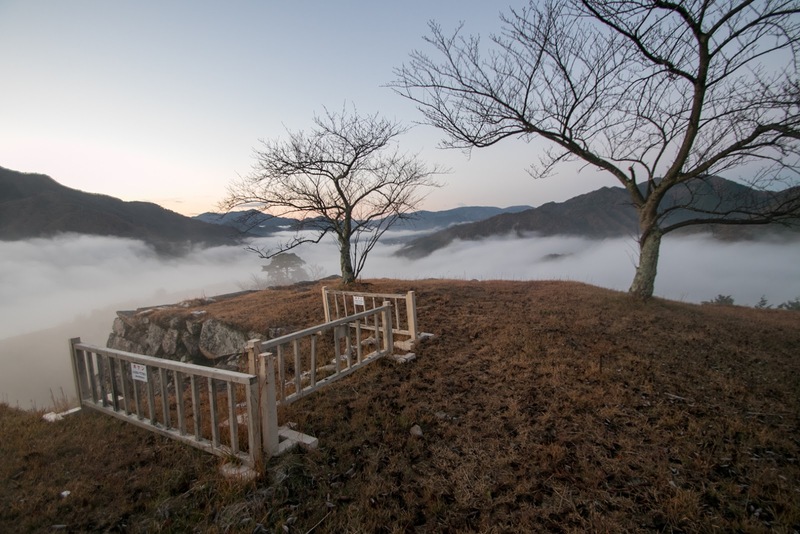 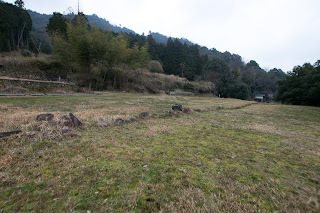 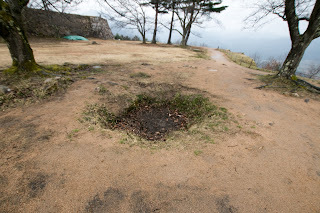 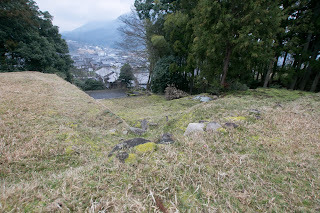 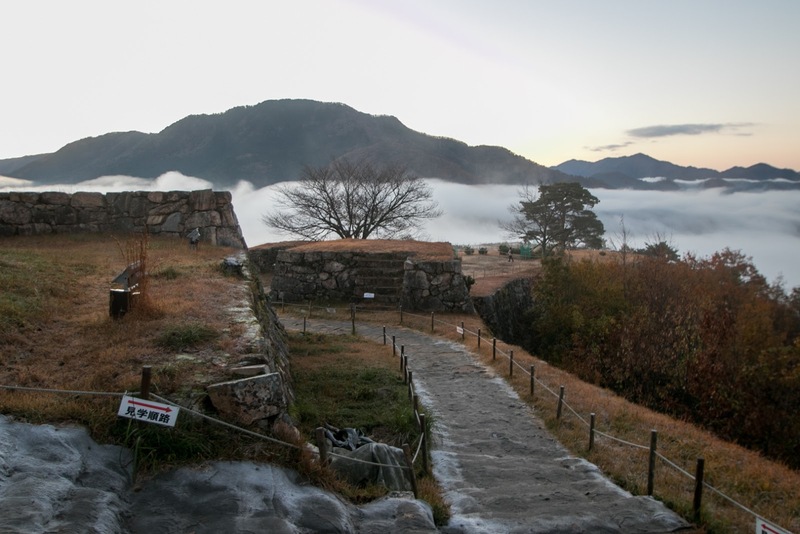 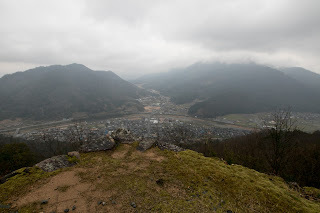 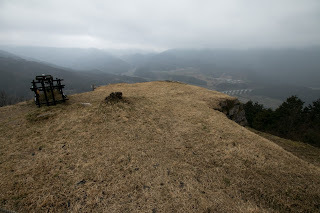 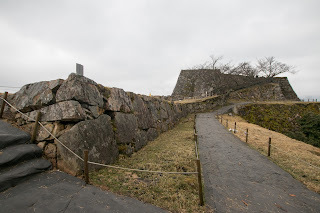 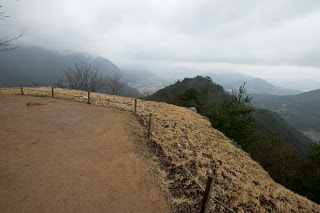 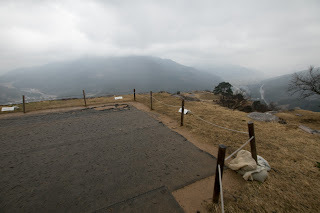 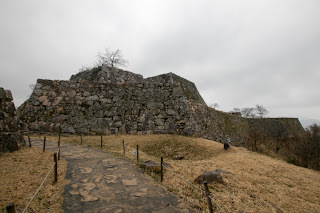 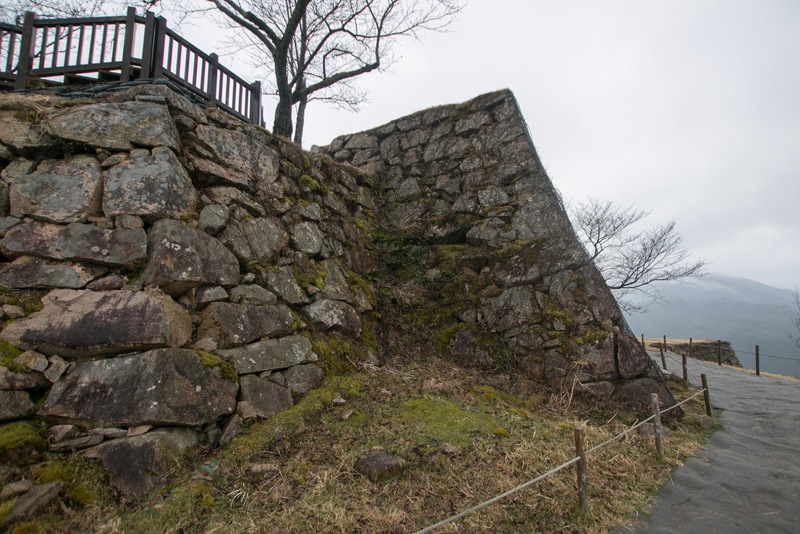 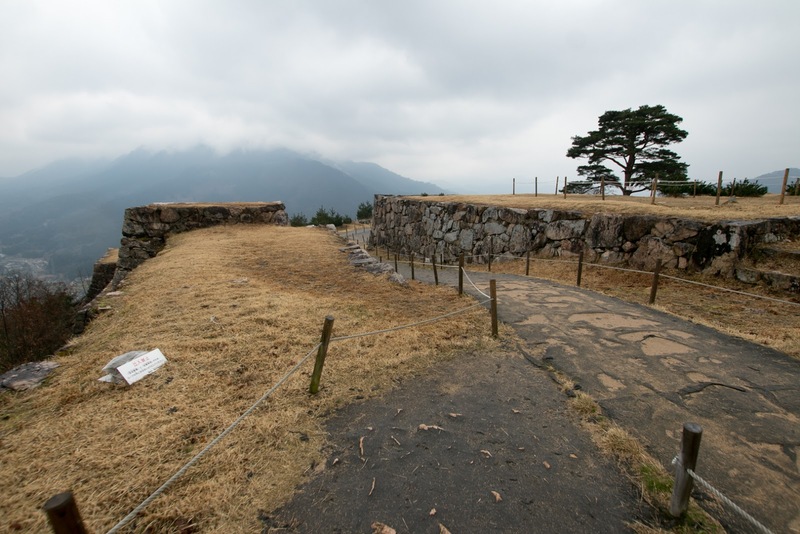 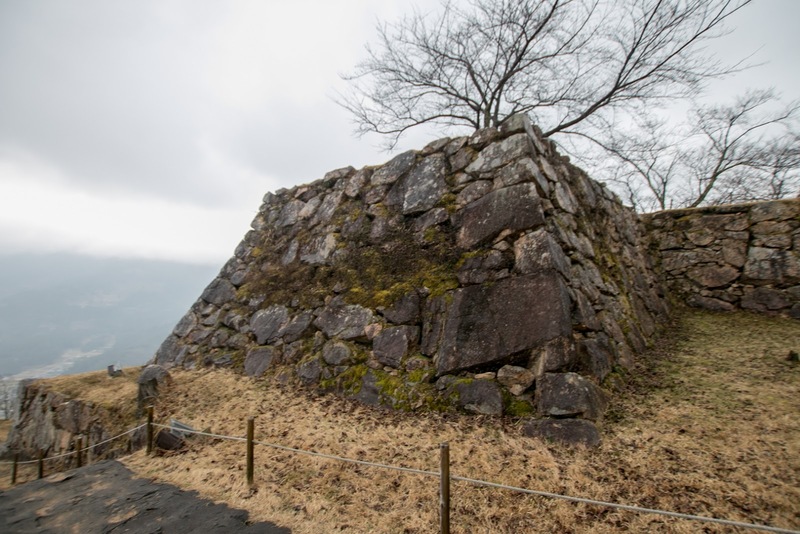 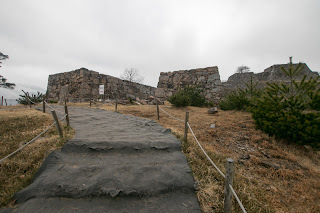 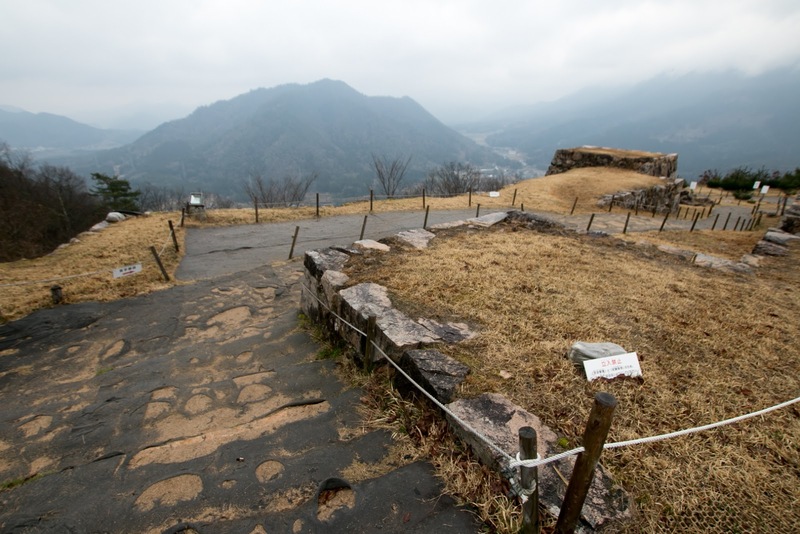 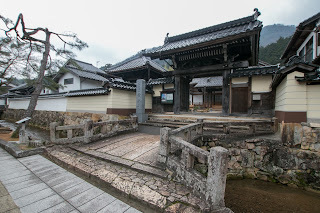 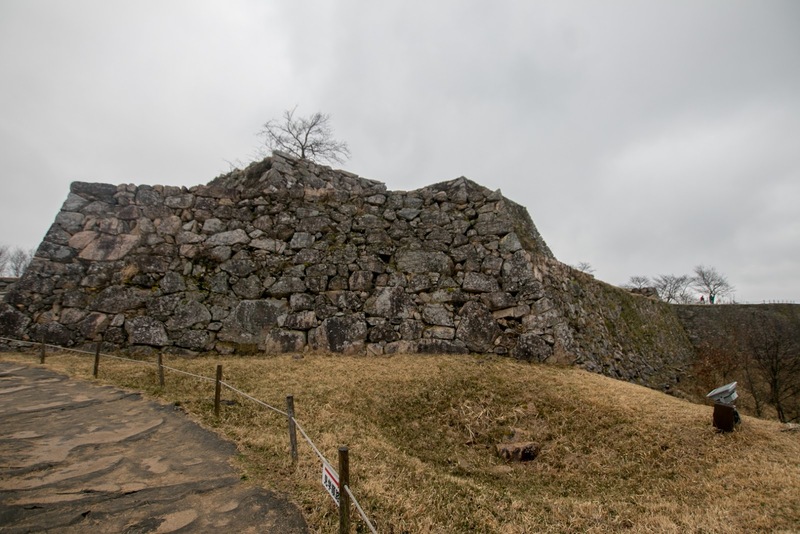 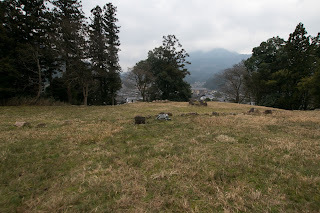 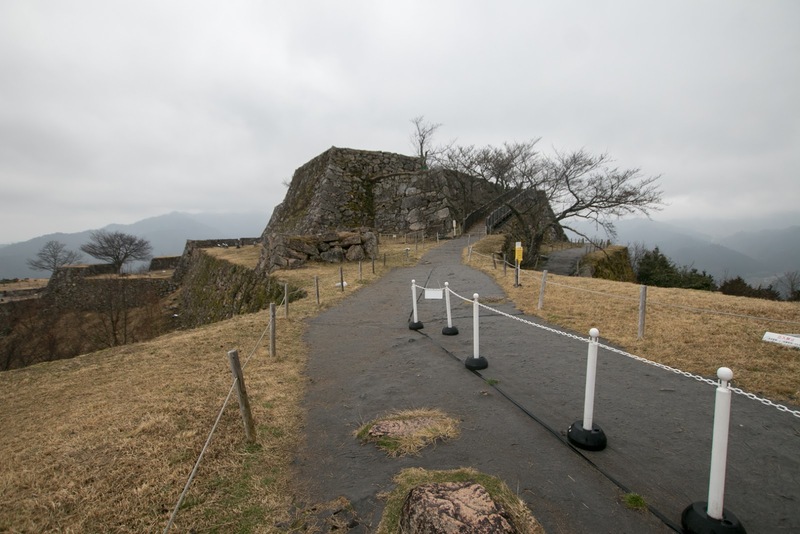 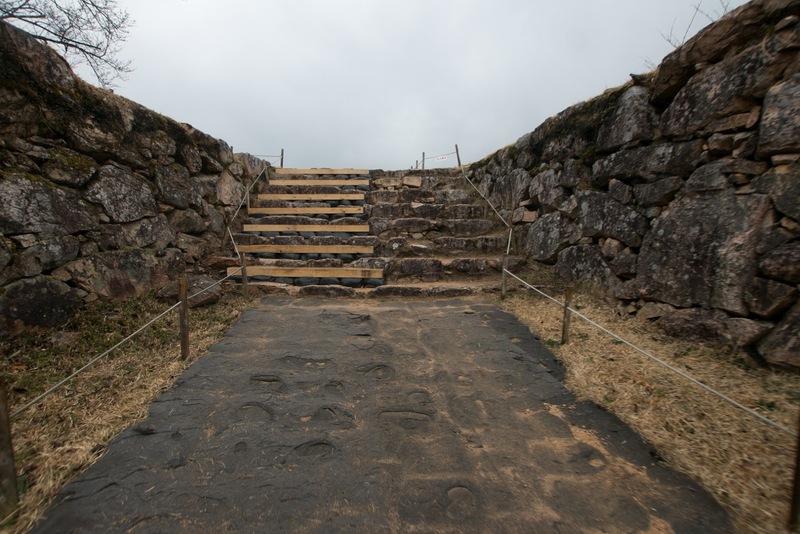 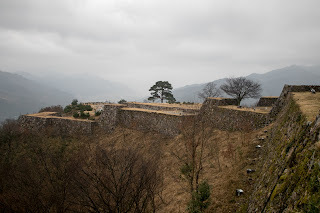 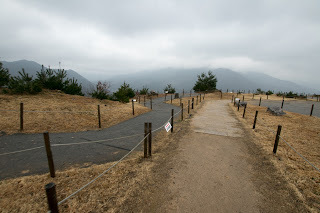 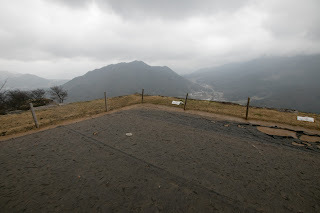 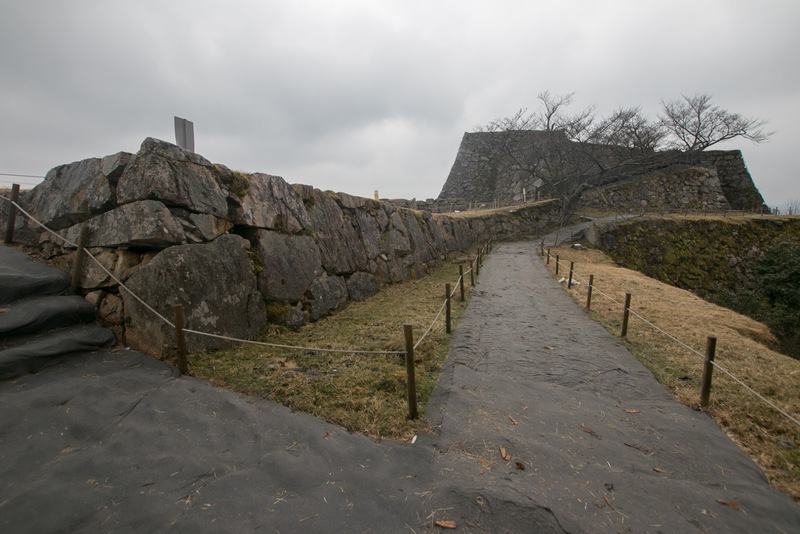 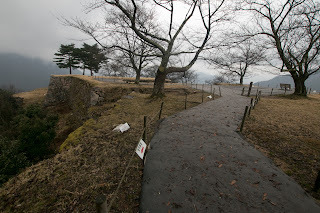 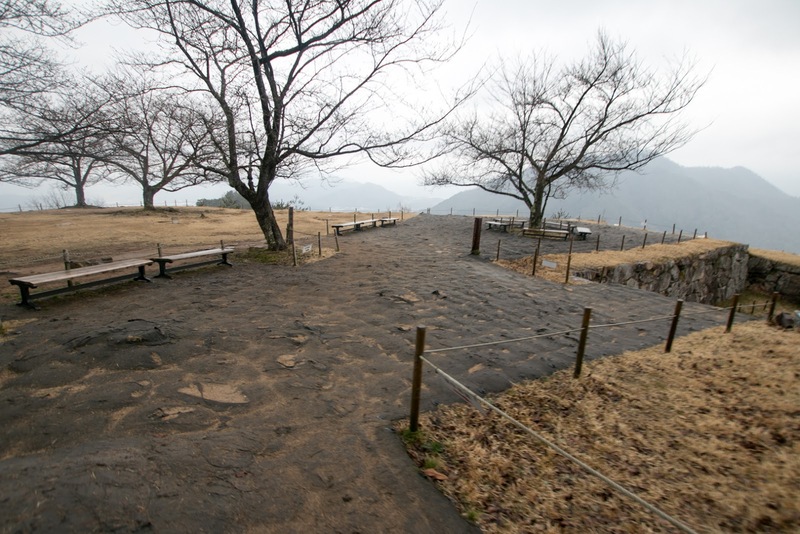 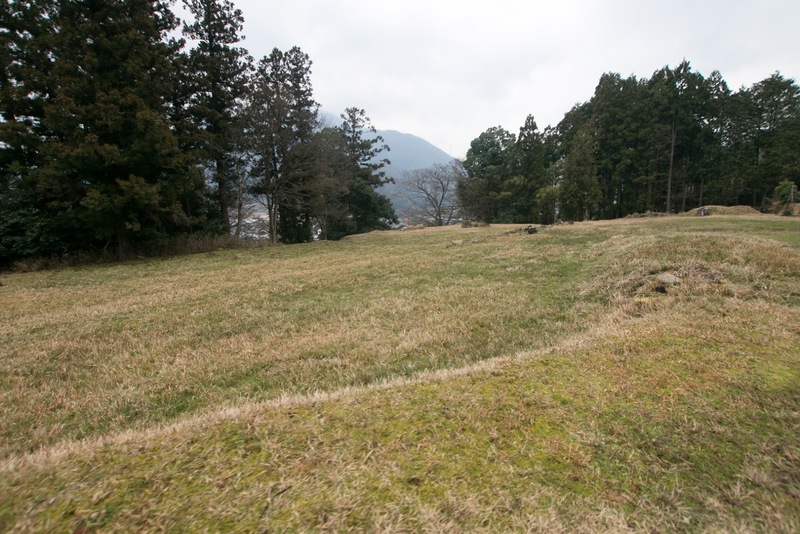 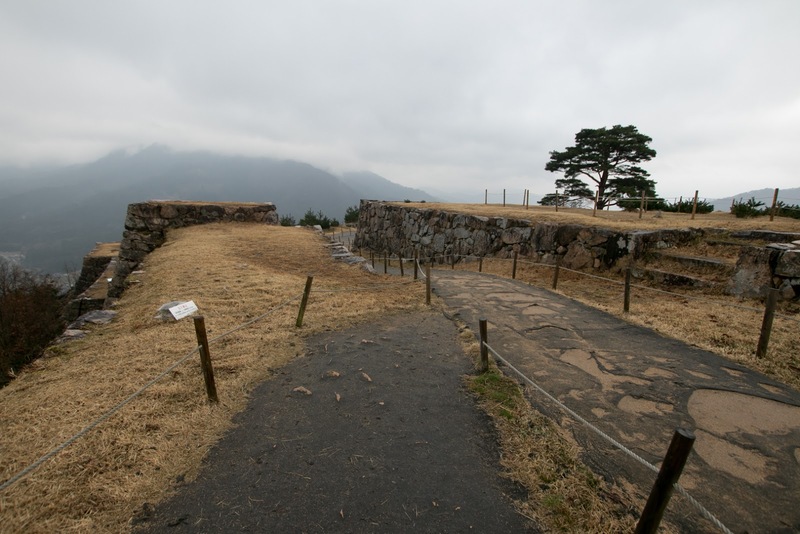 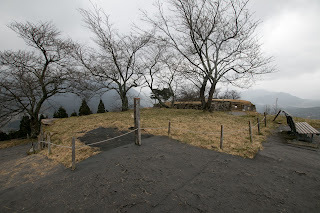 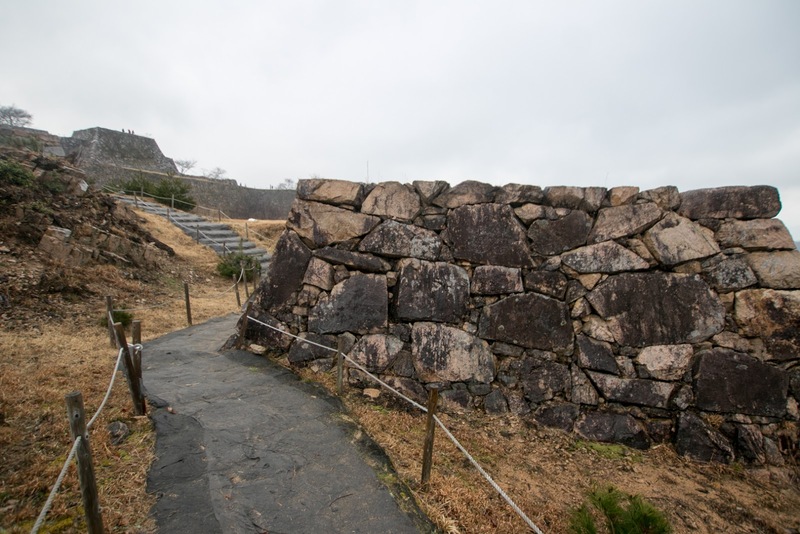 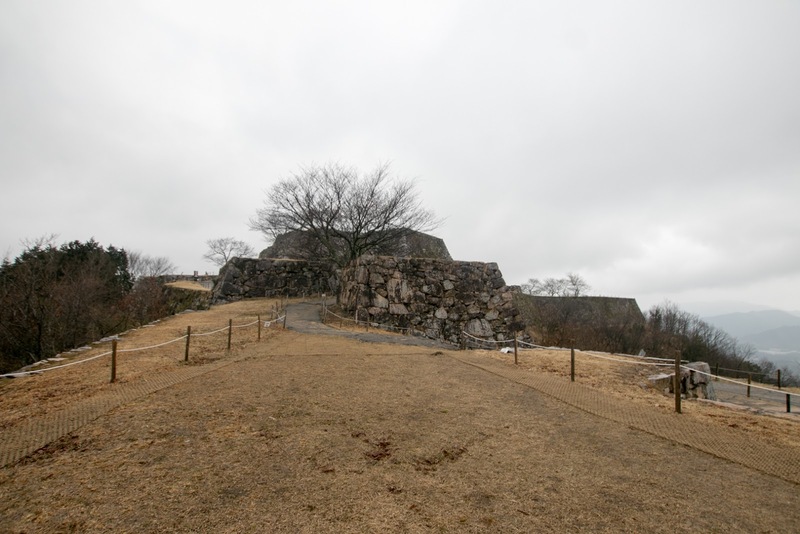 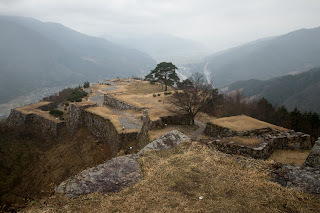 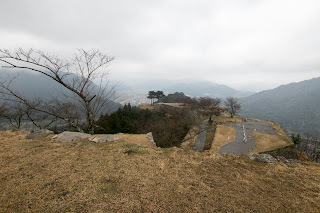 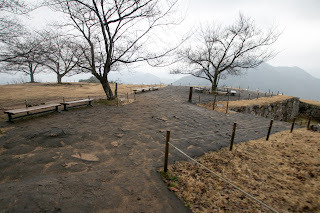 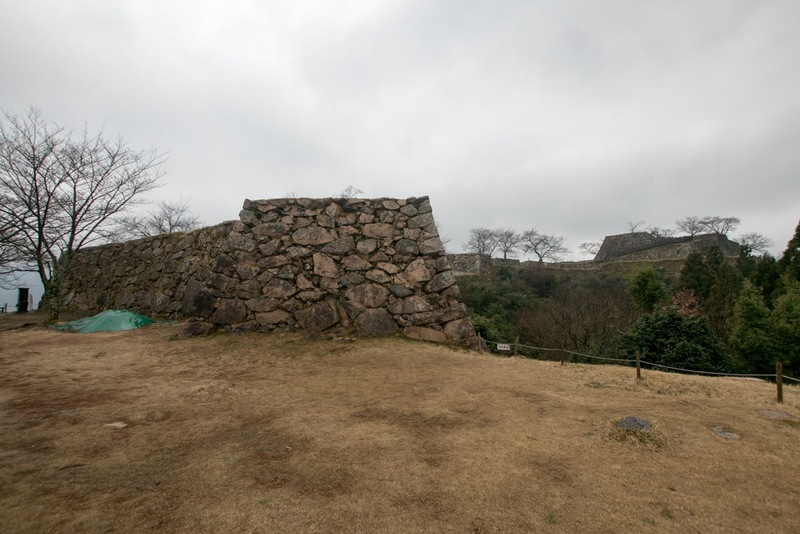 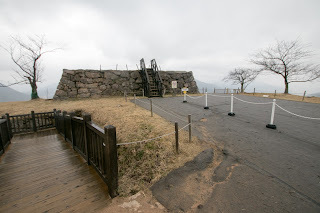 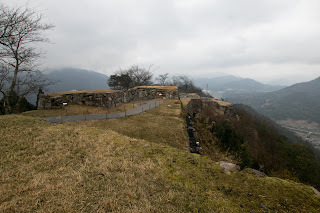 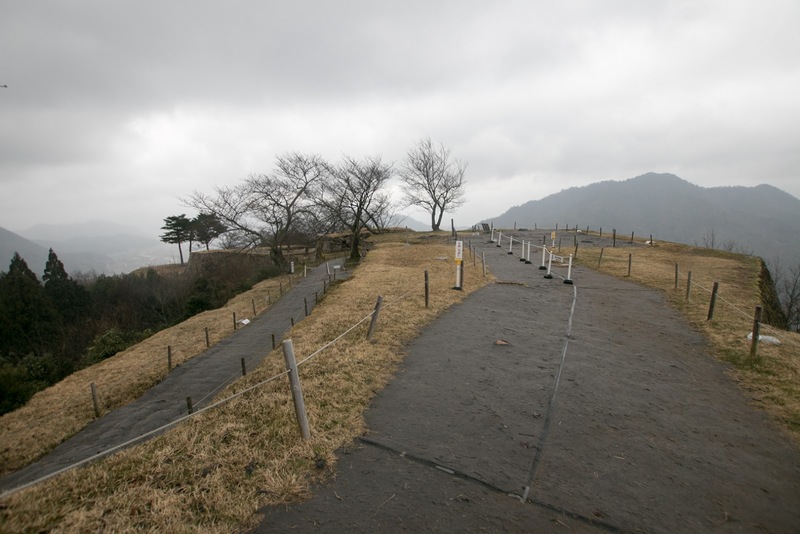 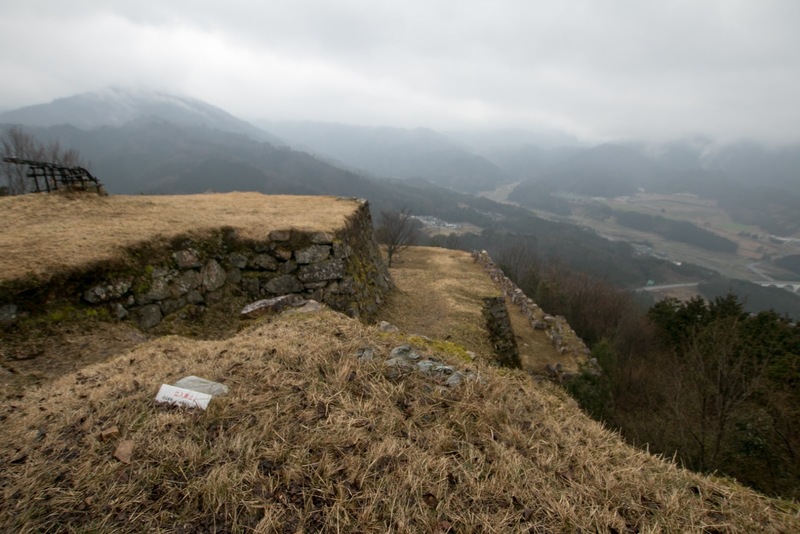 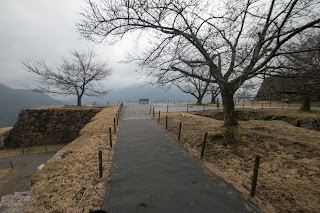 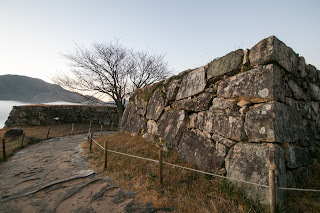 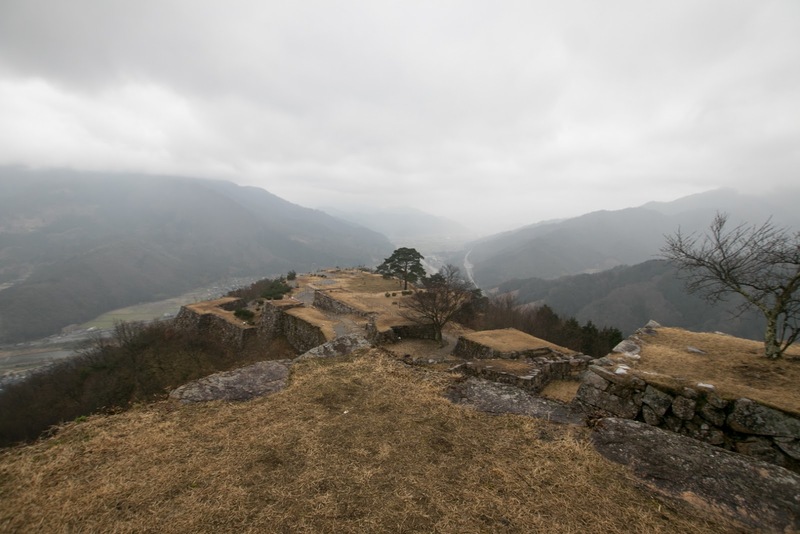 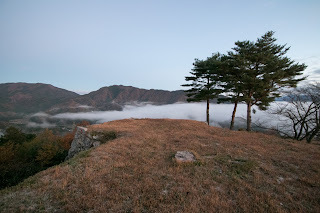 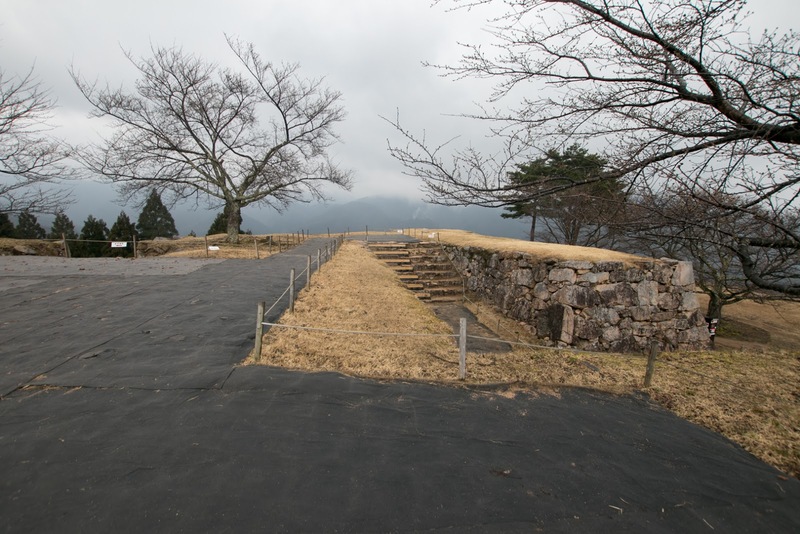 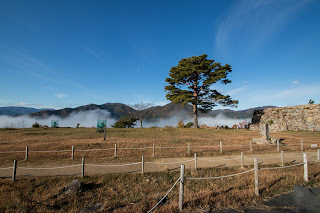 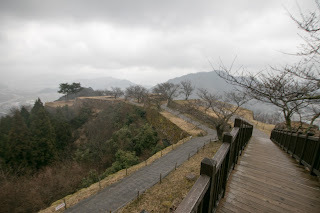 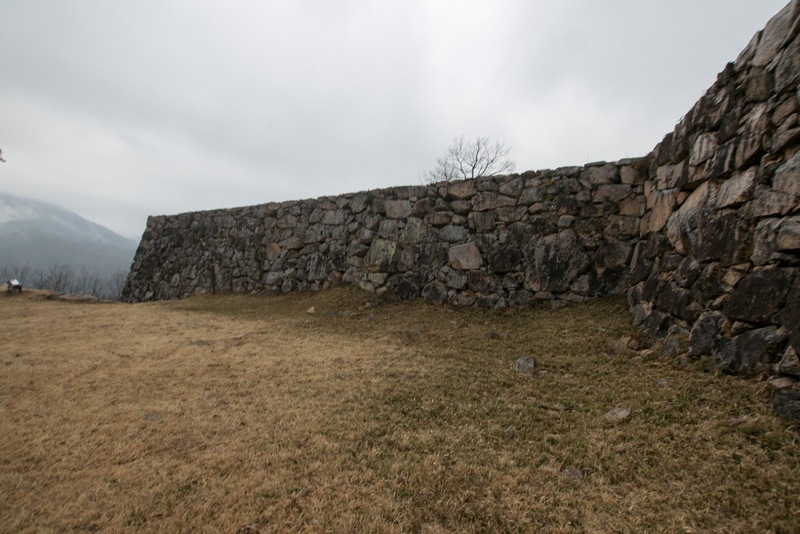 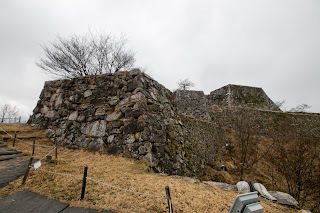 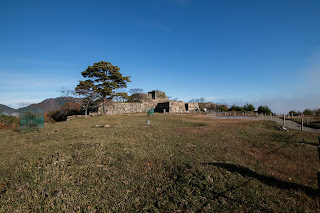 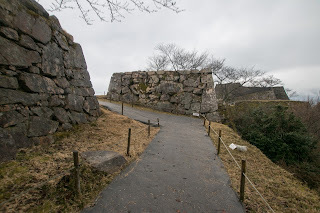 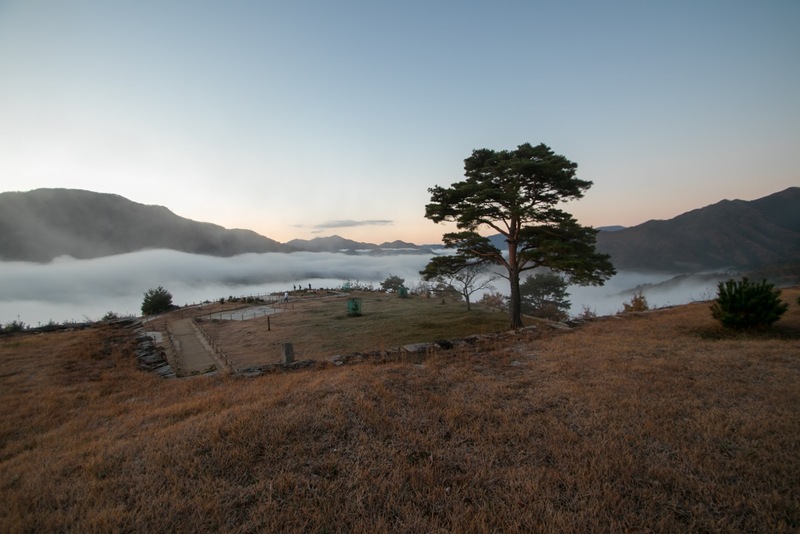 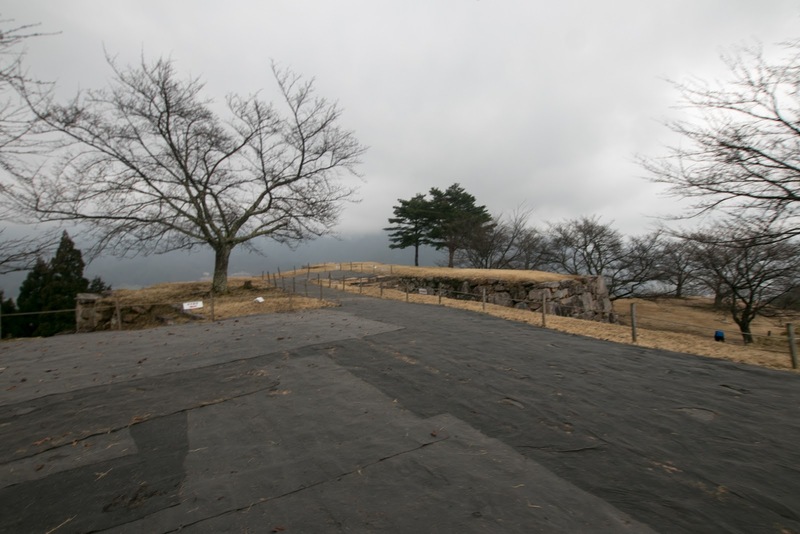 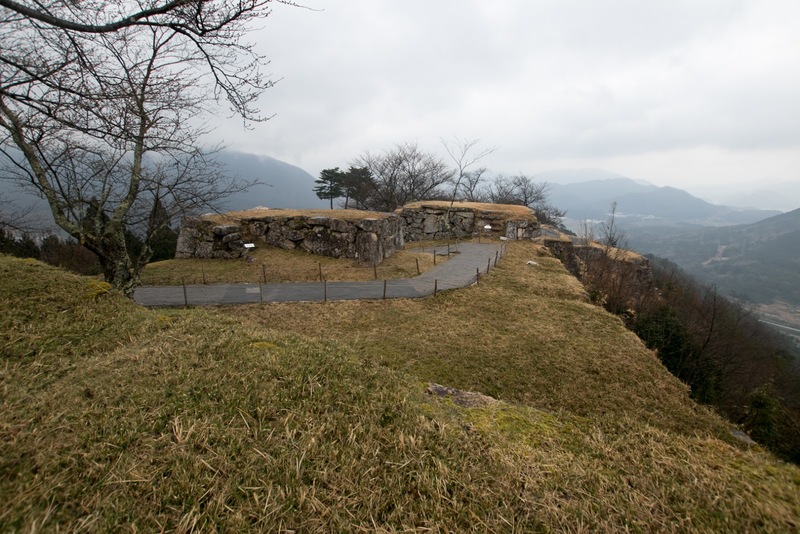 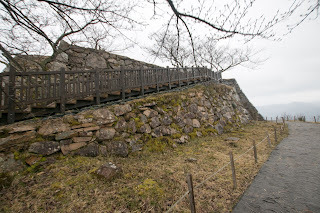 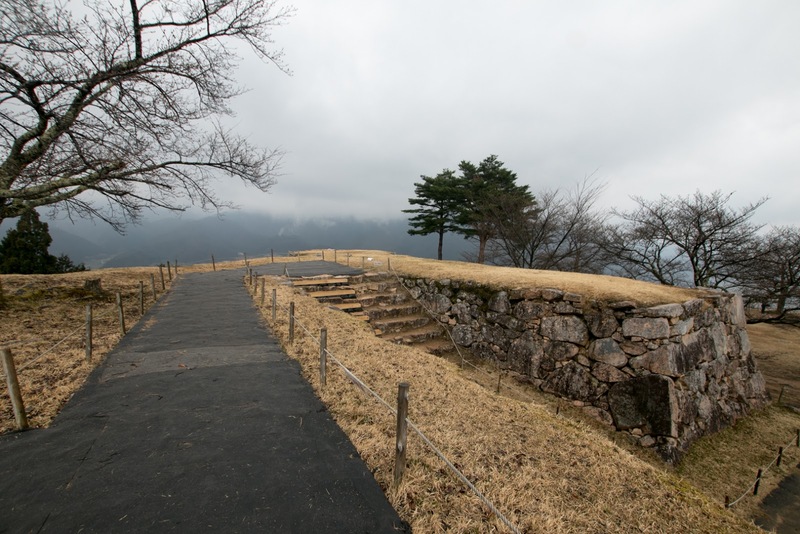 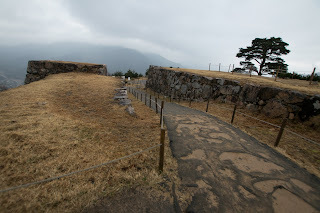 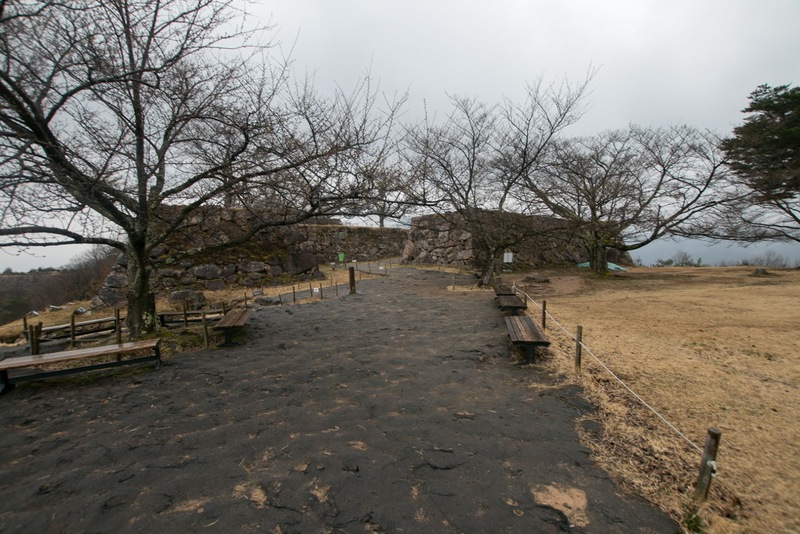 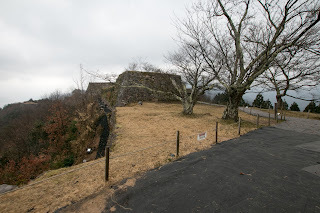 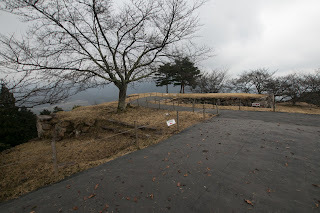 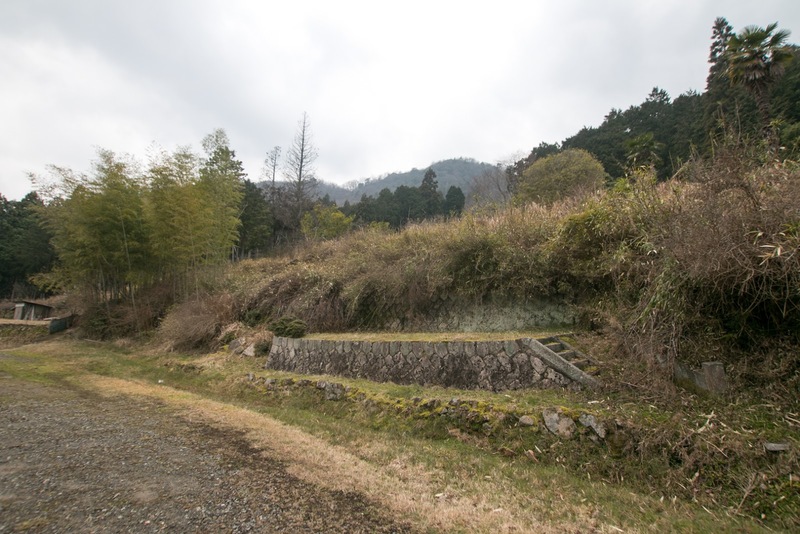 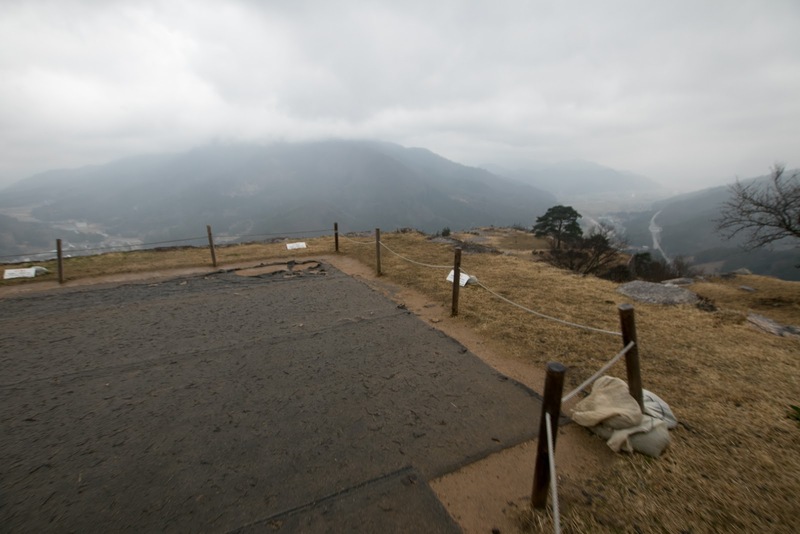 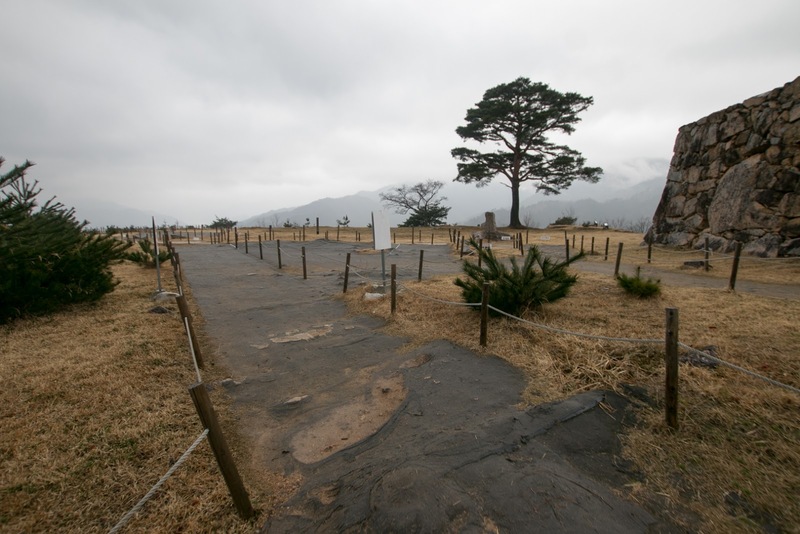 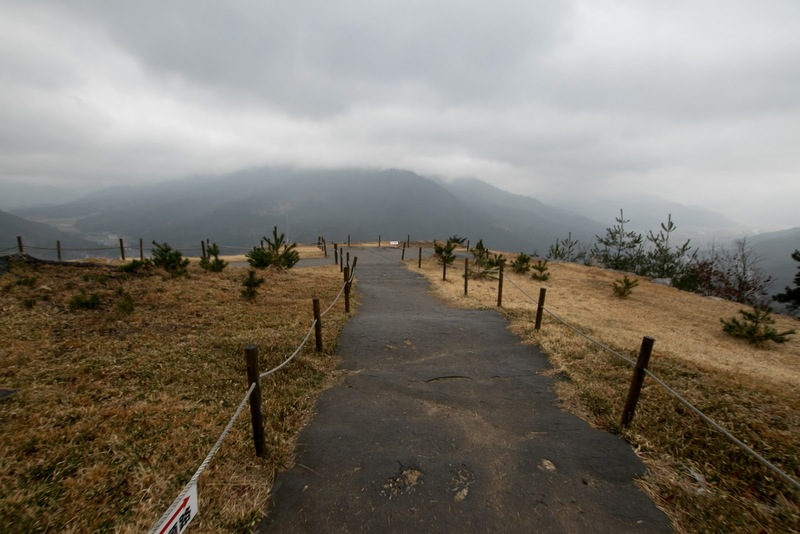 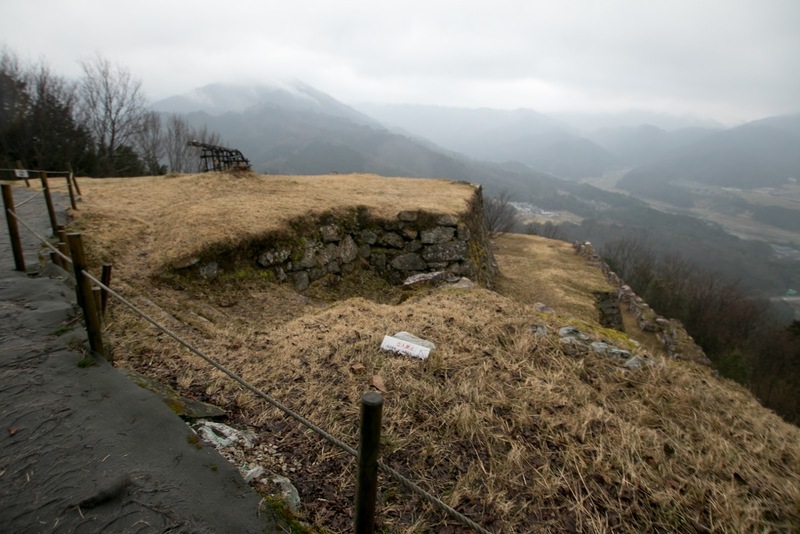 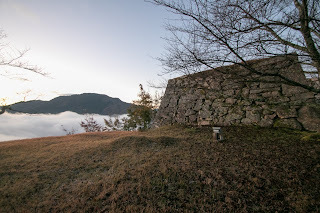 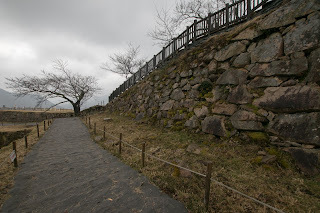 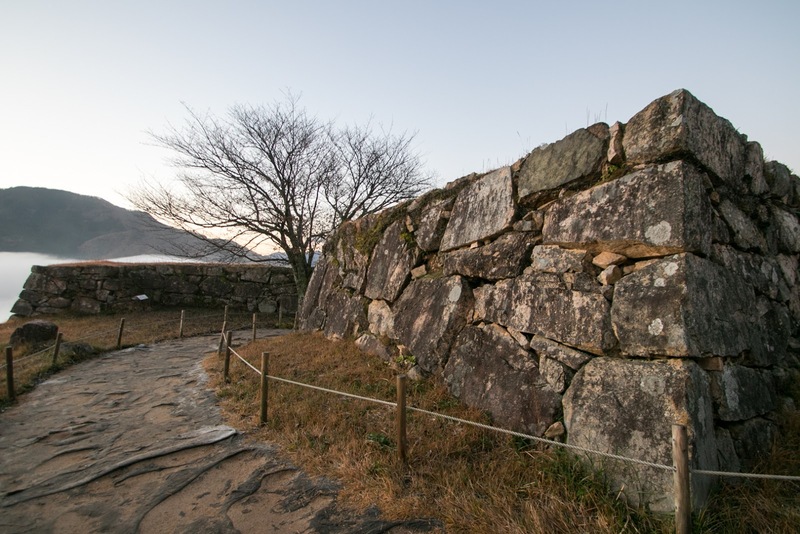 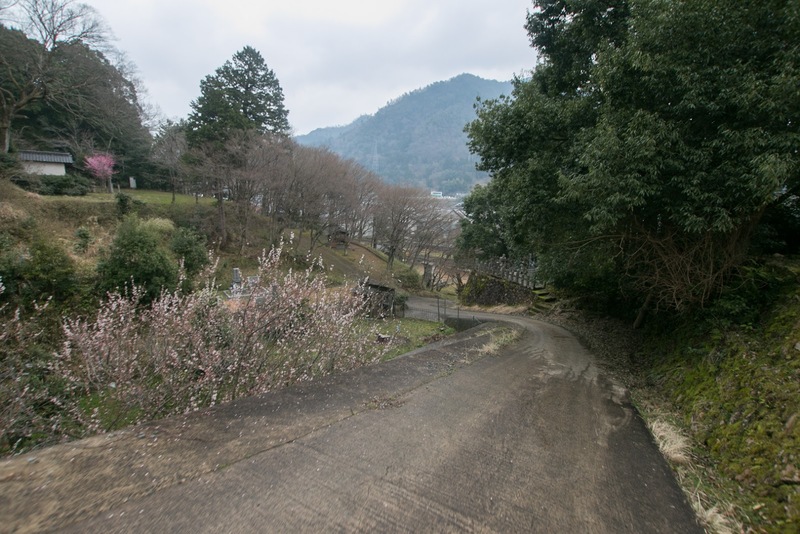 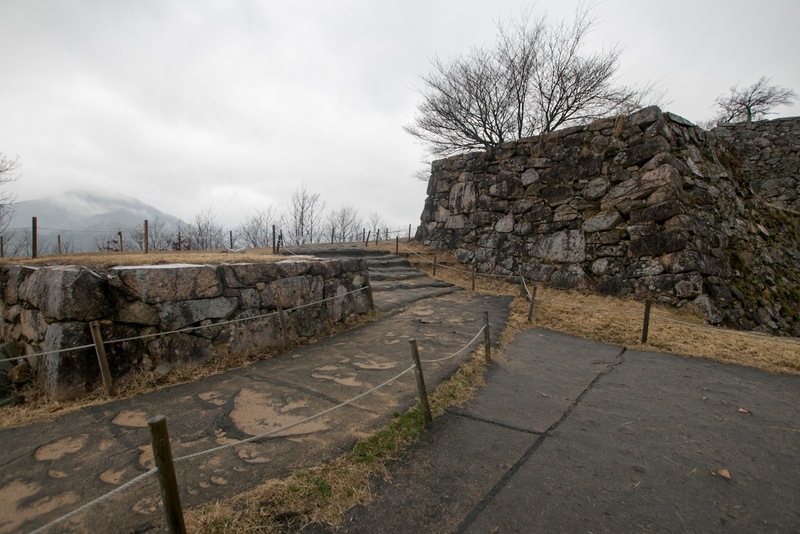 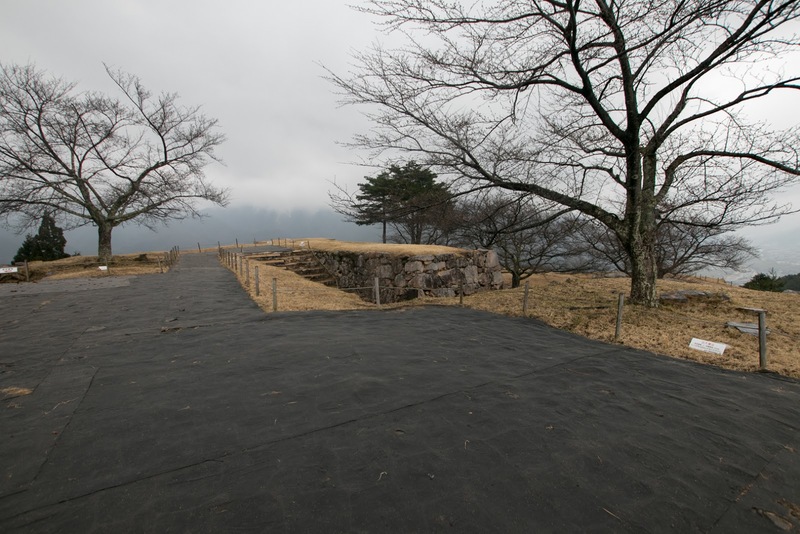 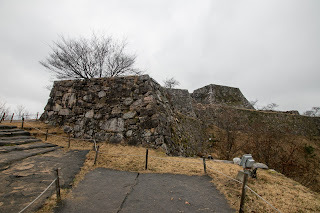 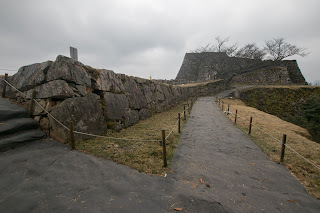 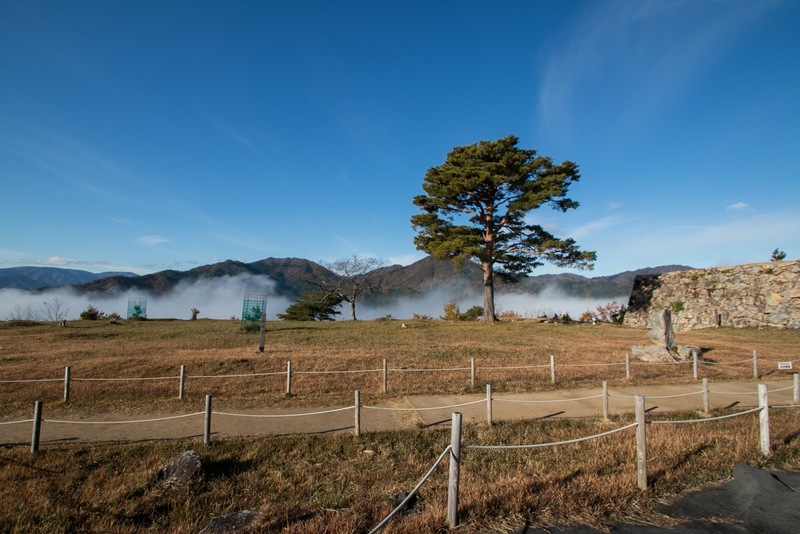 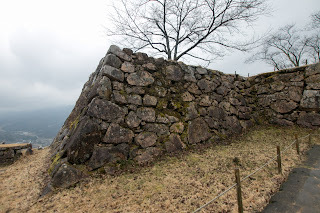 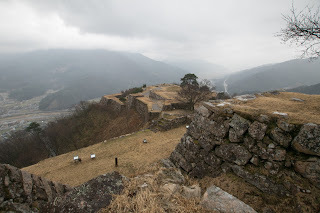 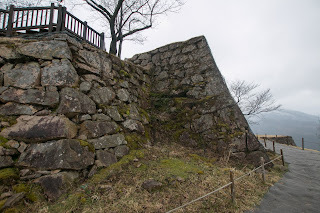 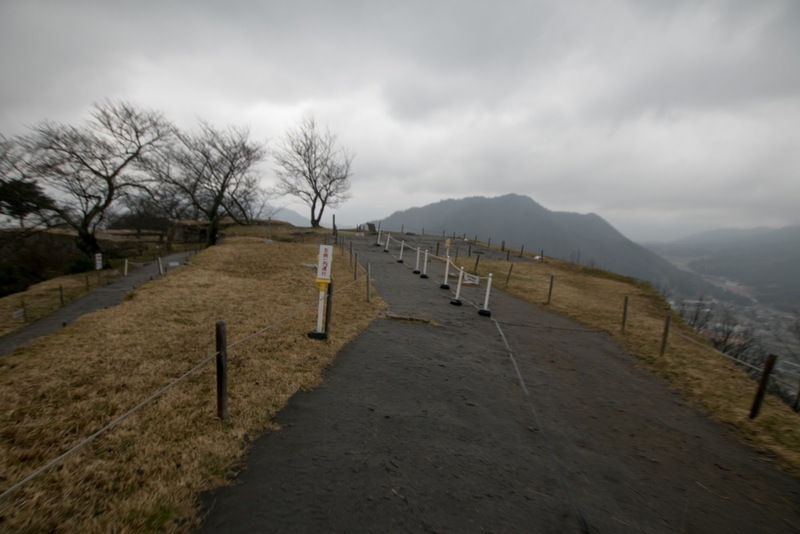 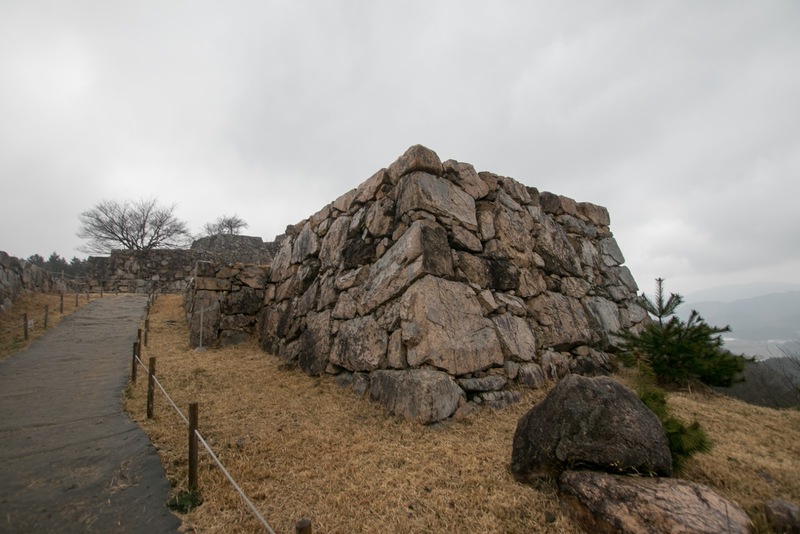 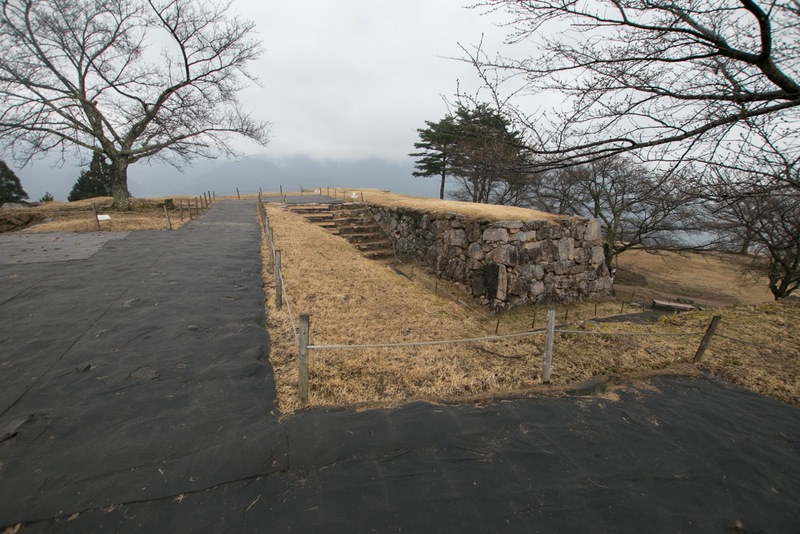 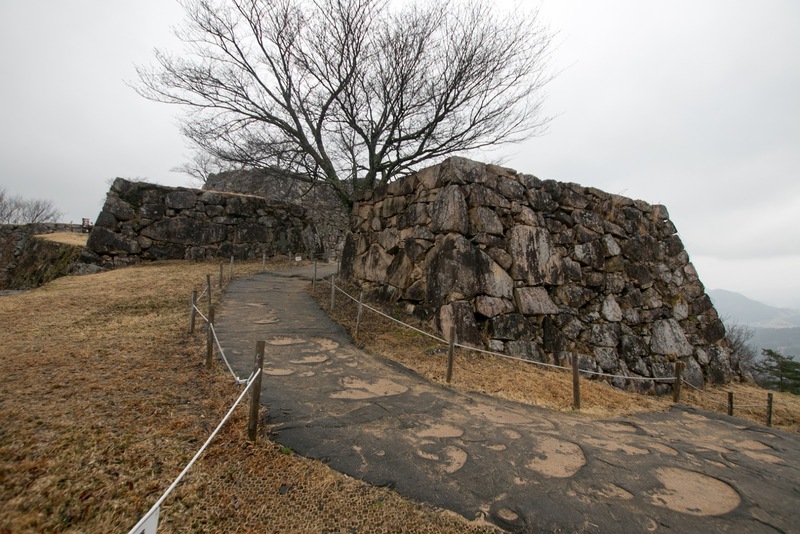 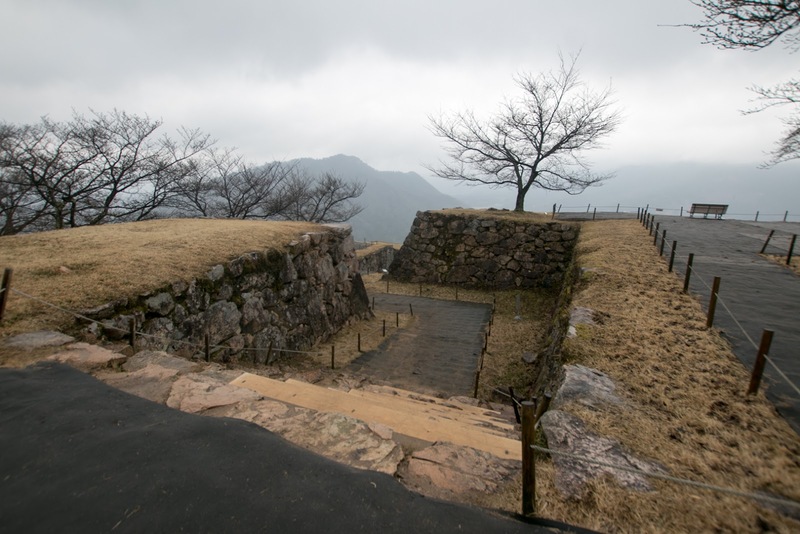 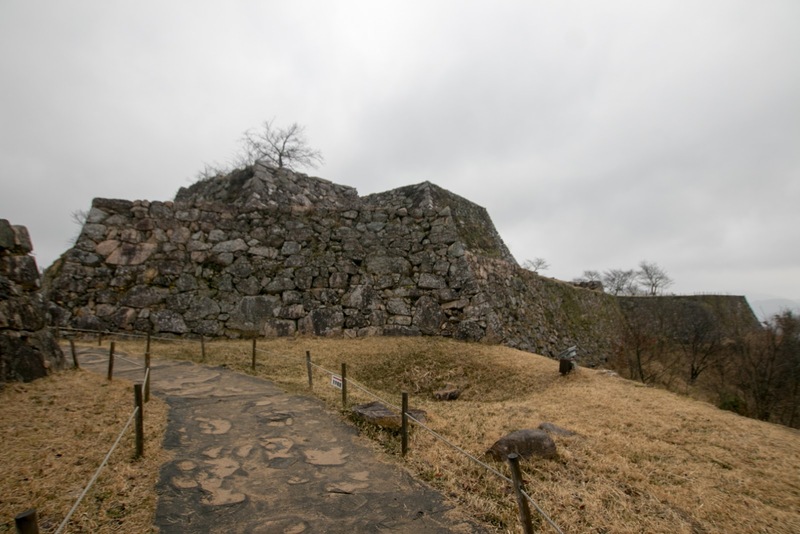 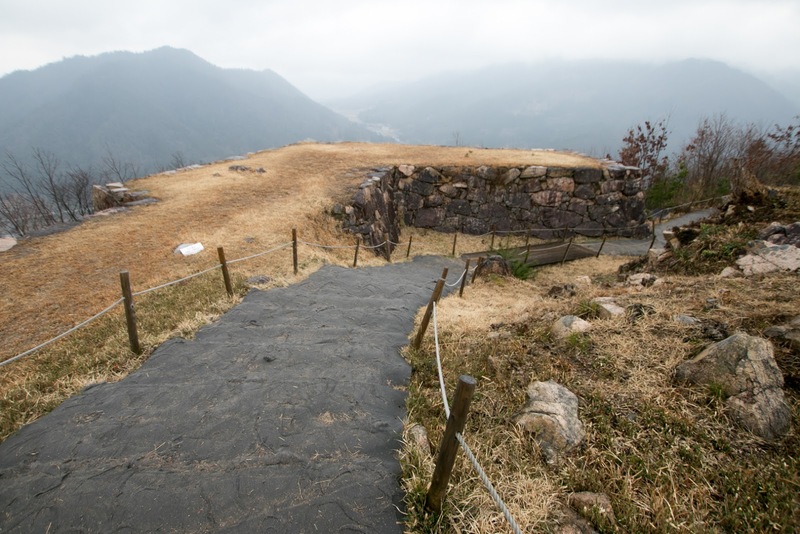 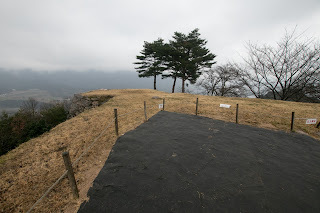 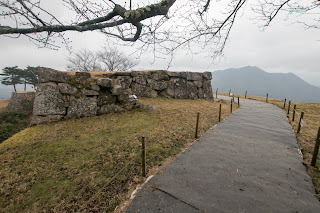 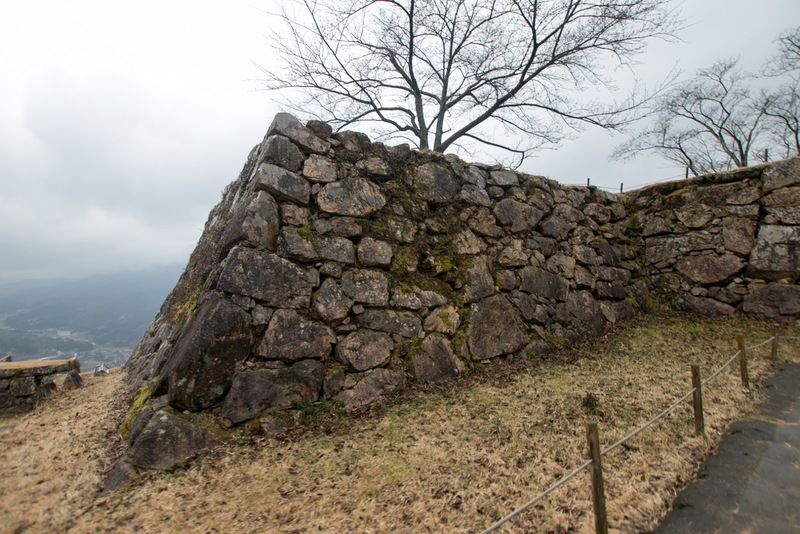 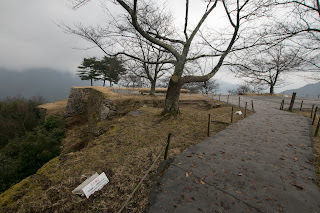 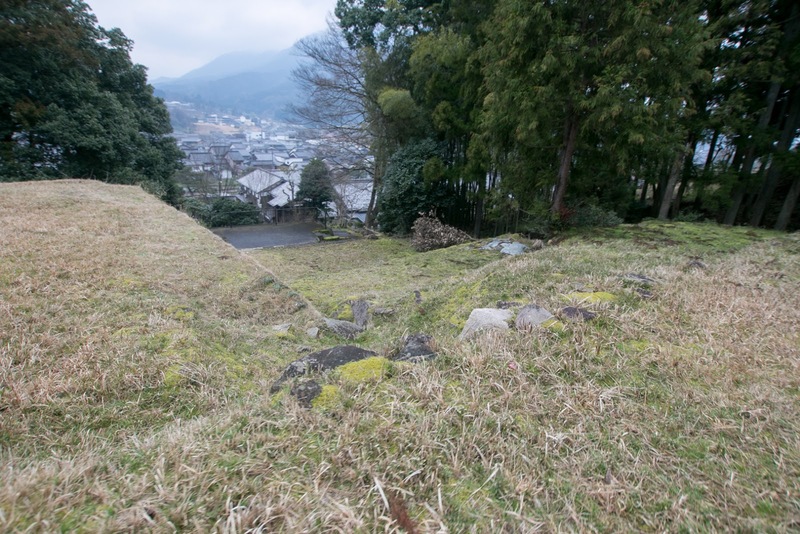 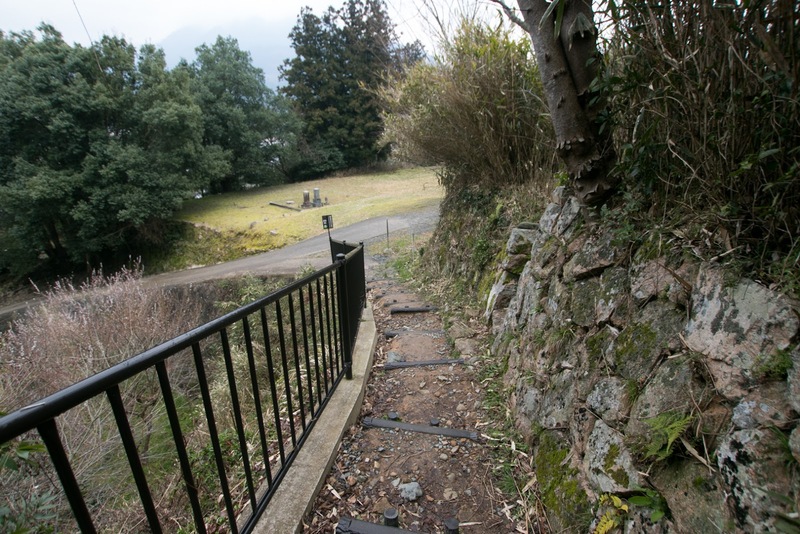 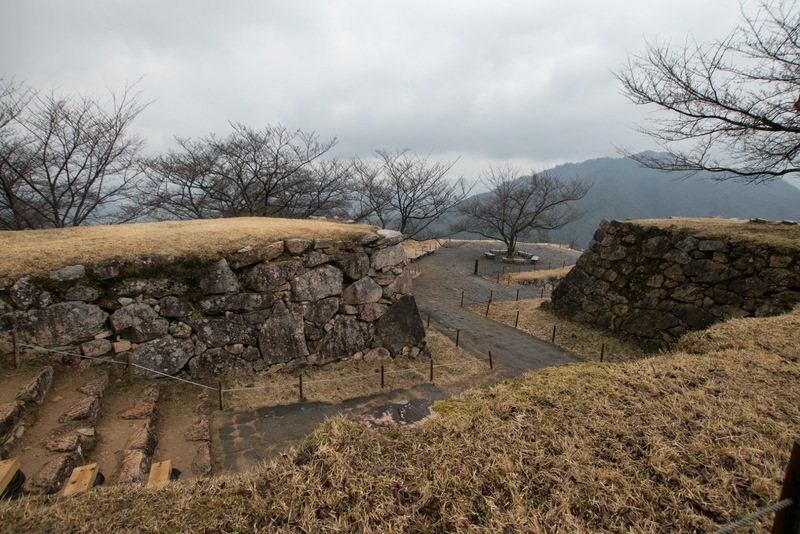 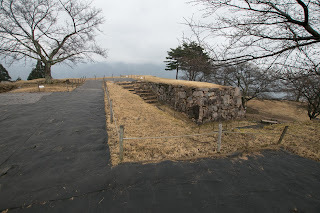 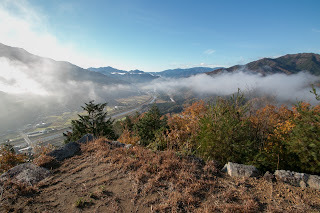 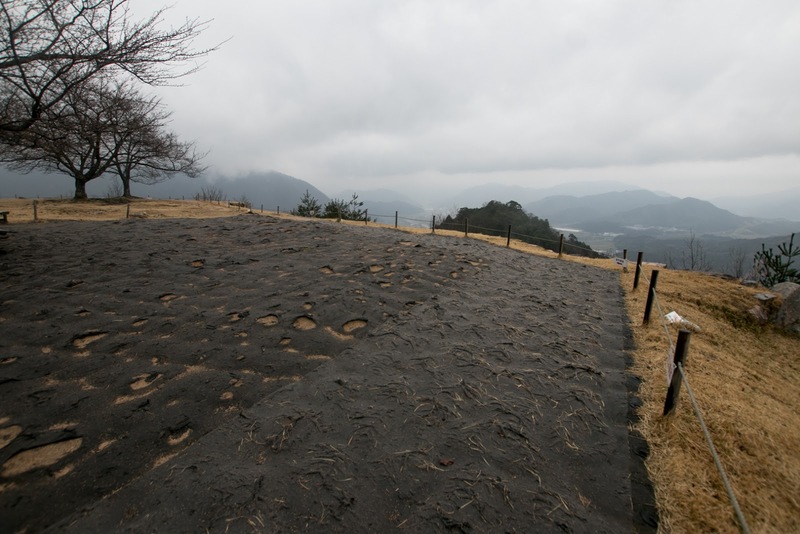 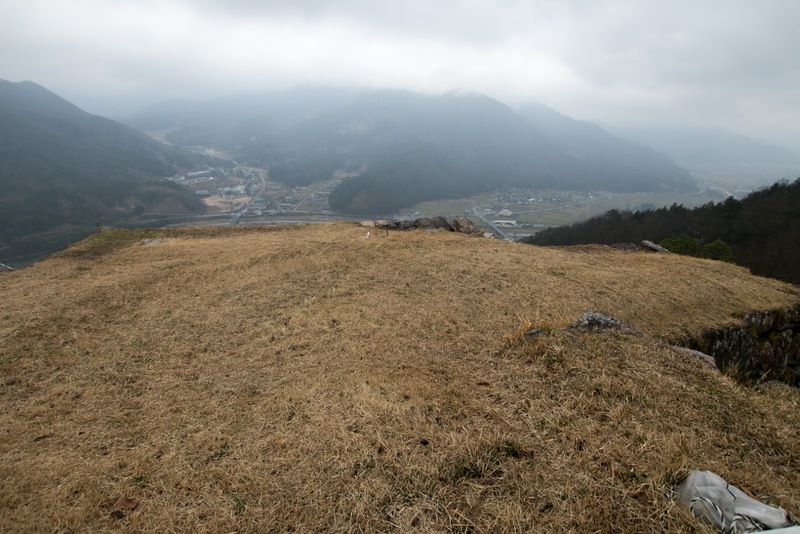 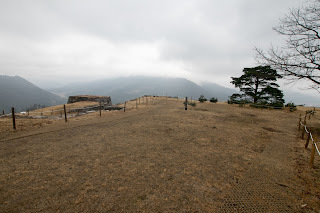 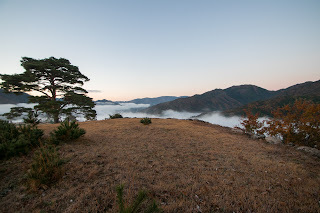 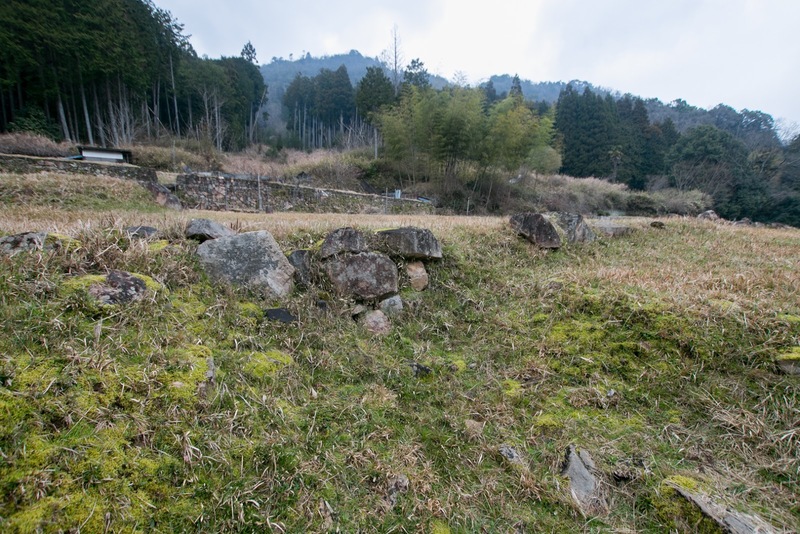 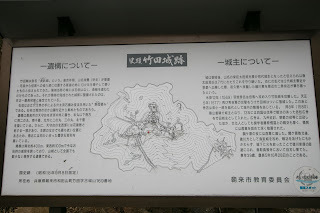 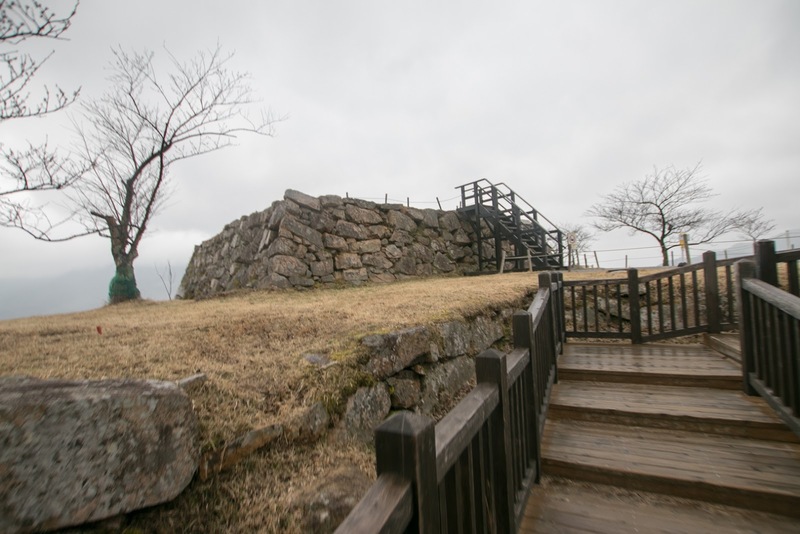 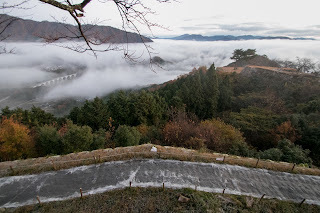 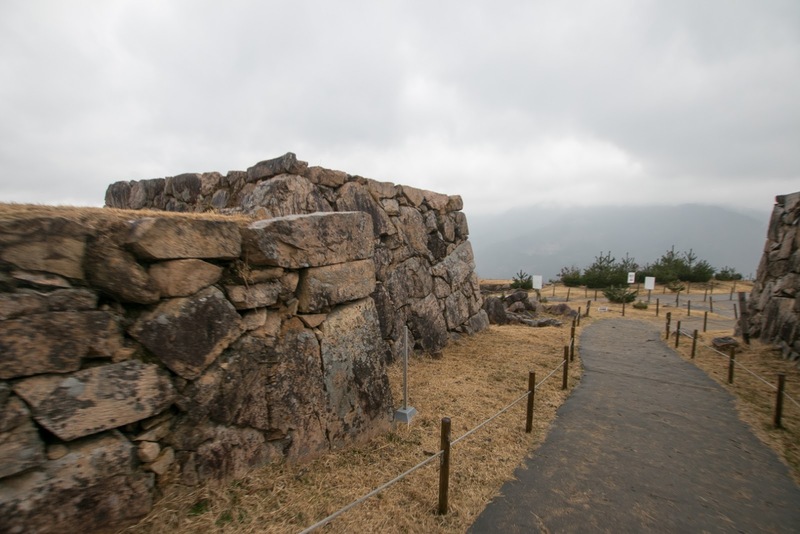 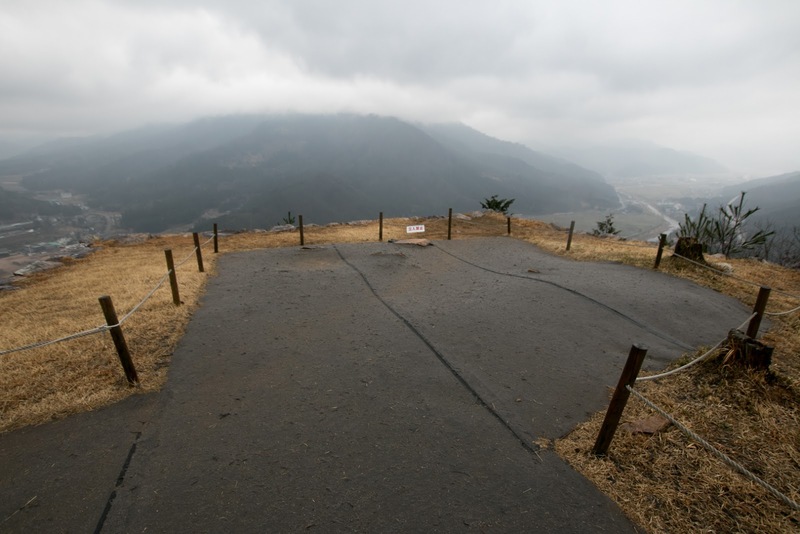 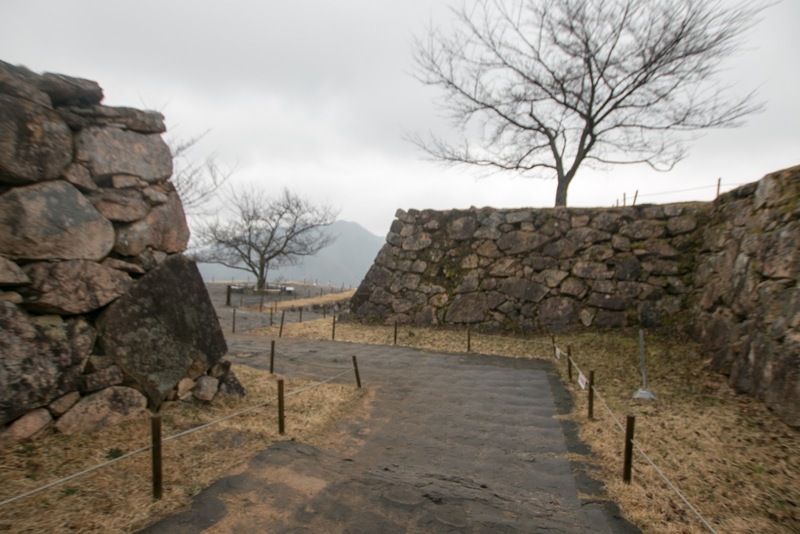 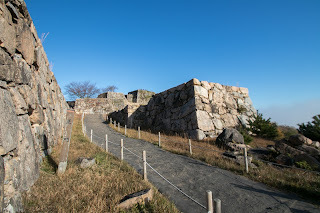 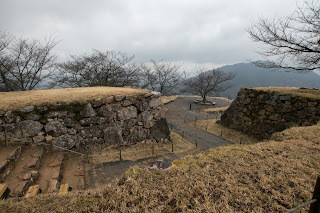 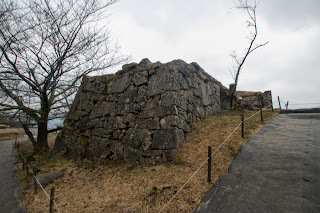 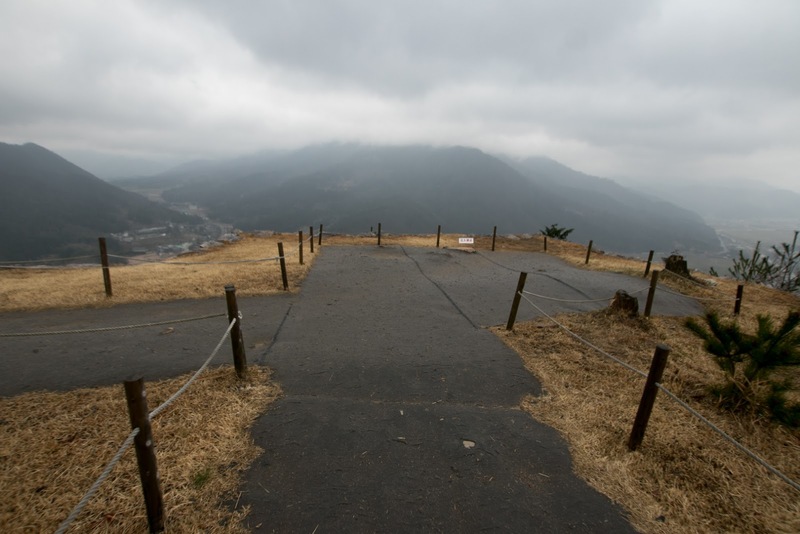 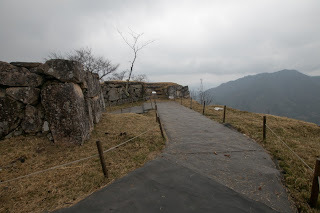 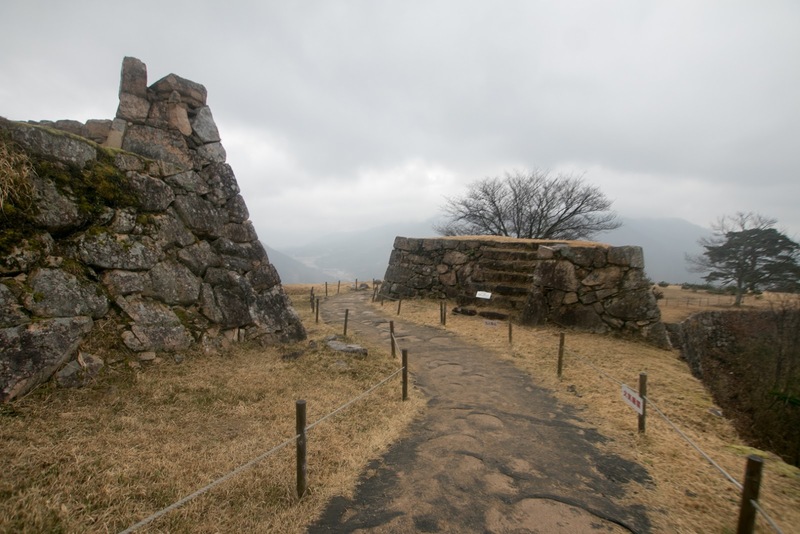 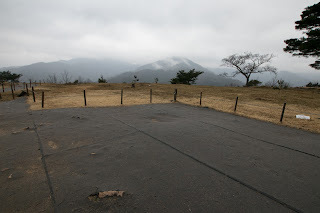 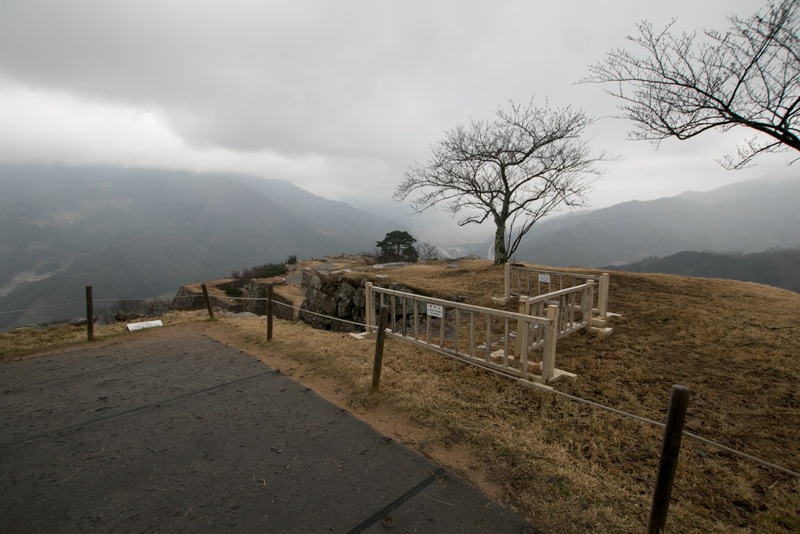 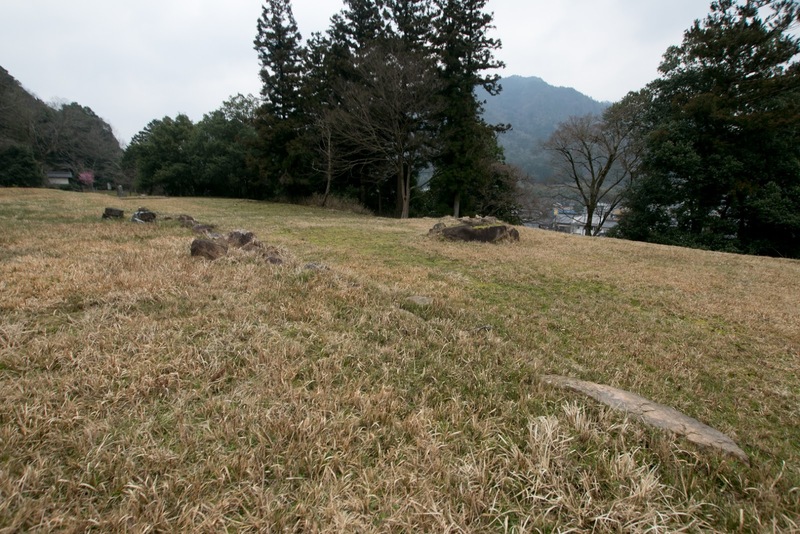 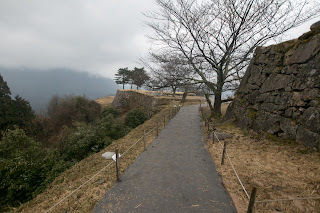 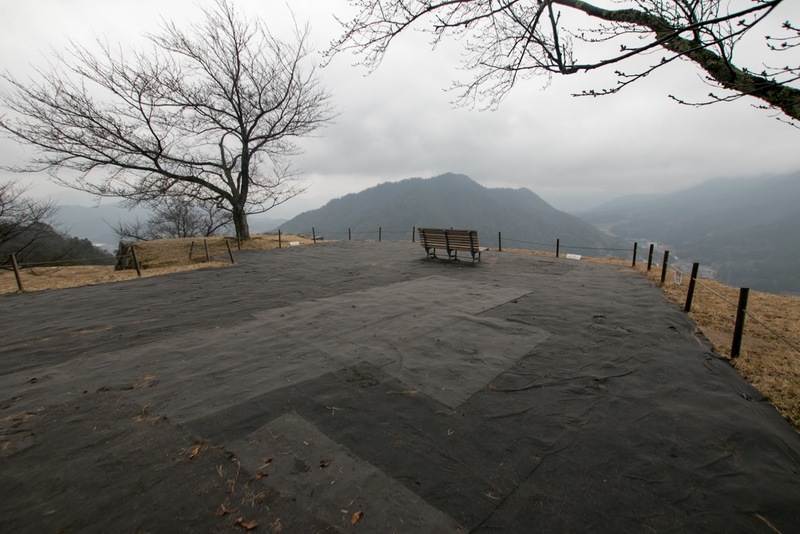 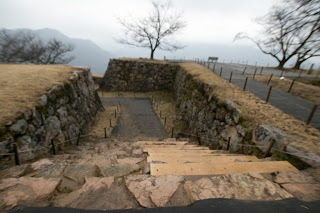 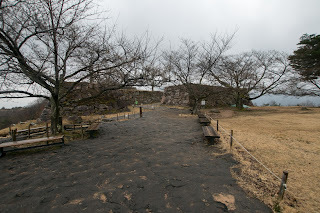 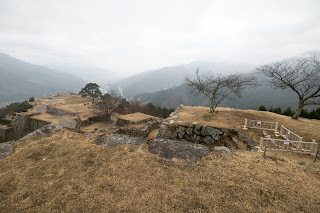 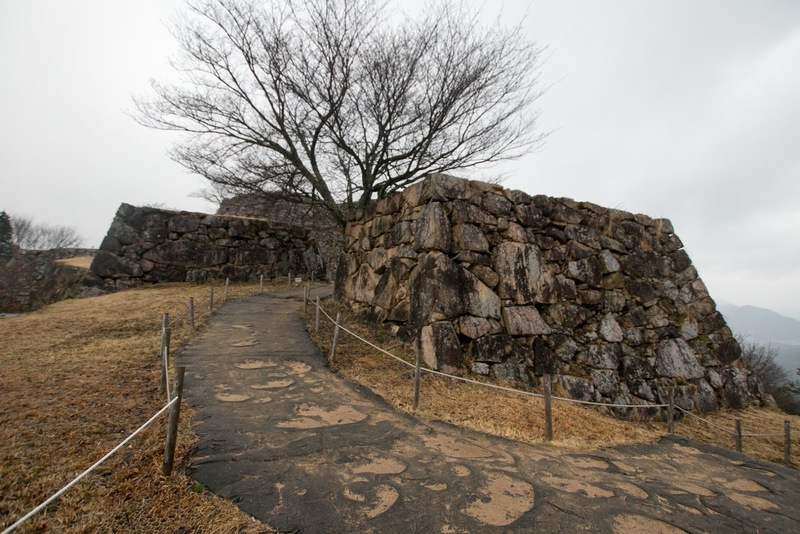 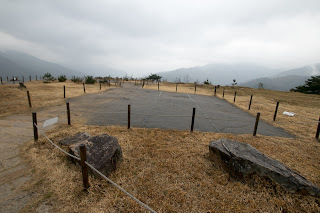 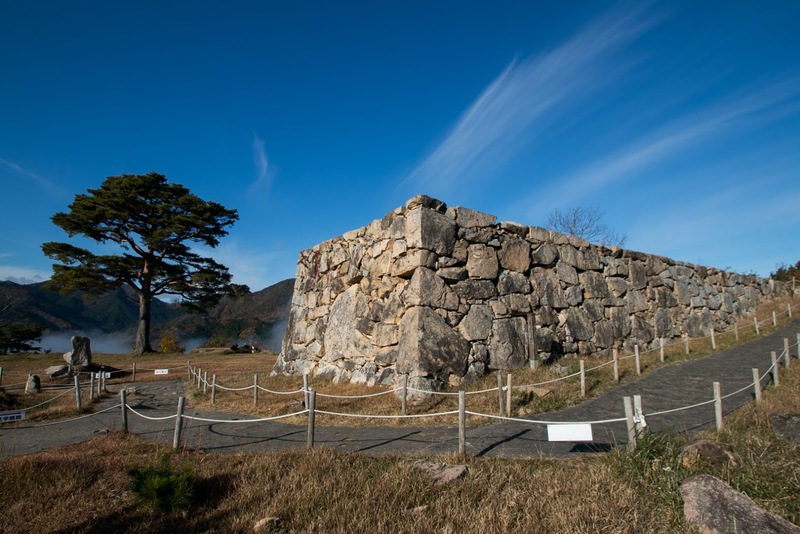 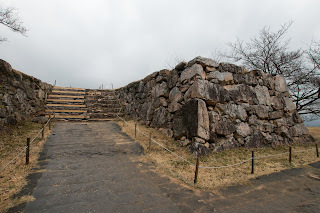 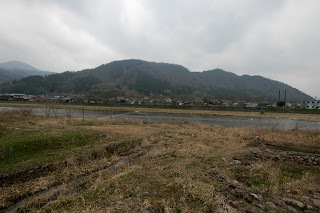 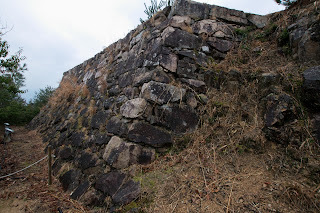 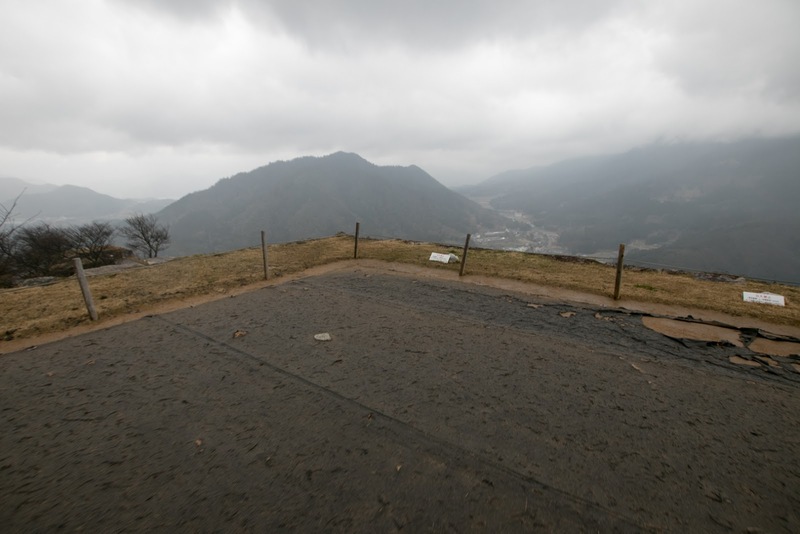 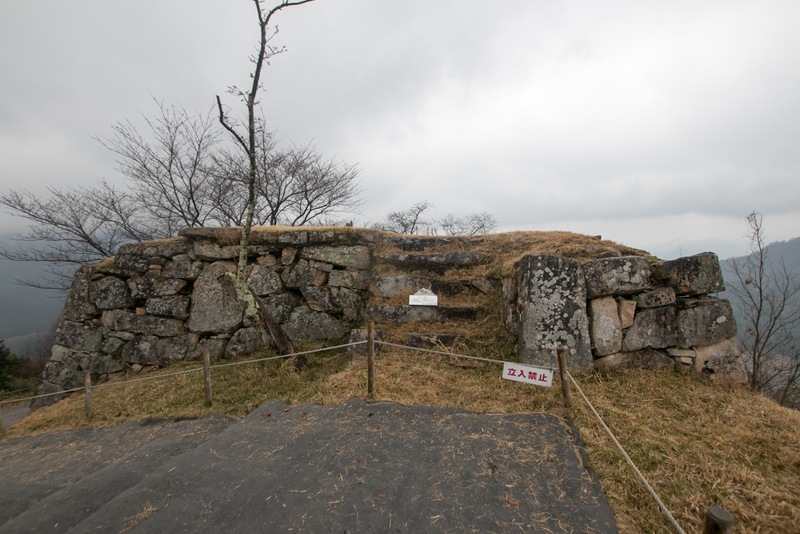 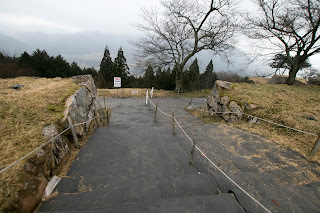 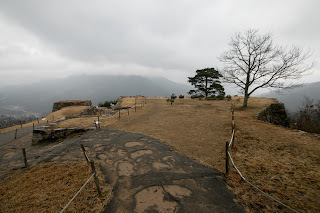 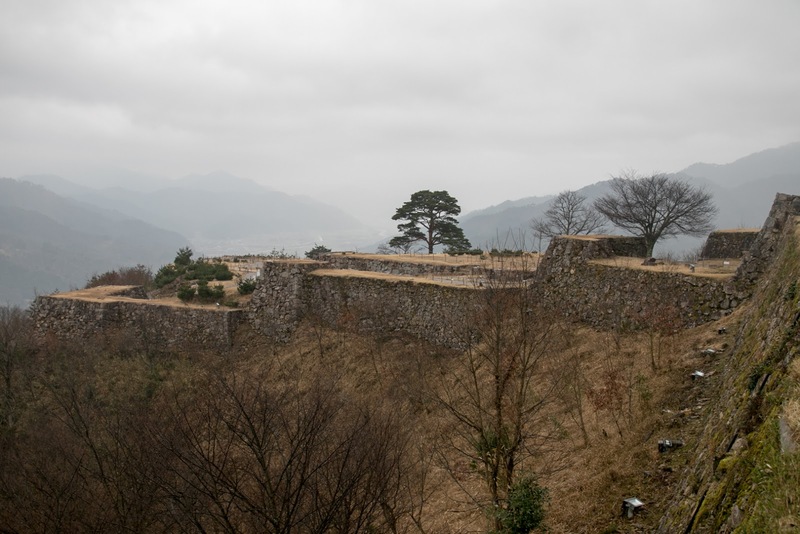 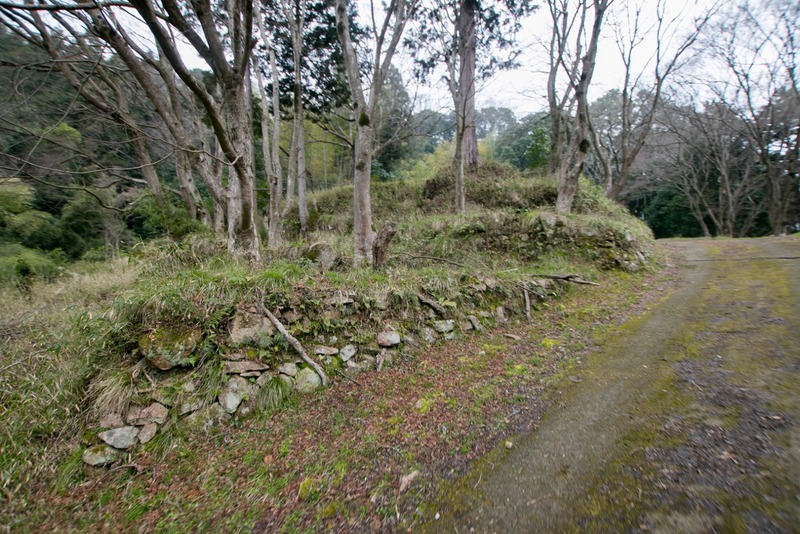 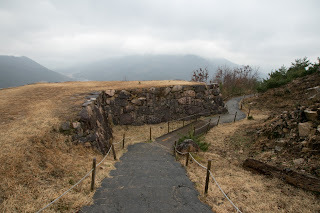 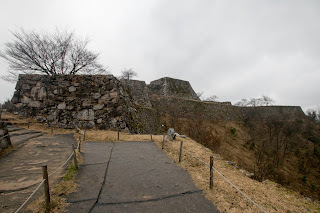 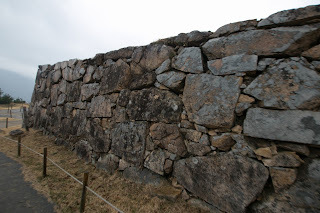 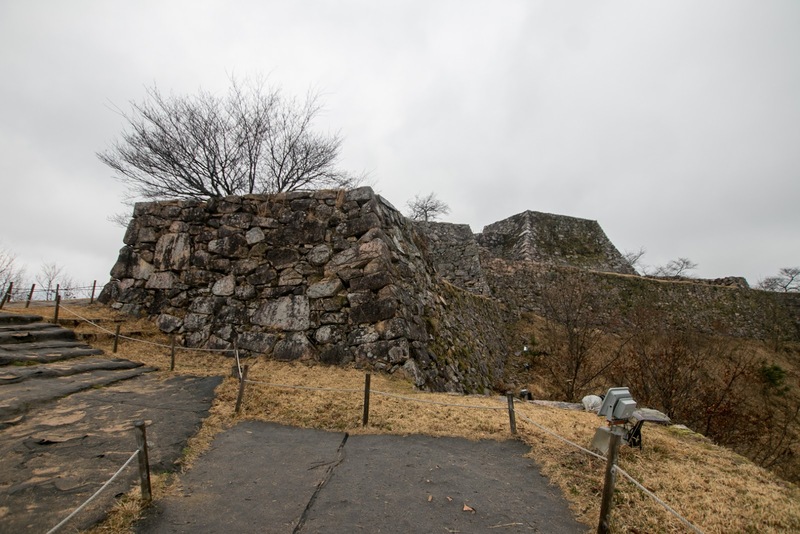 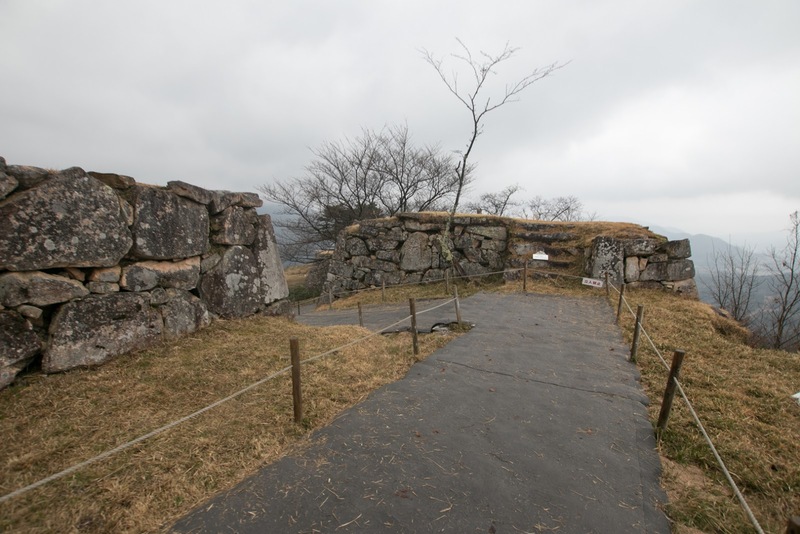 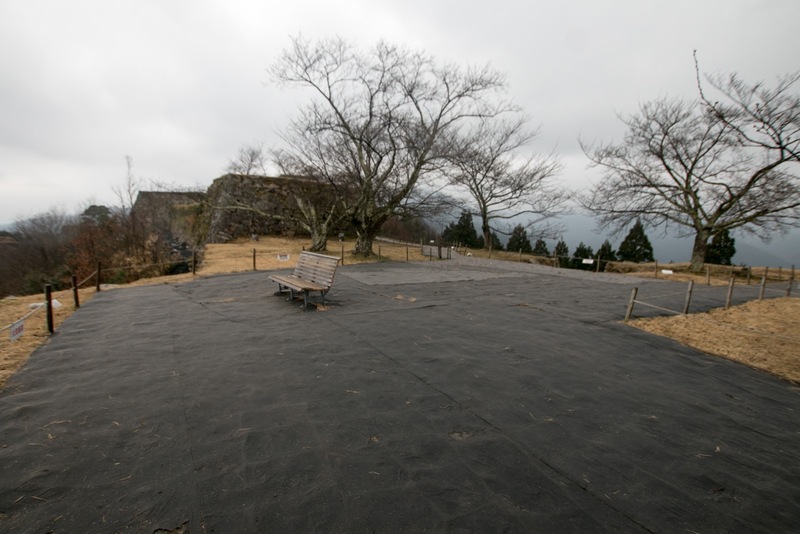 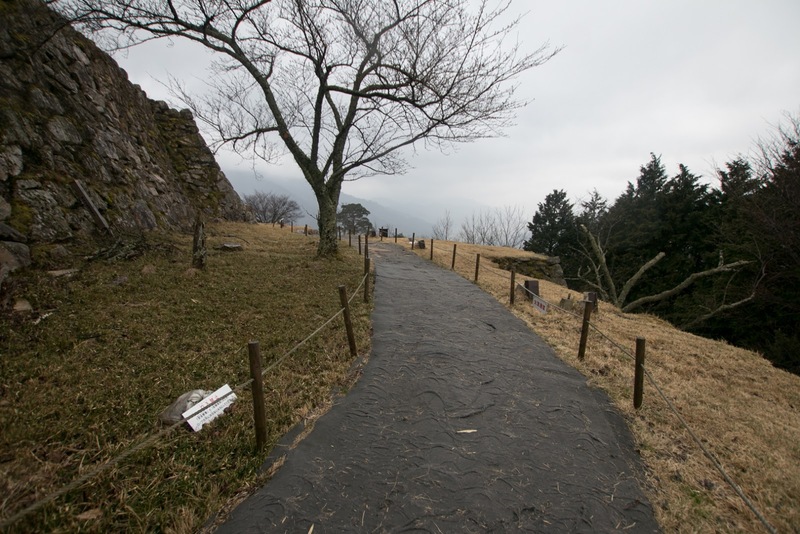 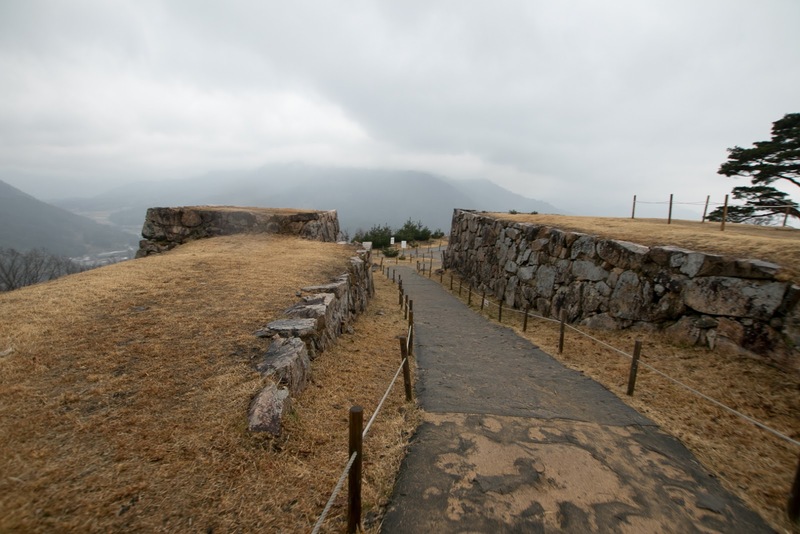 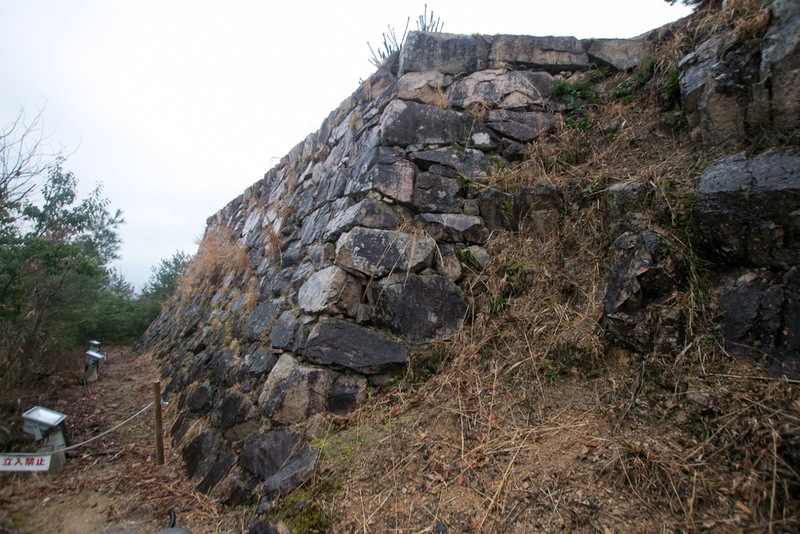 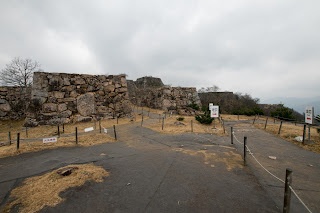 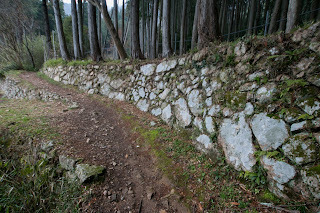 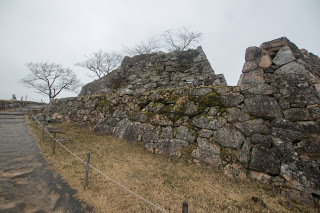 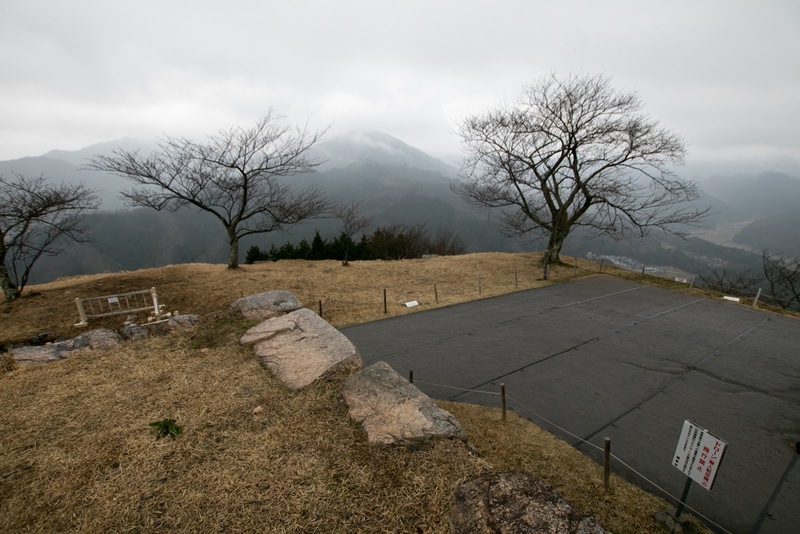 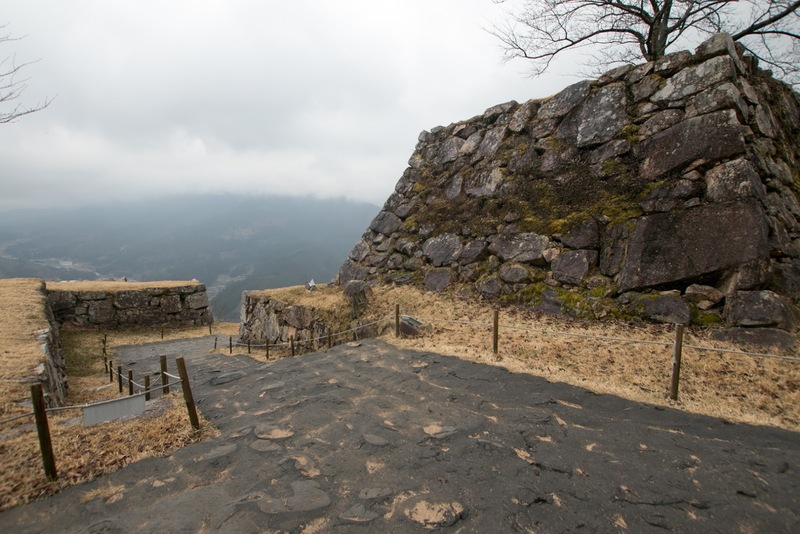 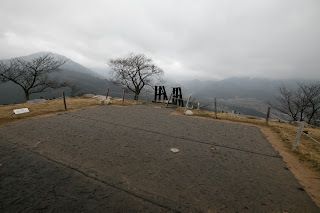 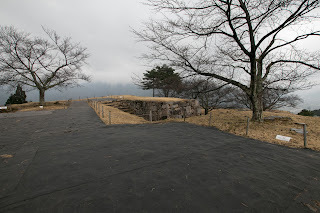 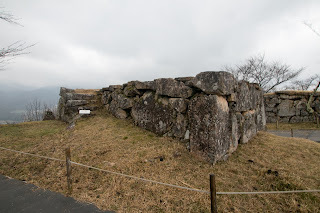 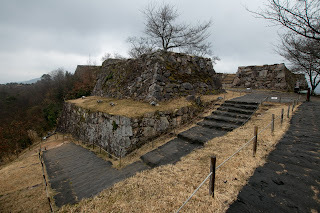 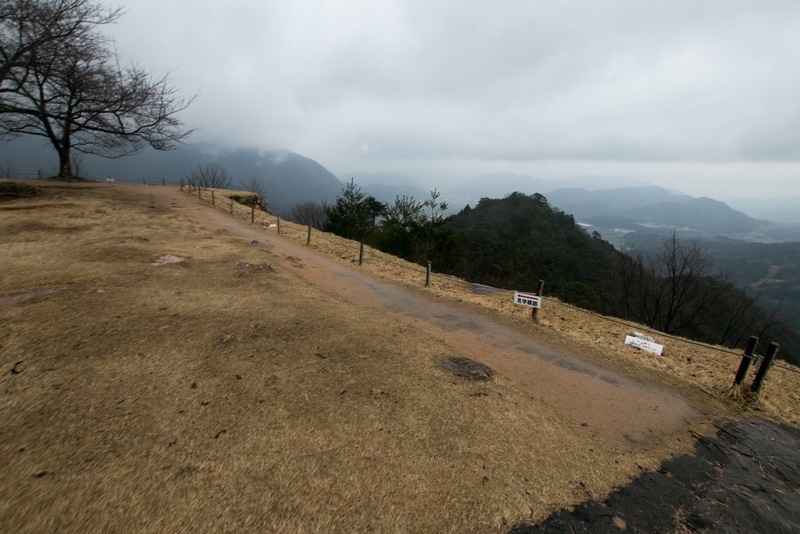 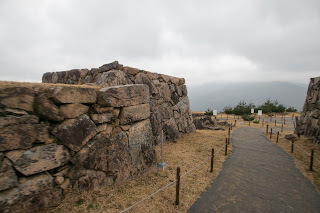 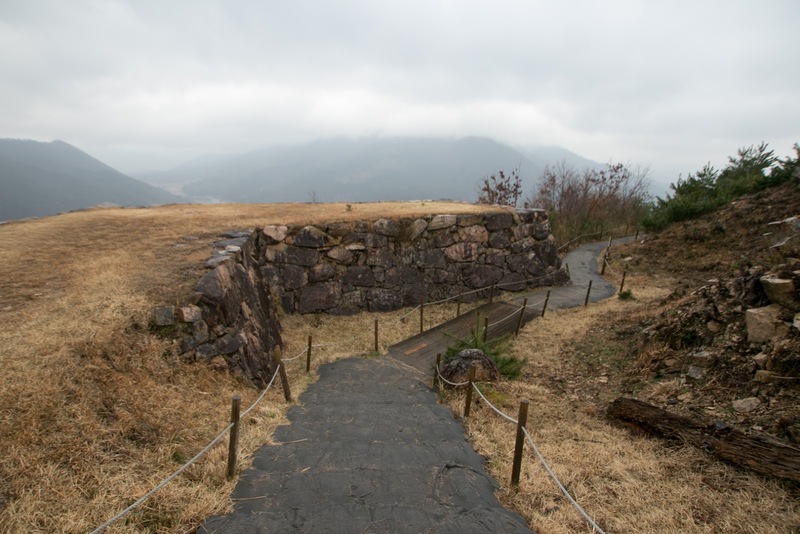 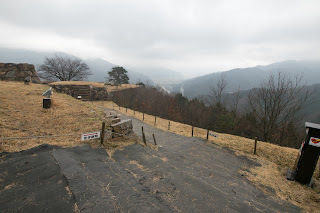 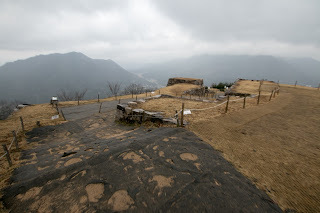 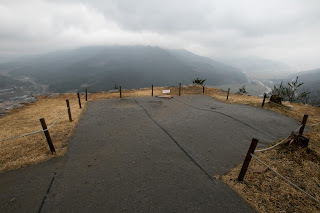 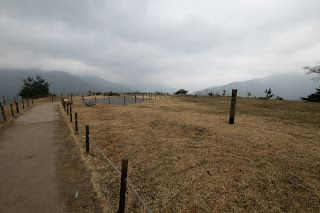 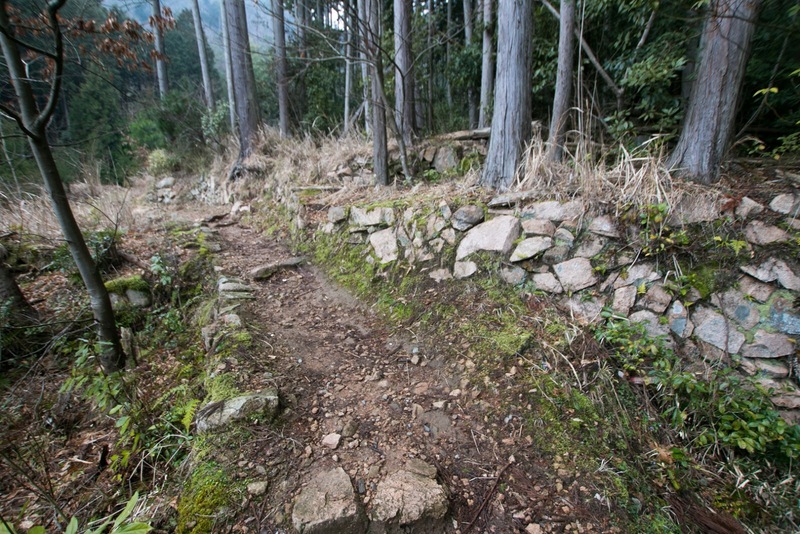 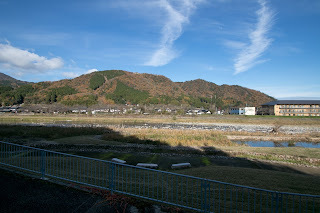 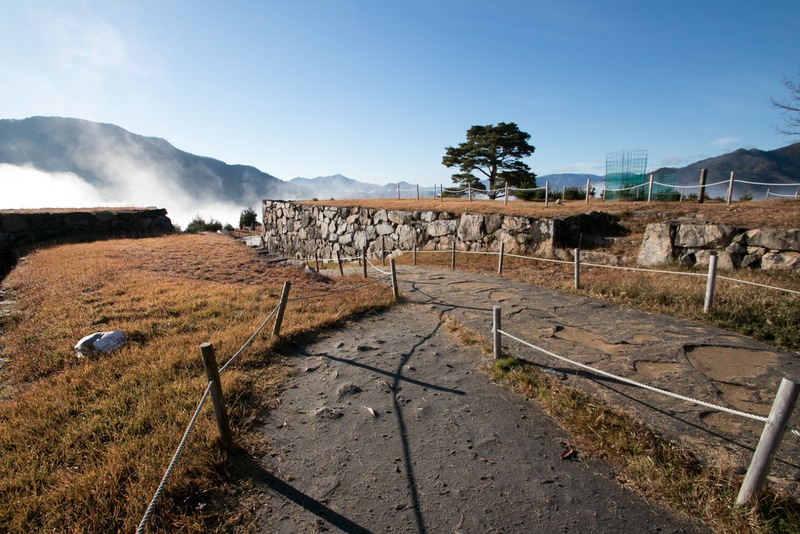 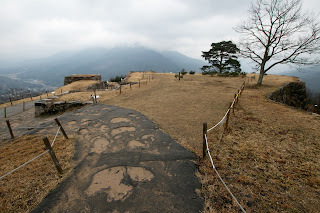 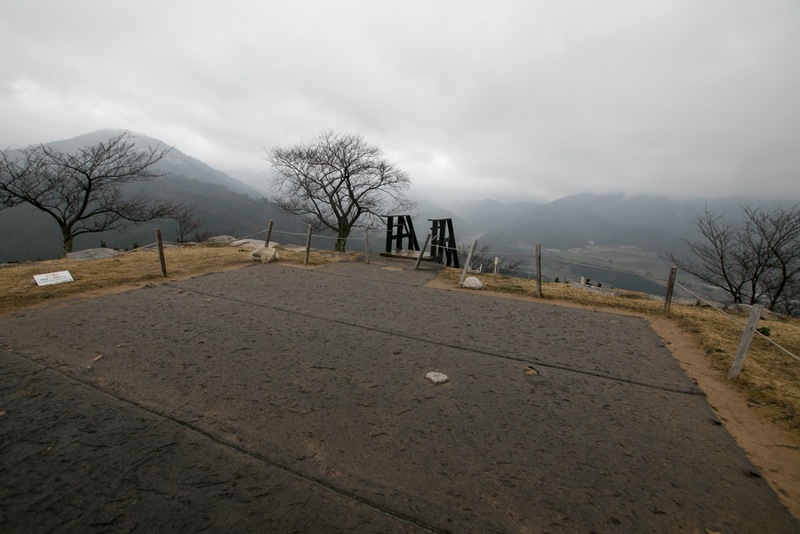 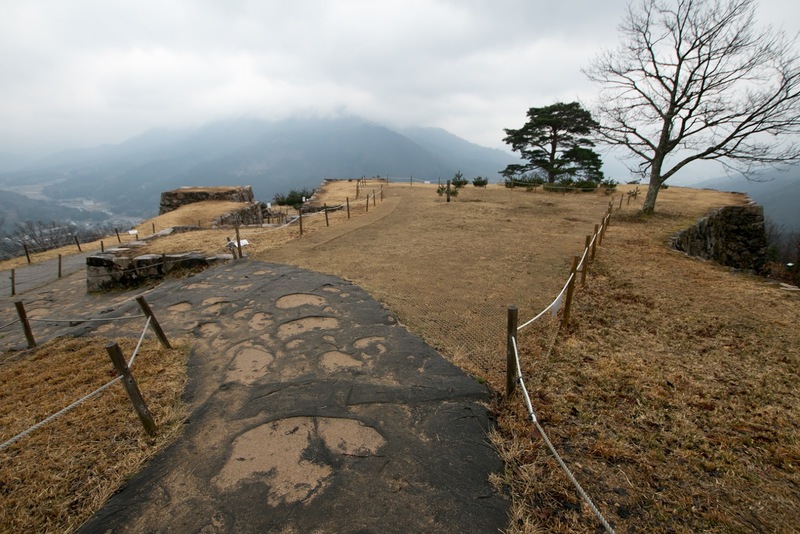 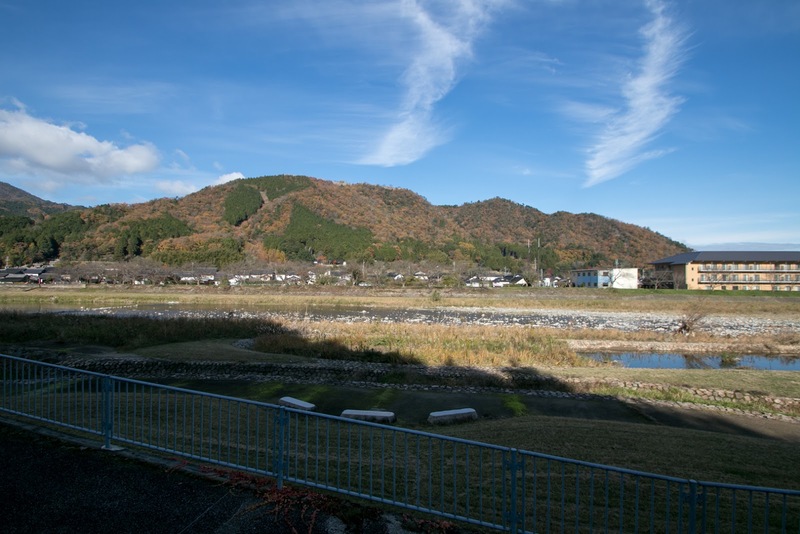 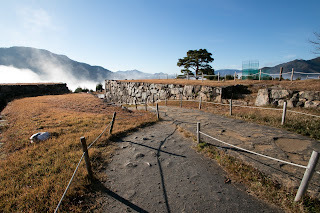 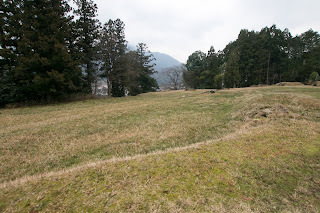 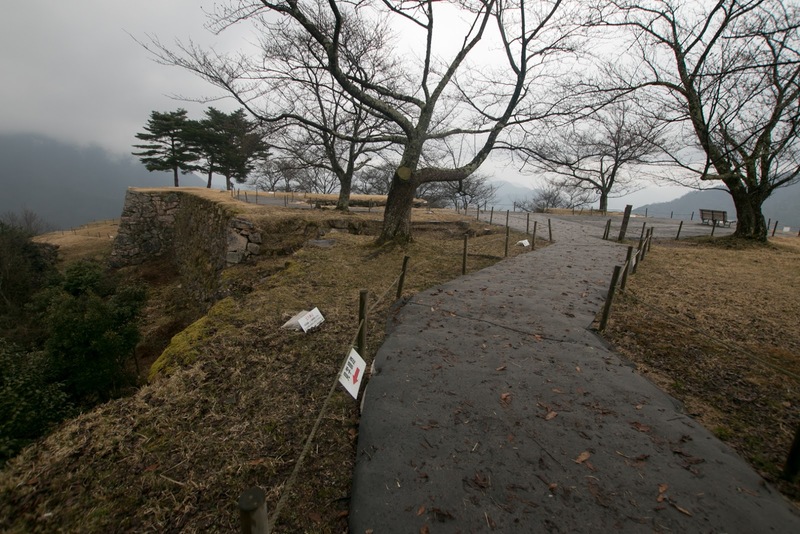 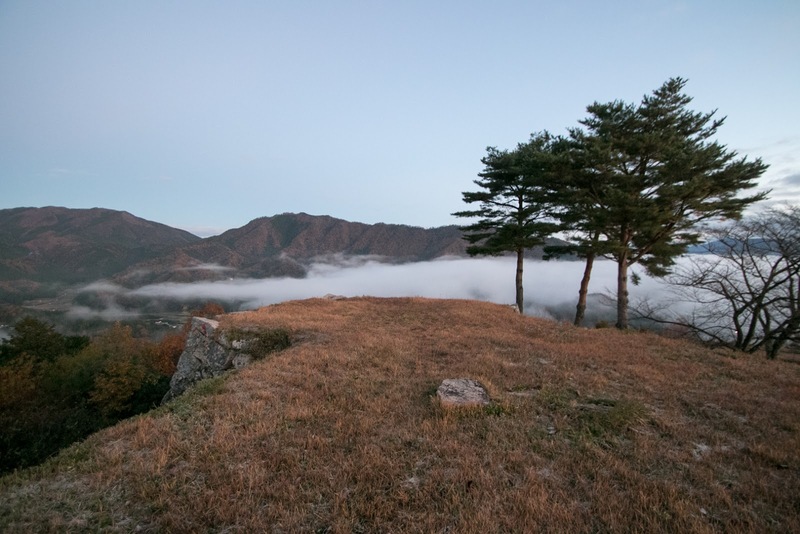 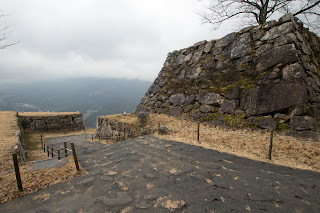 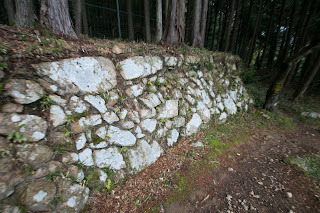 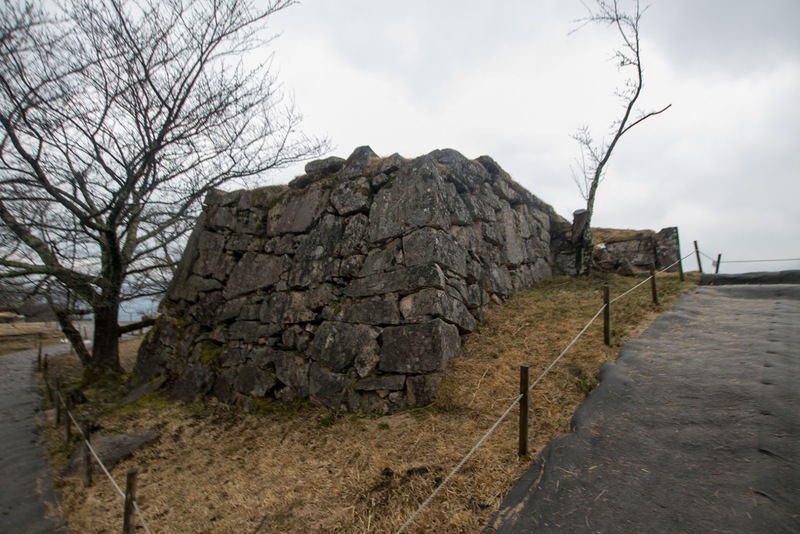 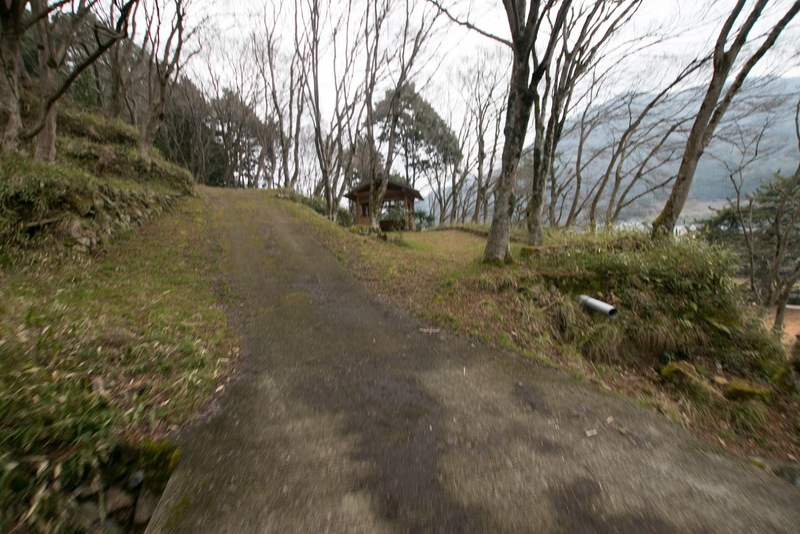 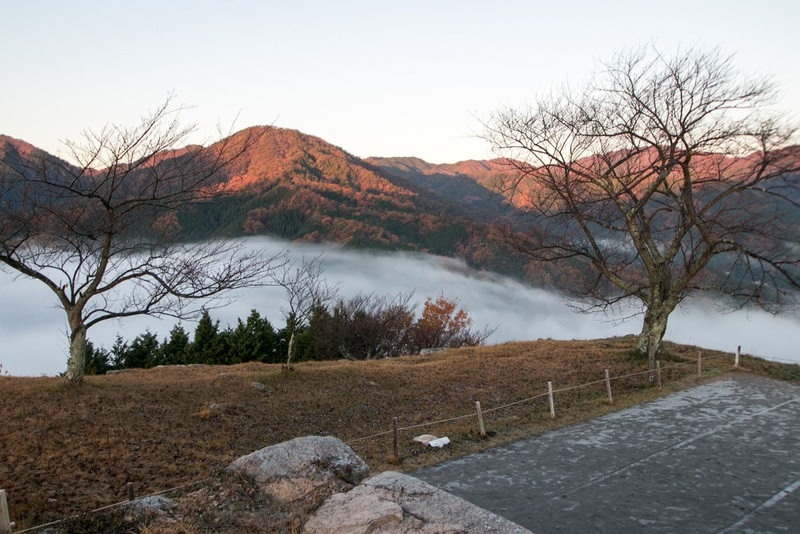 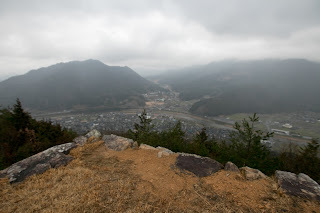 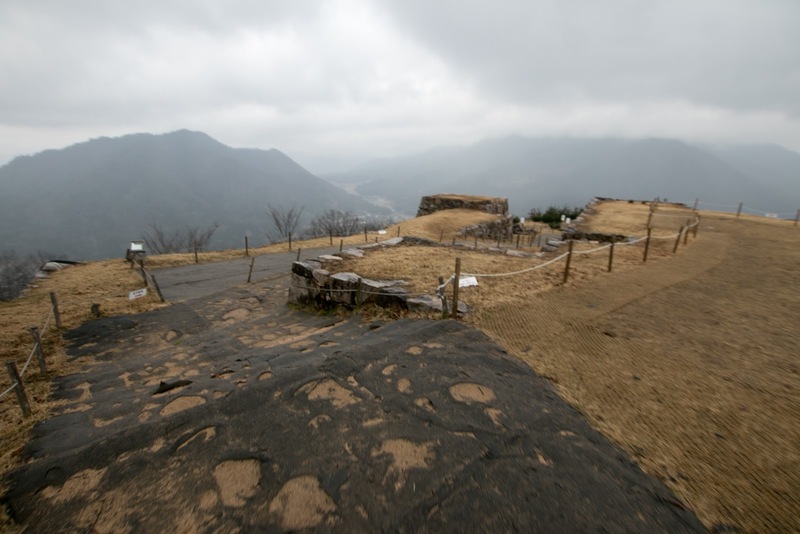 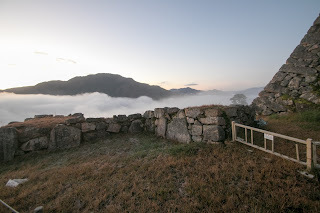 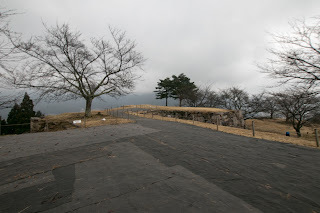 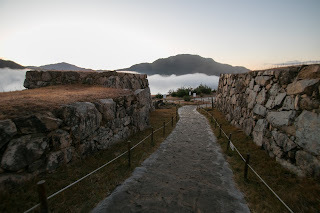 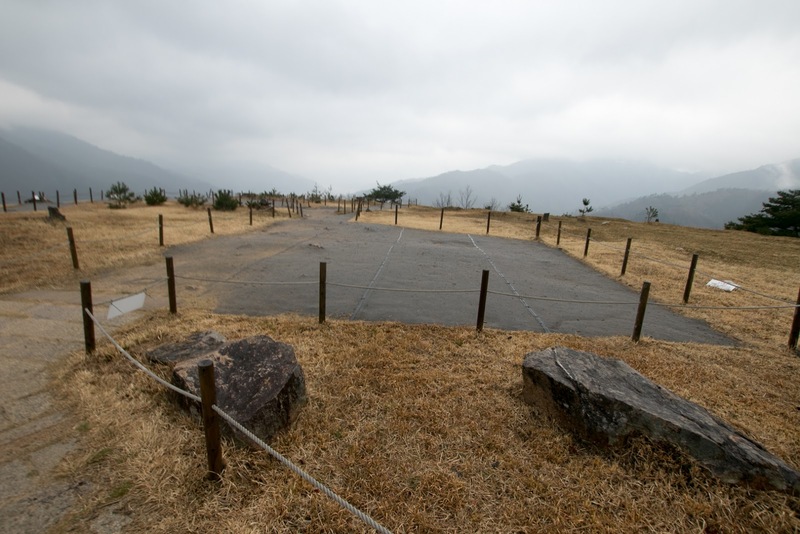 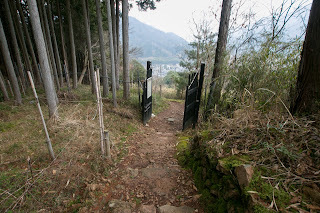 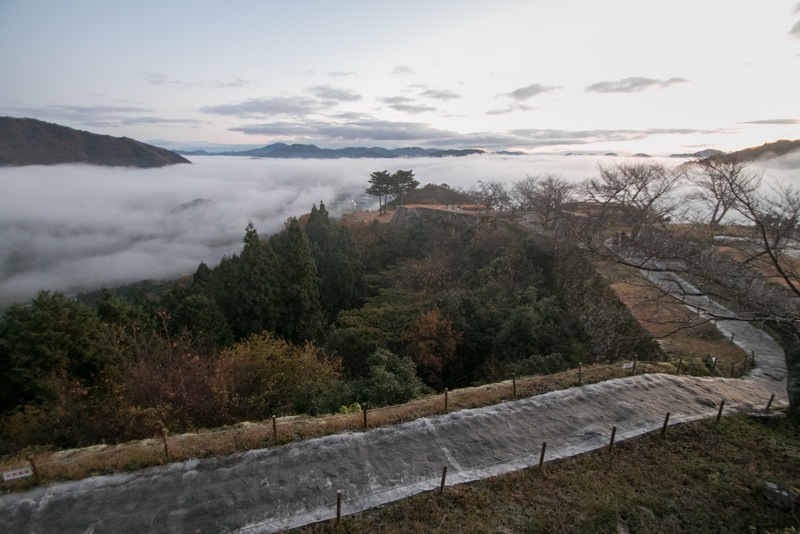 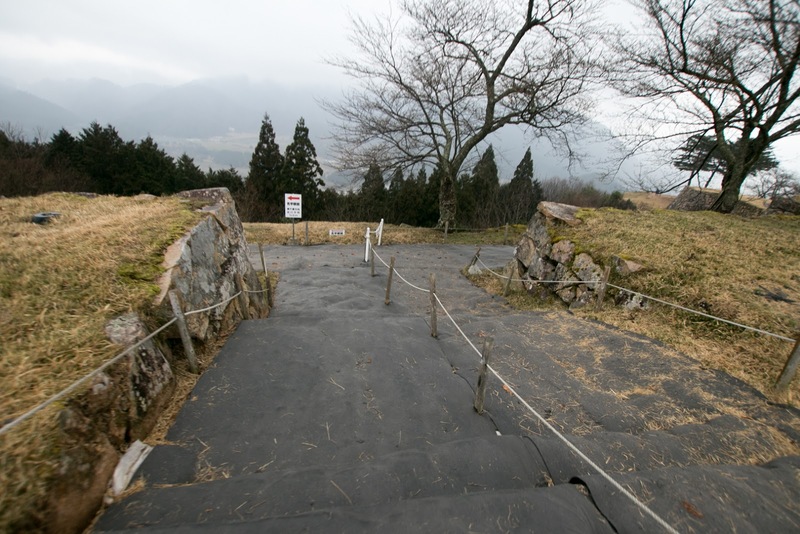 Concerning Takeda castle, Hirohide Akamatsu once belonged to Mitsunari side, but after the battle he changed to Tokugawa side and attacked Tottori castle (Tottori prefecture). 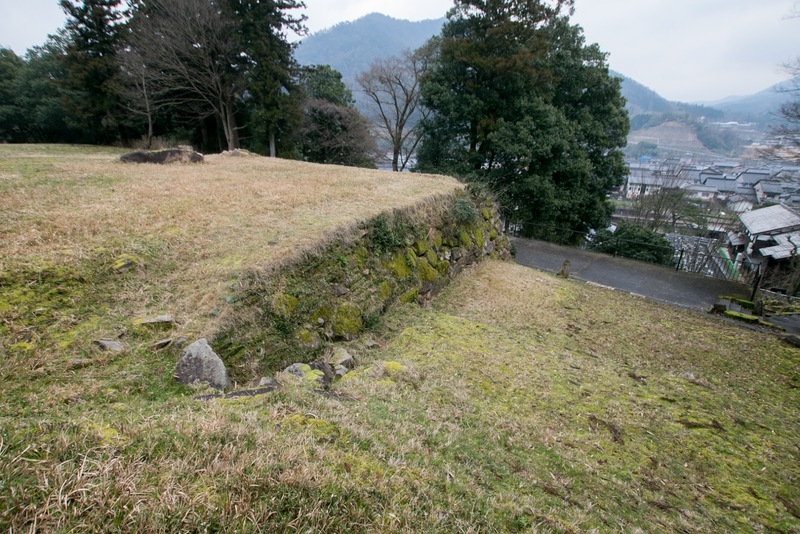 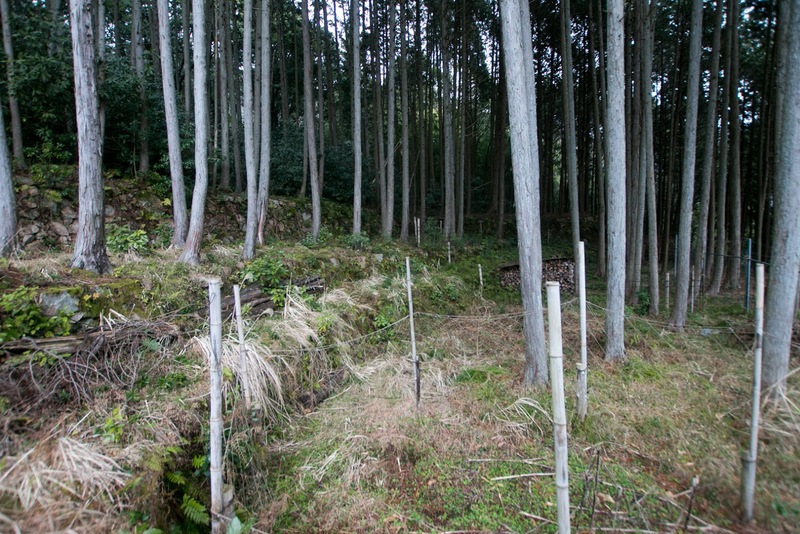 But accused by burning of town at siege, he was forced to suicide and Akamatsu clan was extinguished. 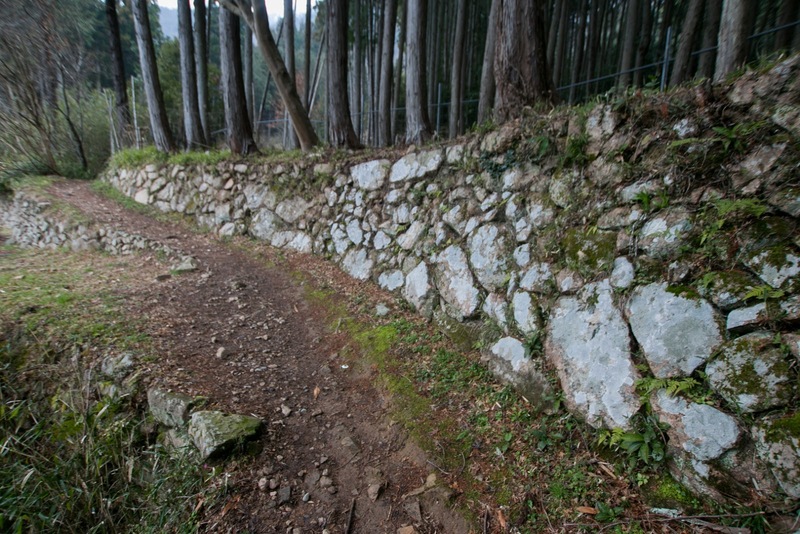 Takeda castle was abolished and all buildings were broken at this point, but stone walls were kept for some unknown reason. 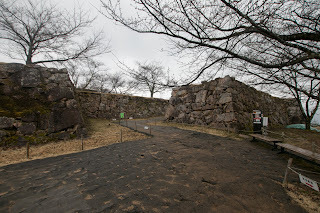 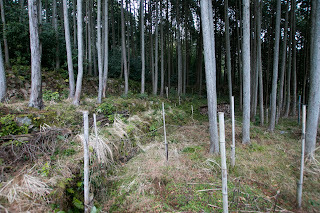 Subsequent to World War 2, by being utilized in some pictures, the site of castle became famous and now many people visits the site. 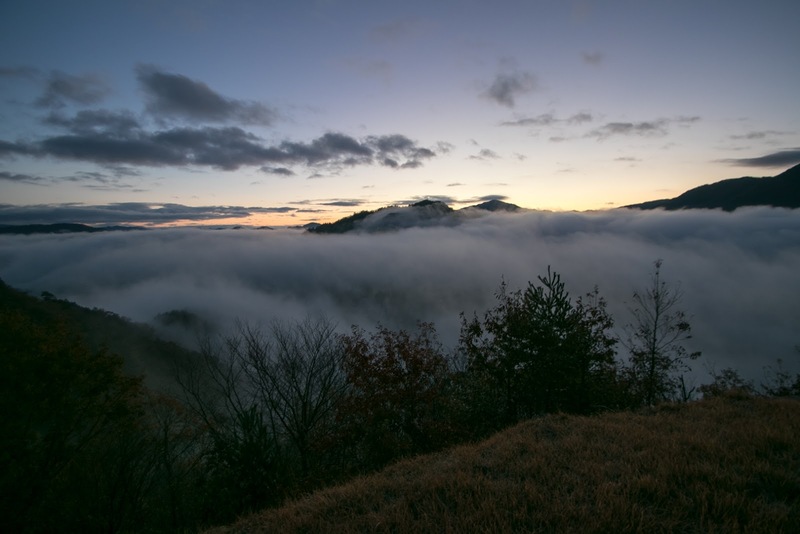 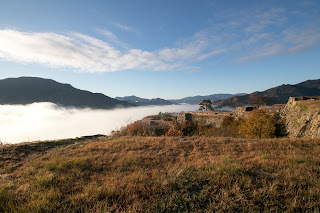 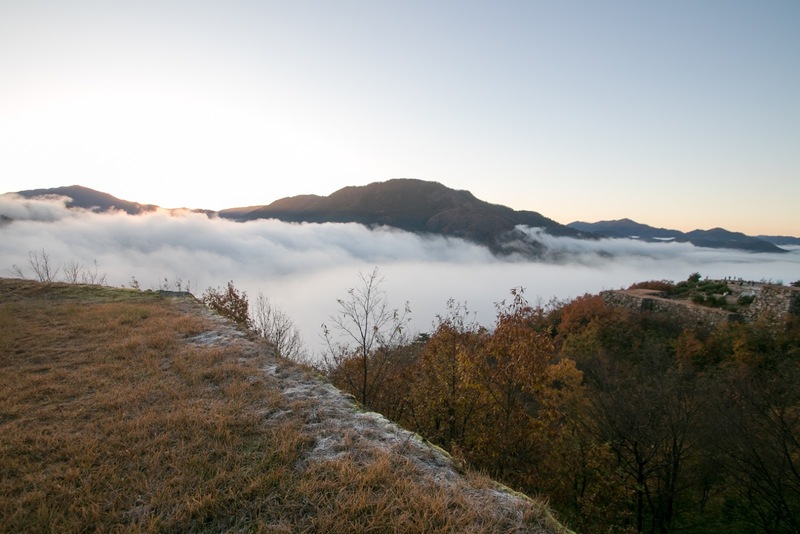 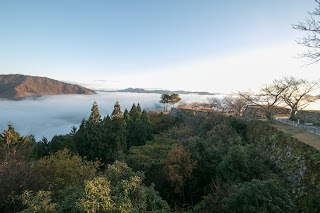 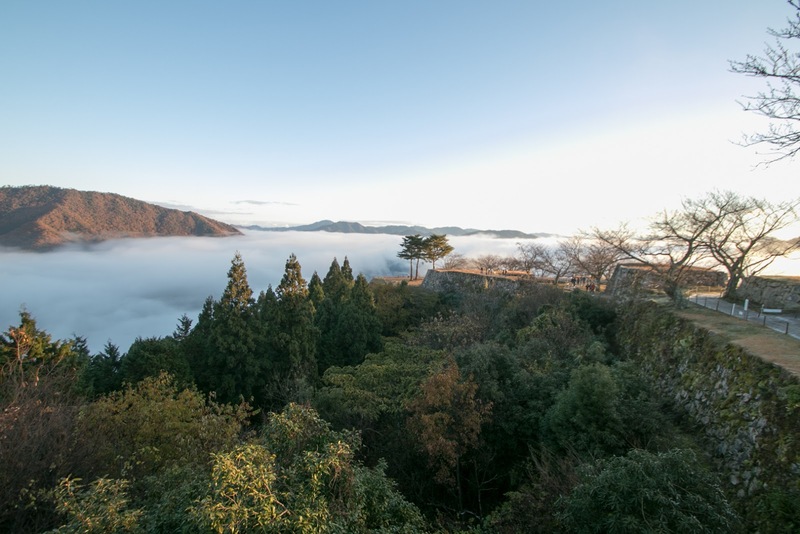 If condition allows beautiful scenery of the castle floating clouds or mists, and now the castle is famous as "Castle in the sky". 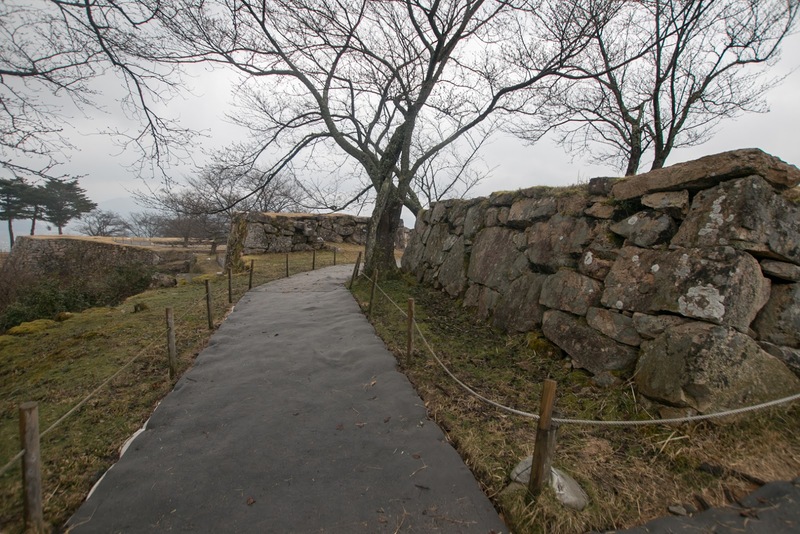 Today due to the damage to ground by numerous visitors and some accident, entrance into central area is currently limited. 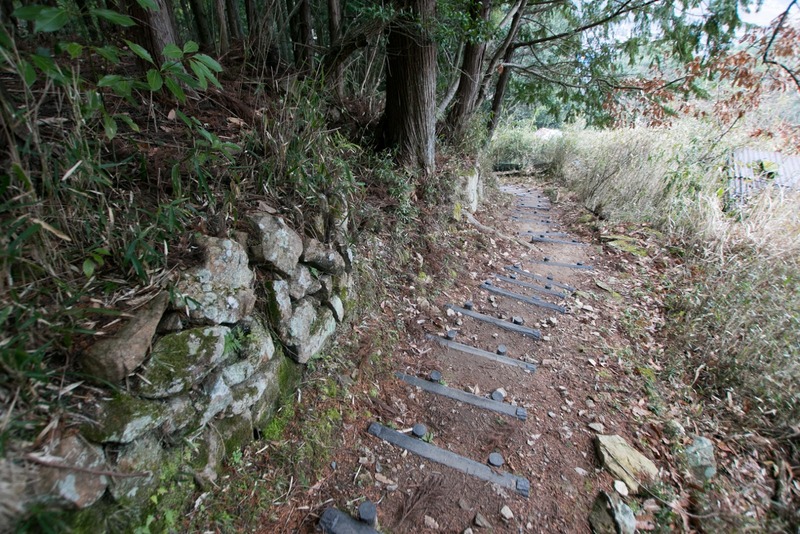 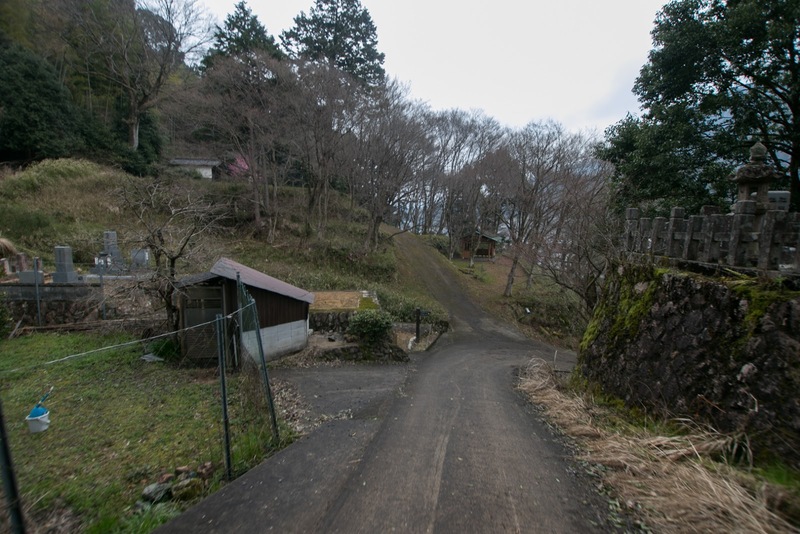 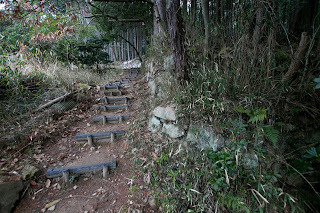 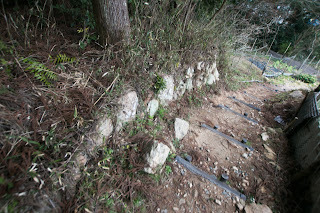 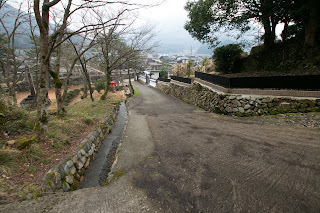 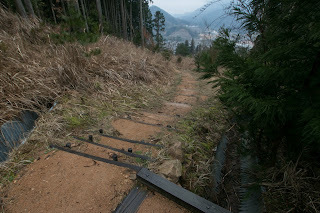 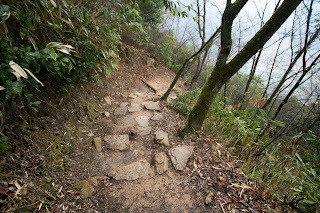 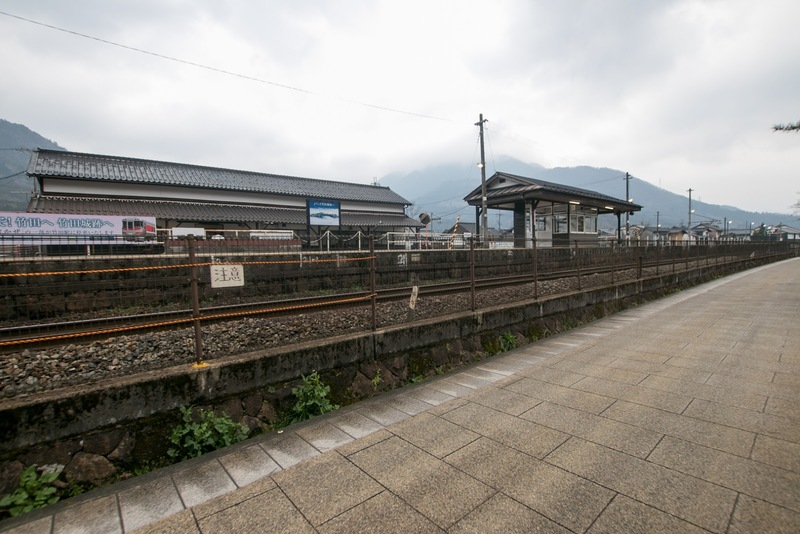 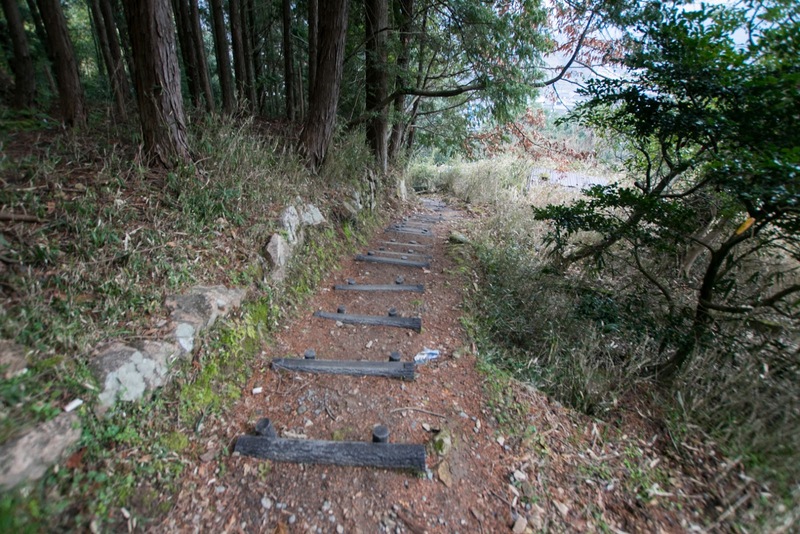 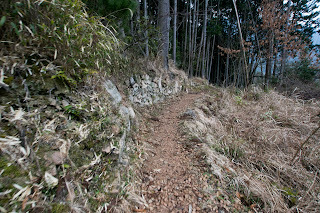 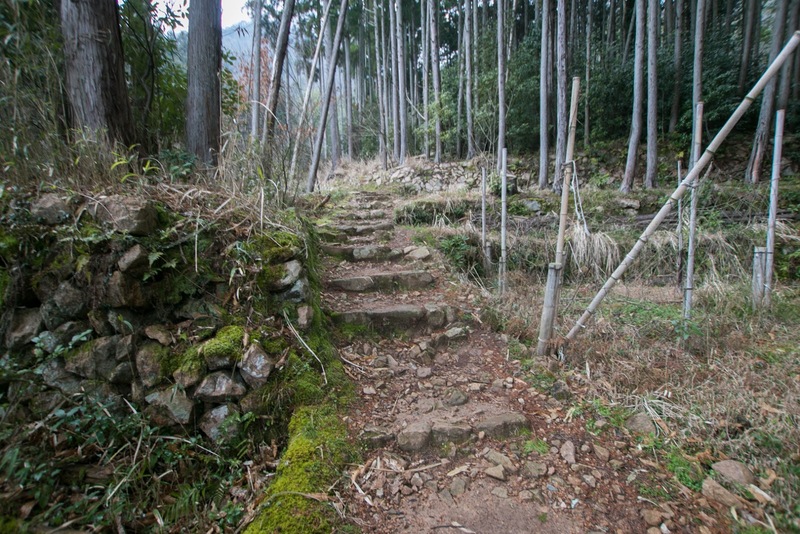 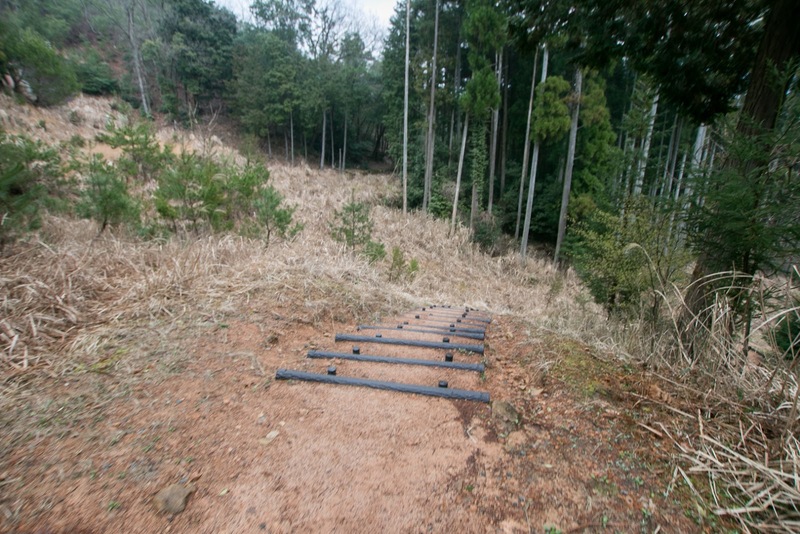 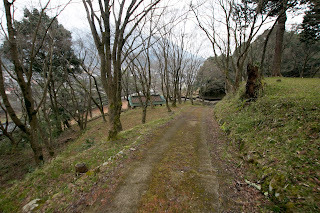 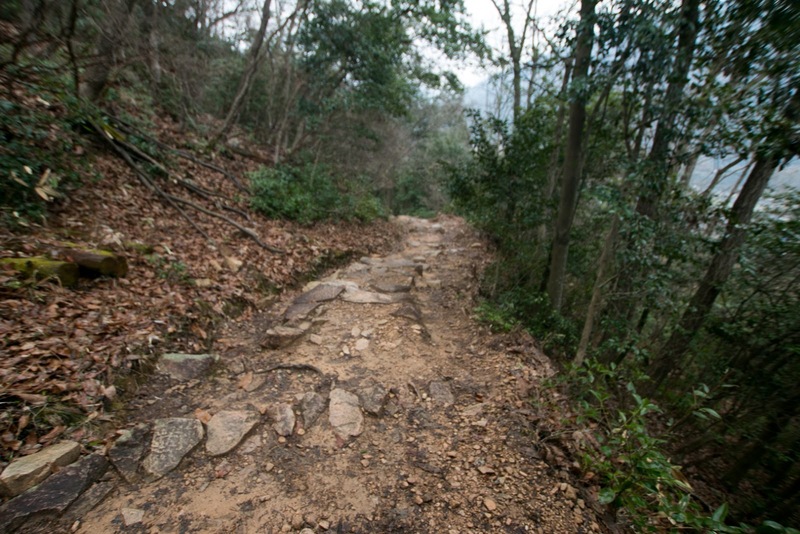 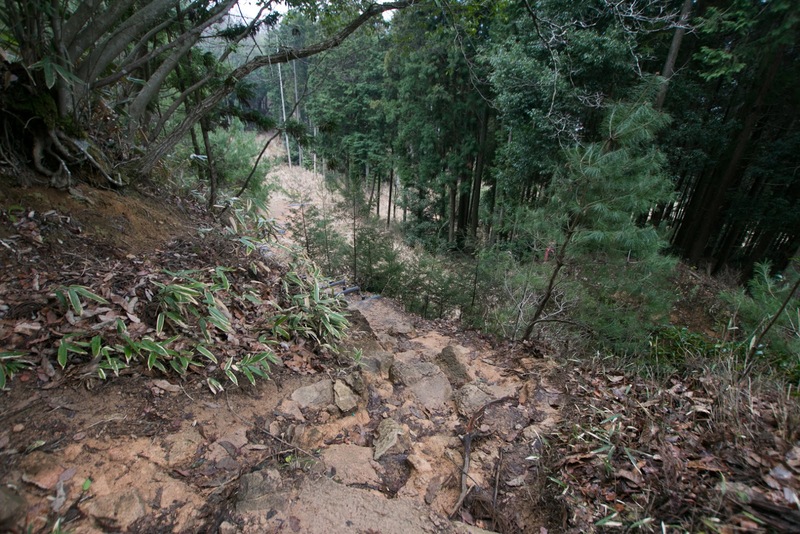 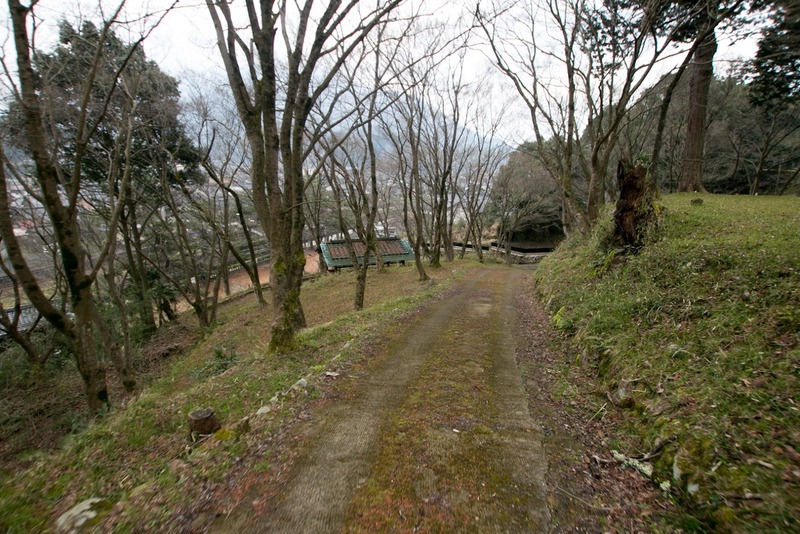 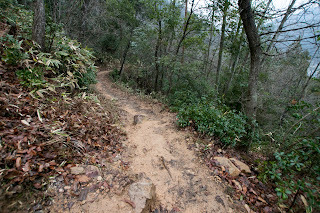 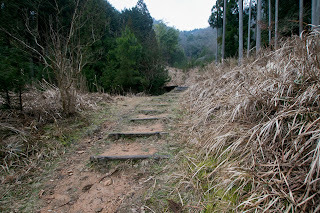 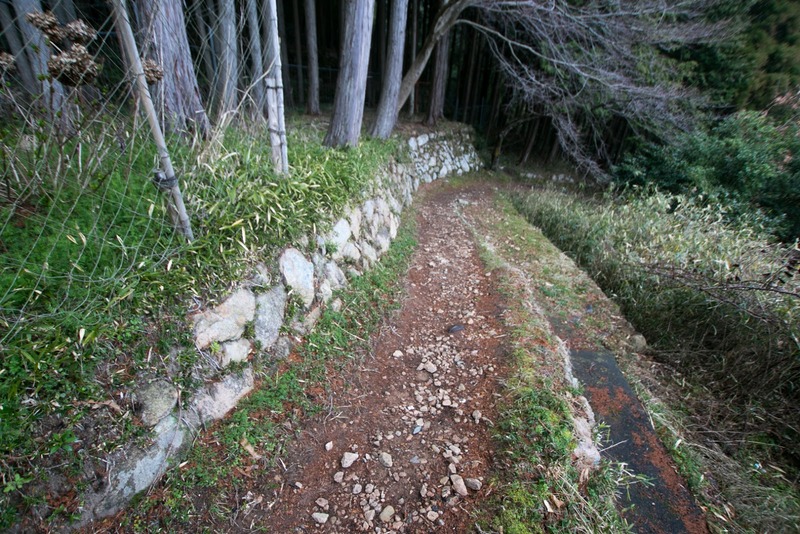 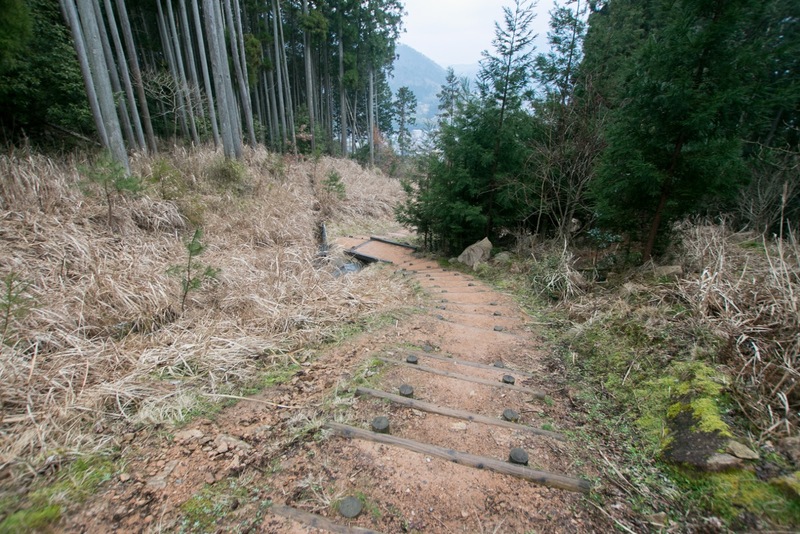 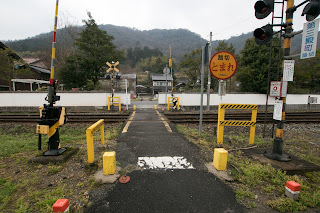 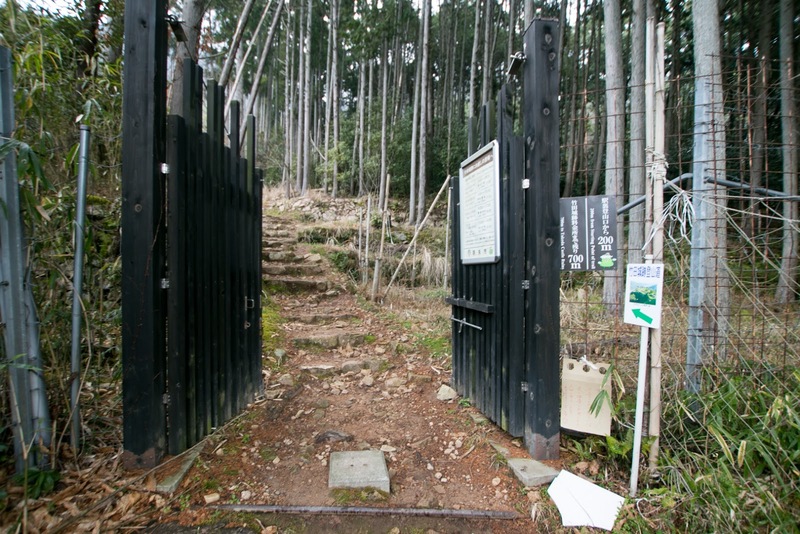 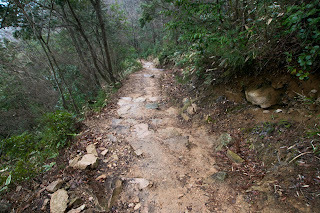 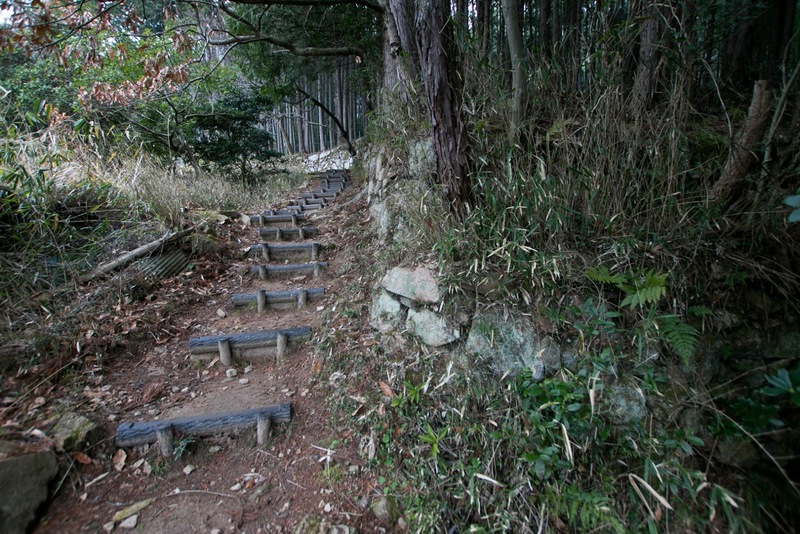 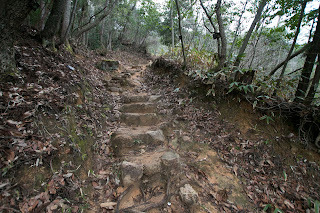 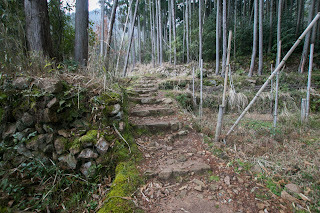 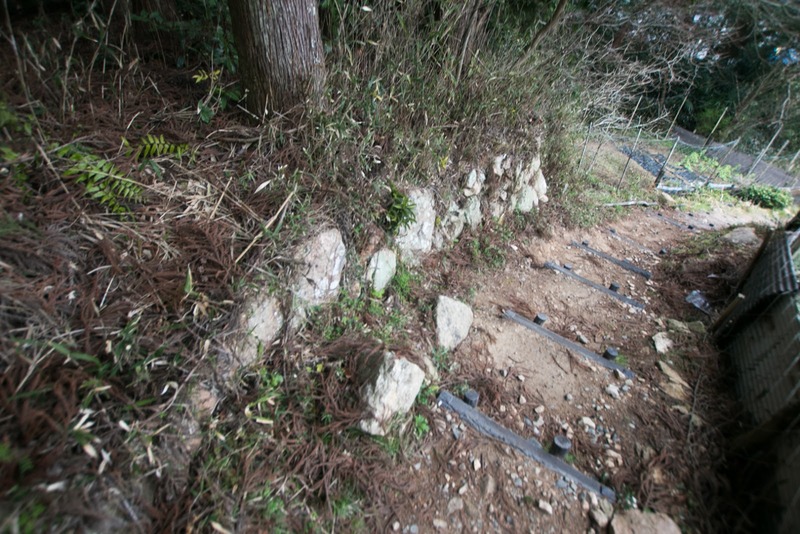 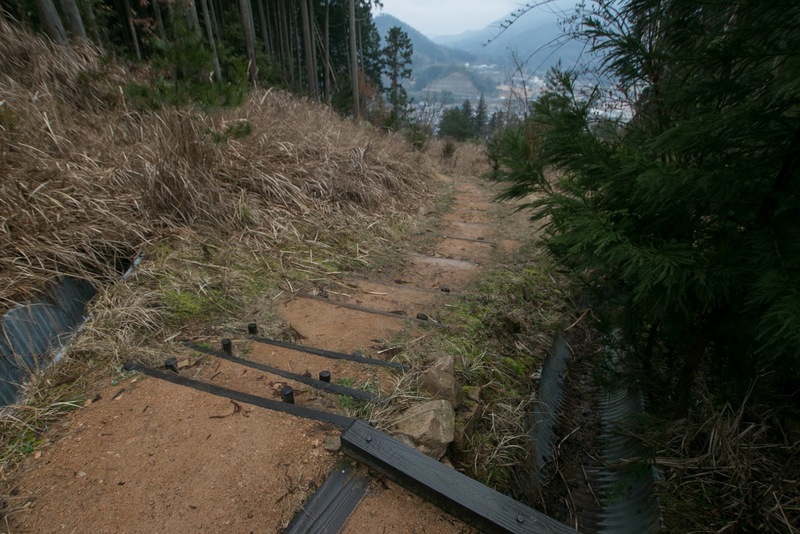 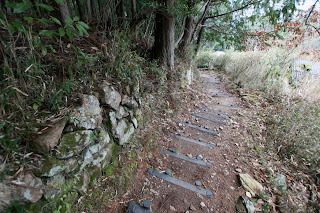 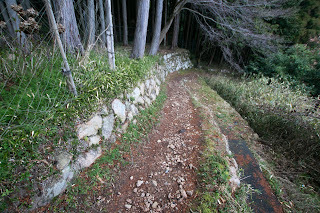 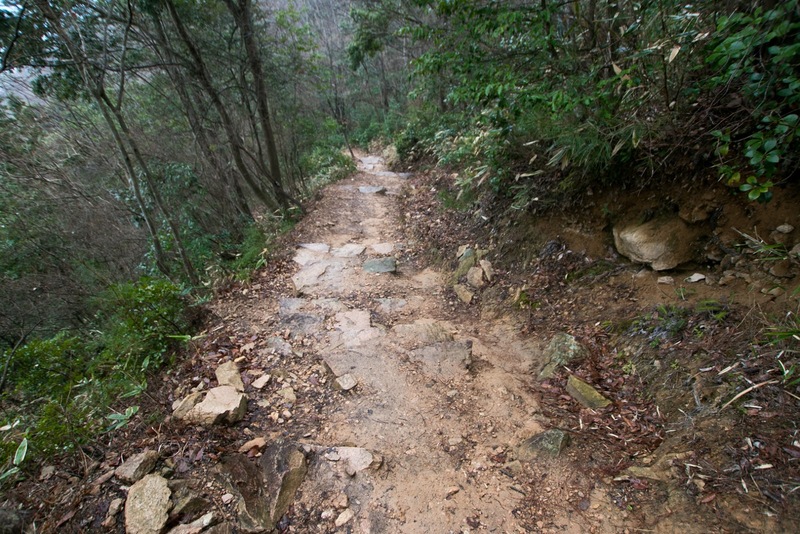 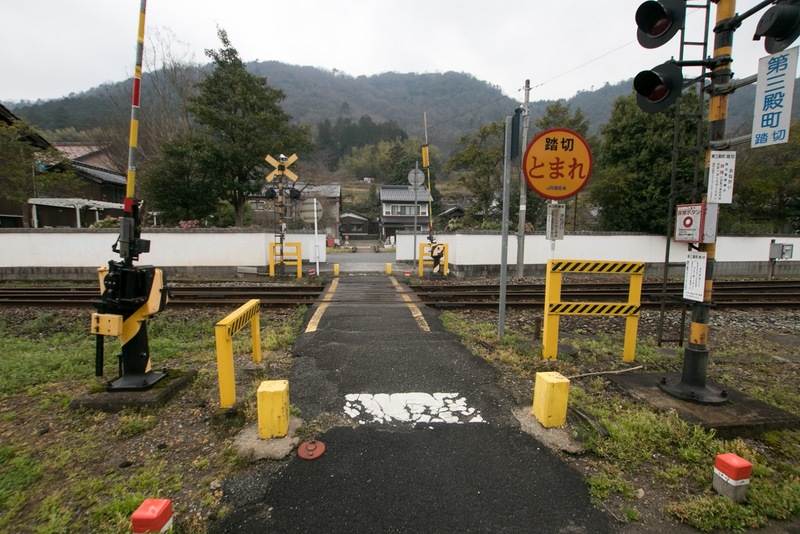 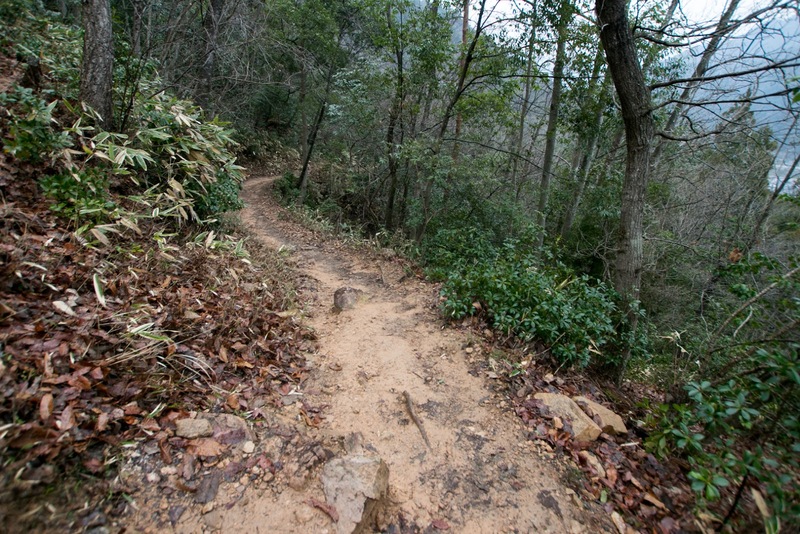 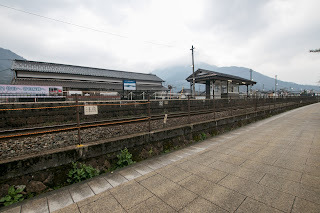 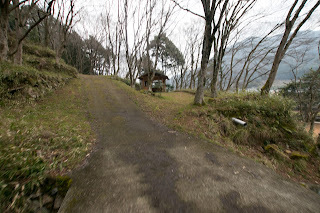 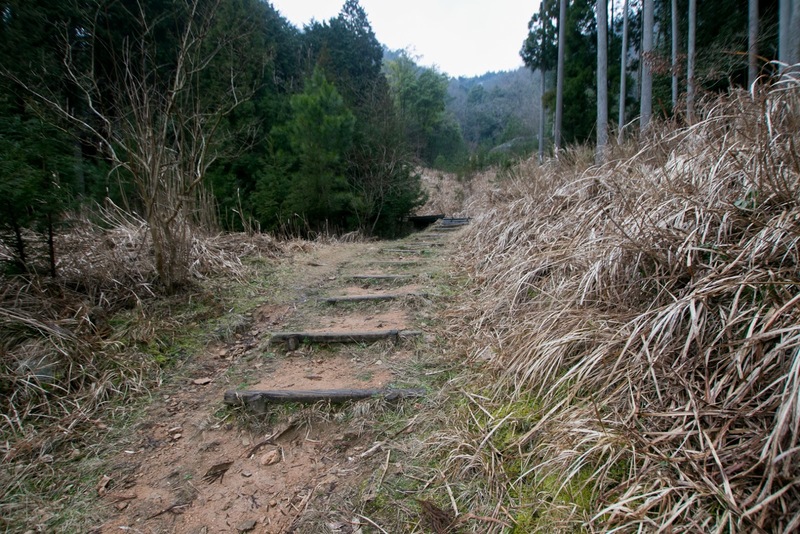 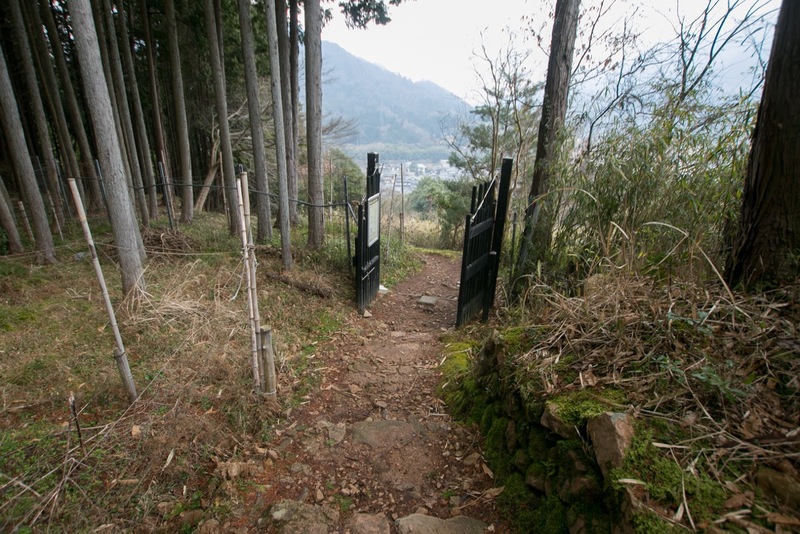 60 minutes walk from JR West Bantan-sen line Takeda station but climbing road is quite tough. 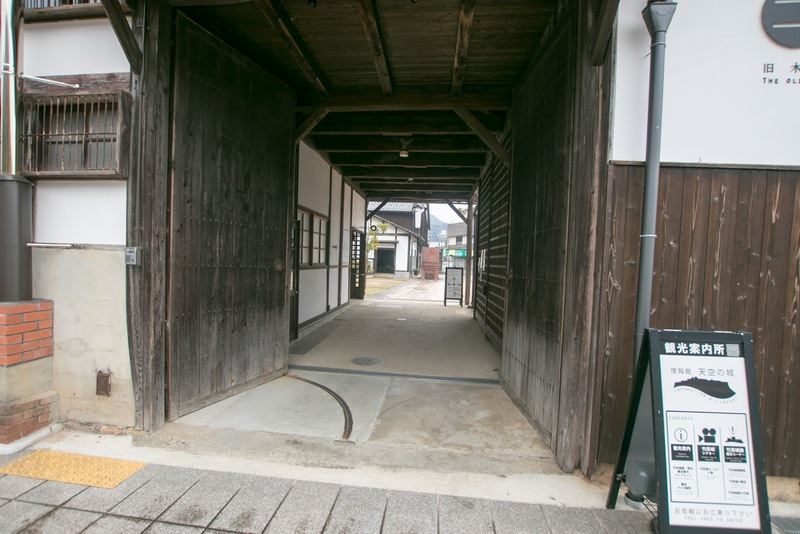 15 minutes drive from Bantan-Renraku toll road Wadayama interchange to "Yamajiro-no-Sato" resthouse. Access bus connects between "Yamajiro-no-Sato" to the halfway of climbing road. 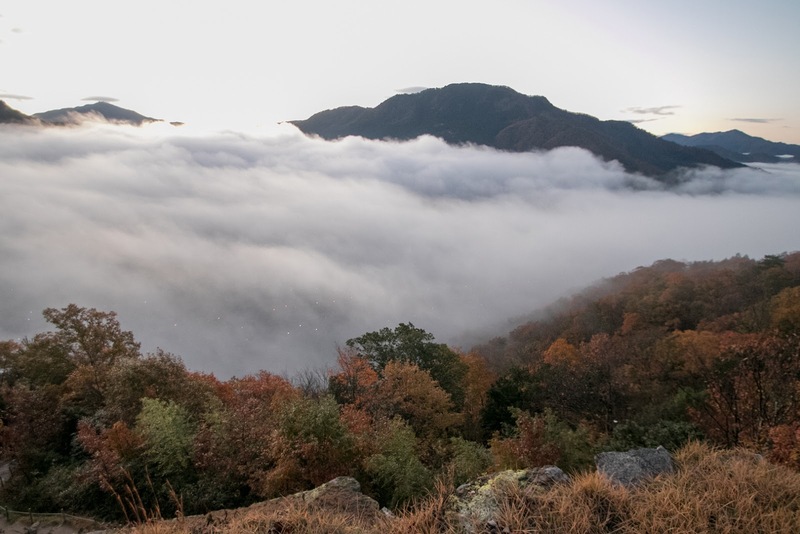 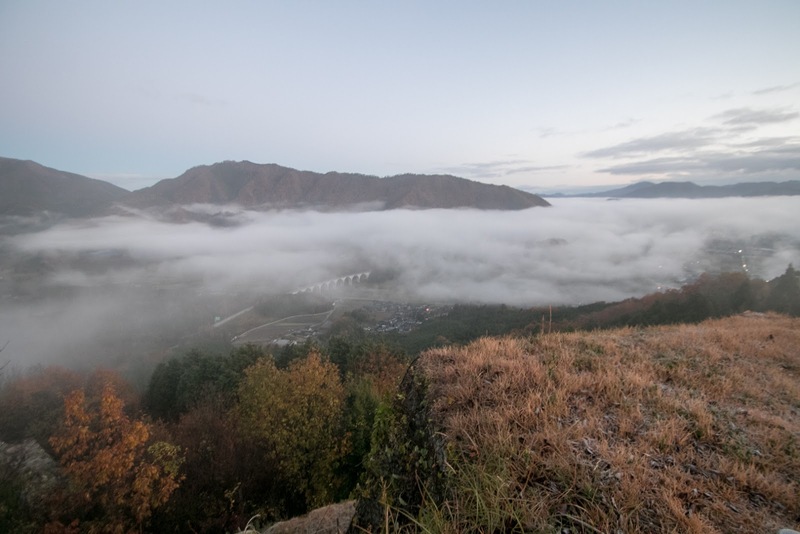 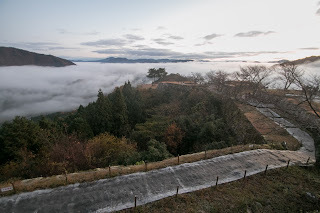 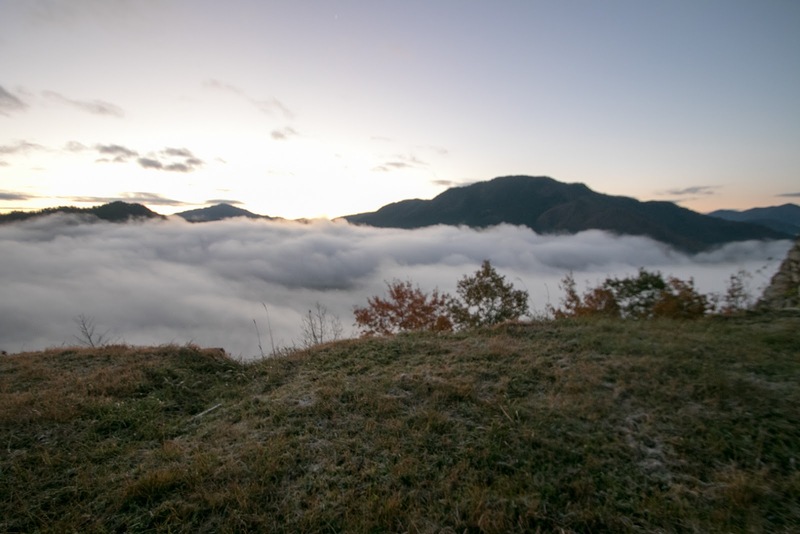 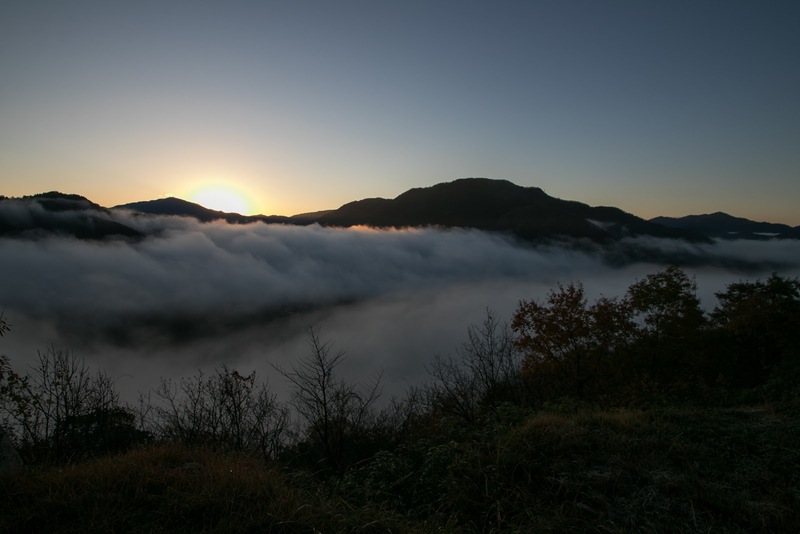 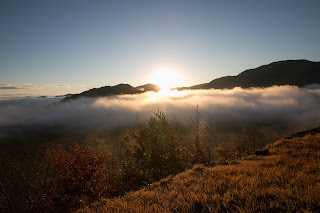 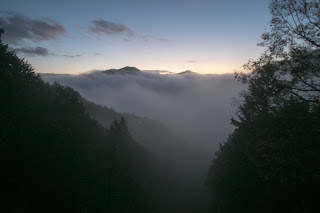 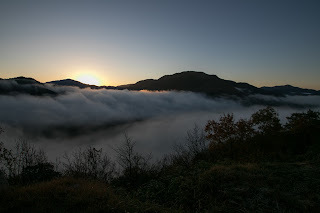 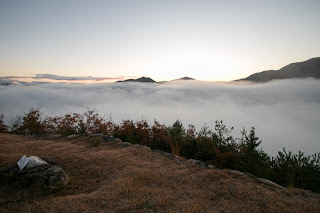 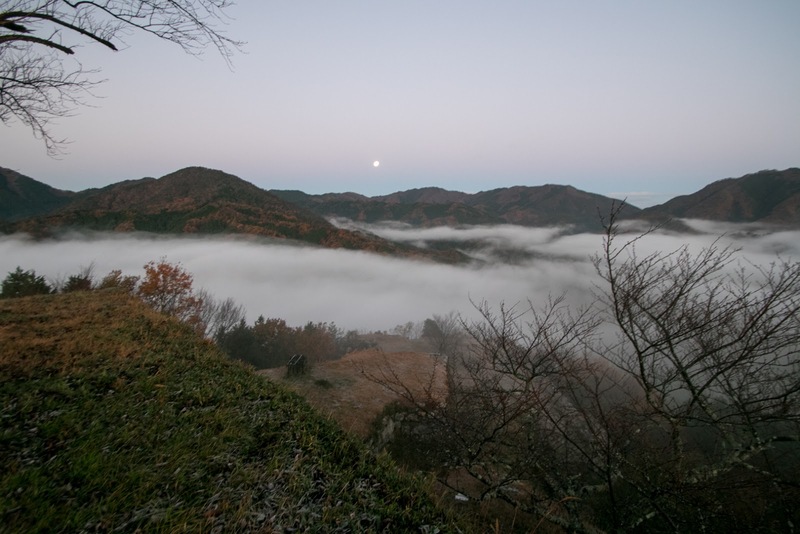 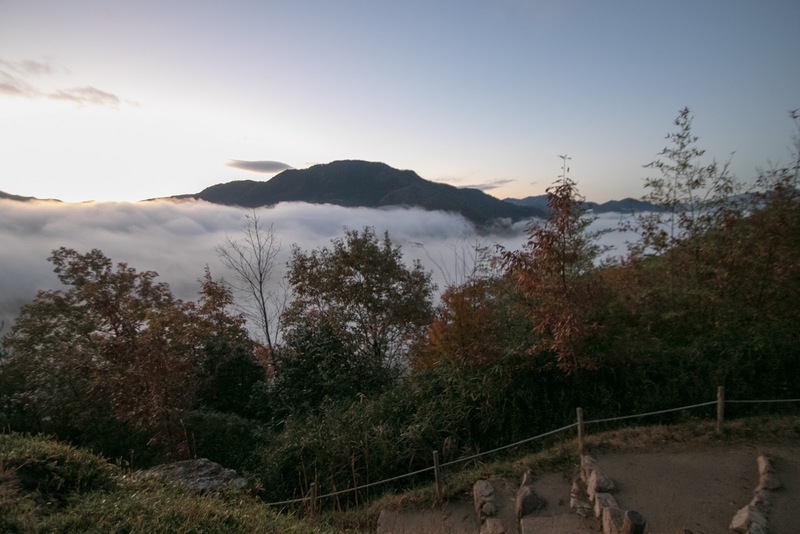 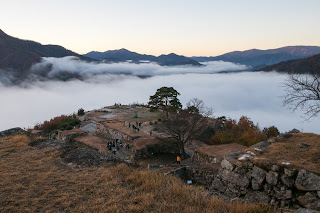 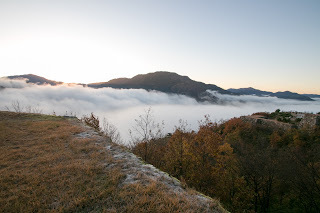 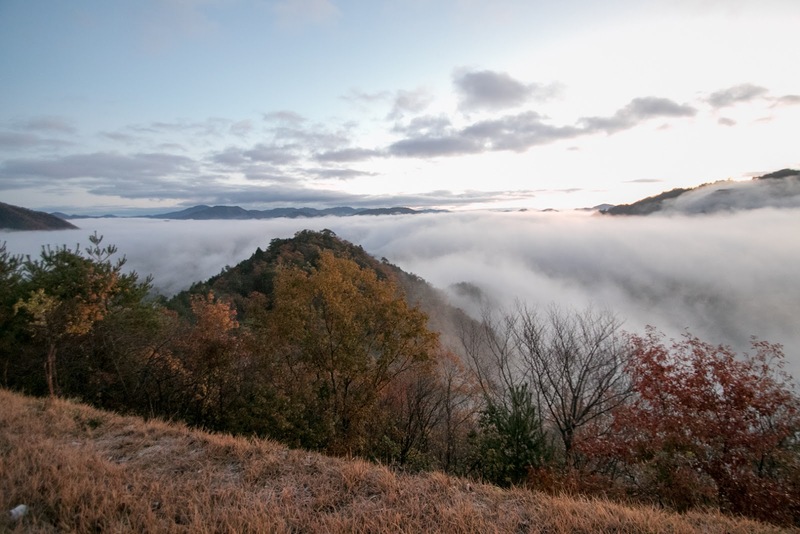 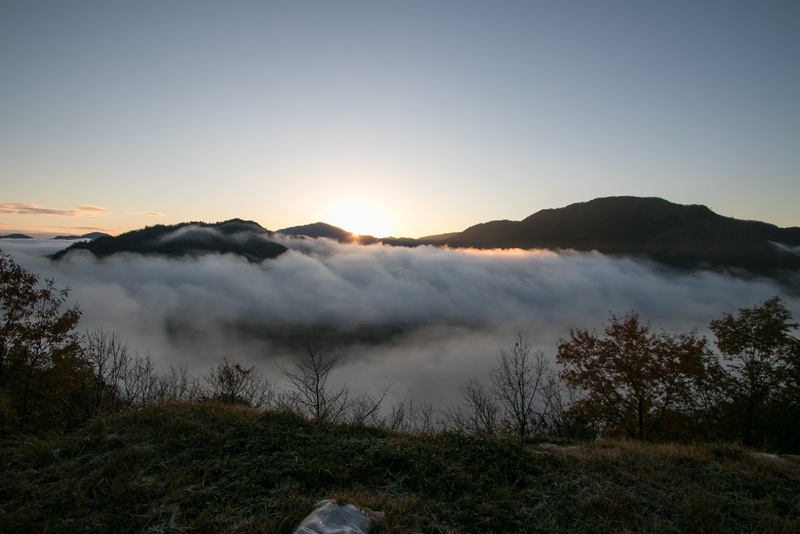 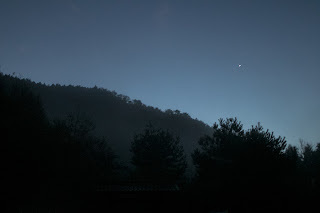 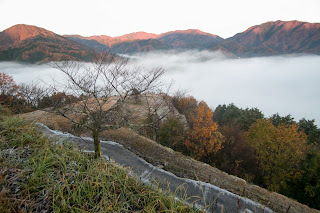 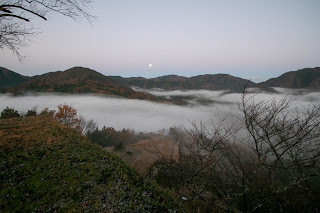 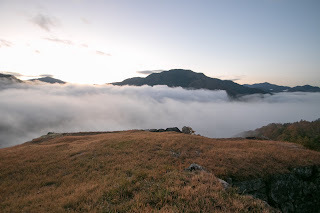 Sea of cloud might be seen on early morning of shiny day in autumn season but is uncertain. 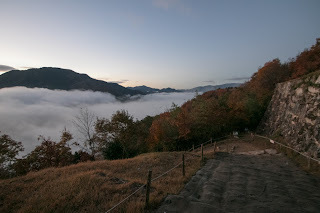 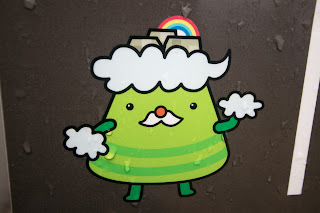 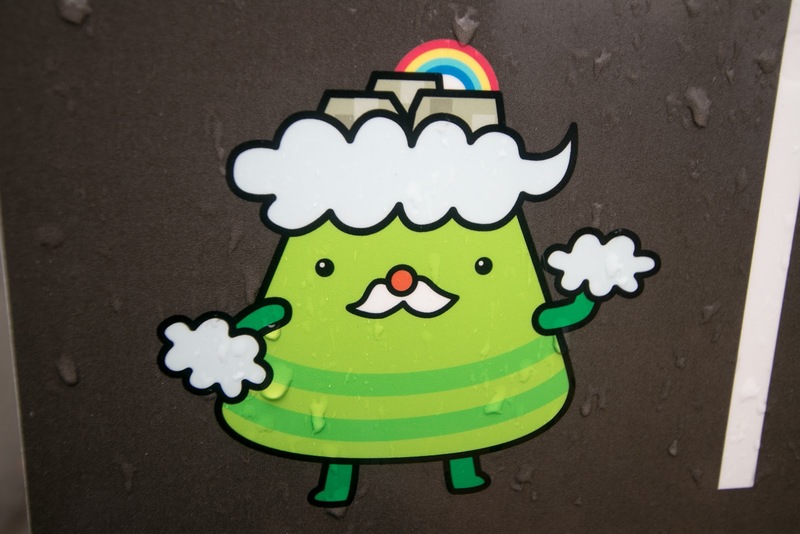 In autumn season connecting bus from hillside or "Yamajiro-no-Sato" to halfway is operated in early morning, but it is necessary to winter clothing and walk about 20 minutes in the dark.